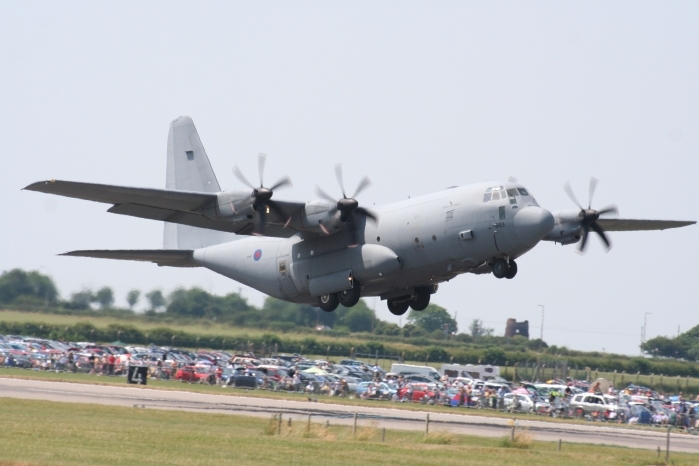 Waddington International Air Show held at Royal Air Force Waddington in Lincolnshire. 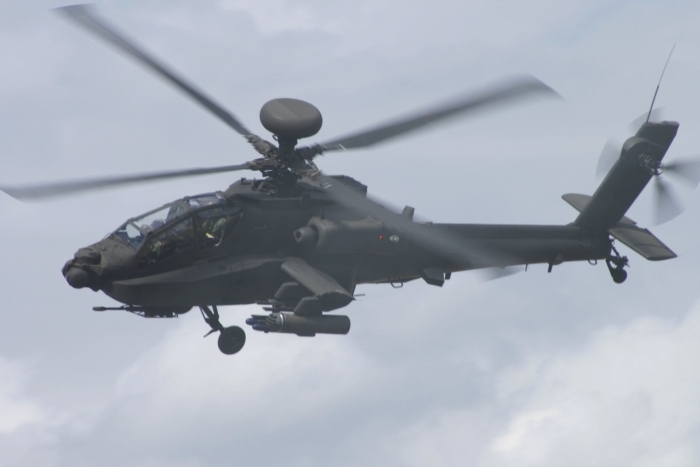 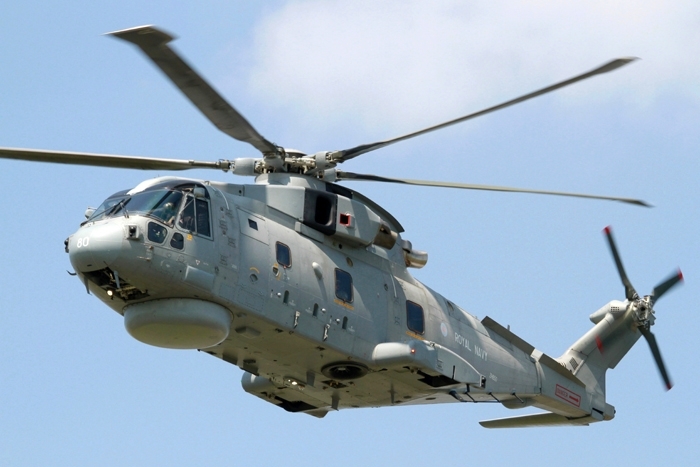 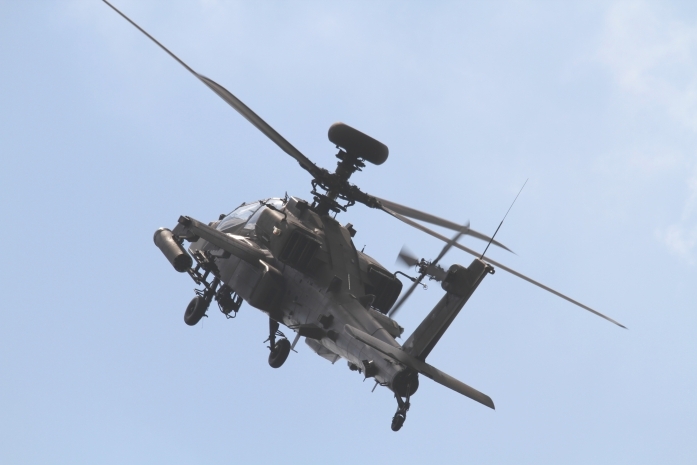 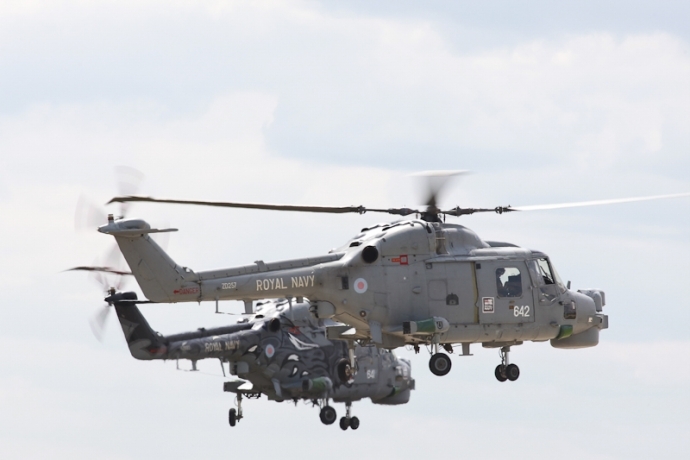 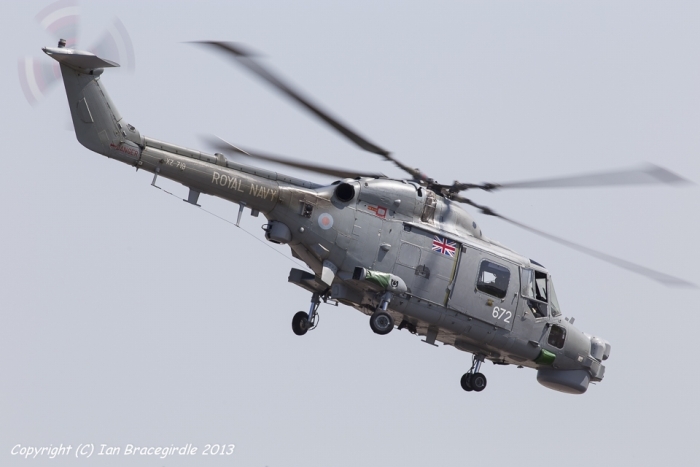 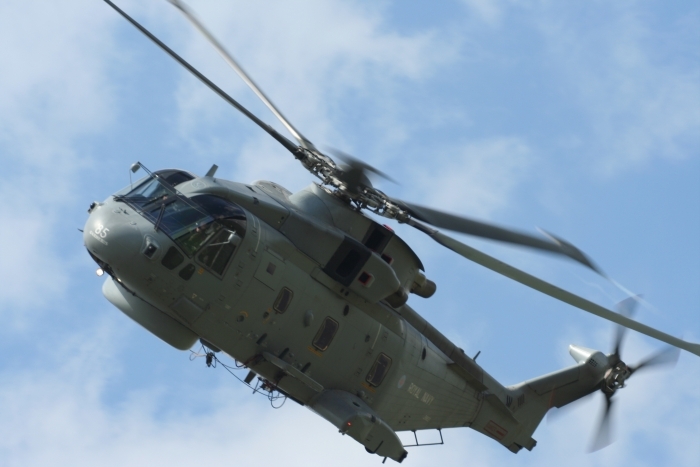 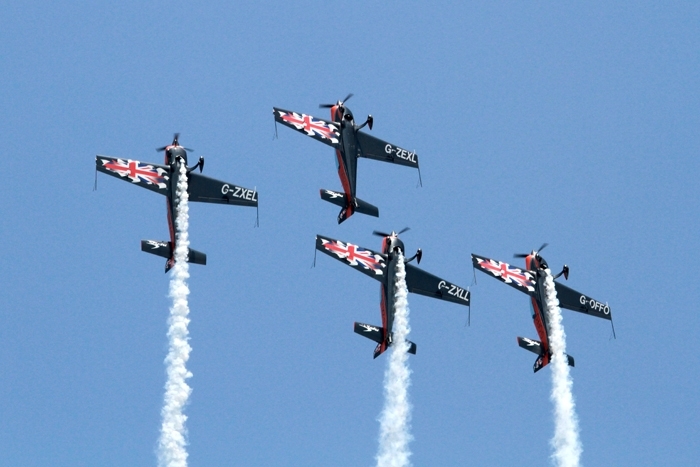 Considered by some to be the UK's top military air show. 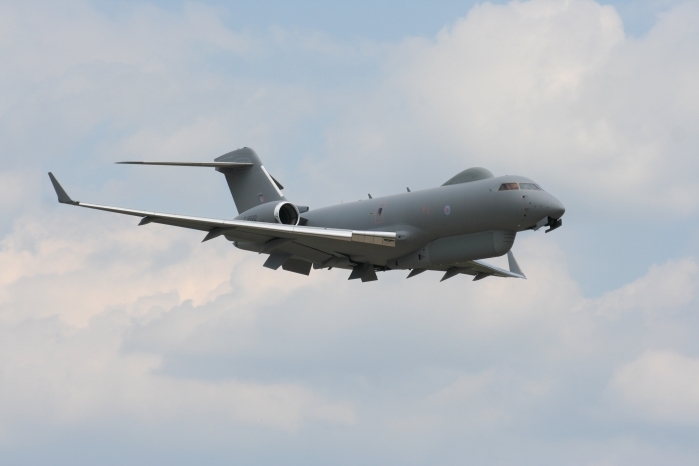 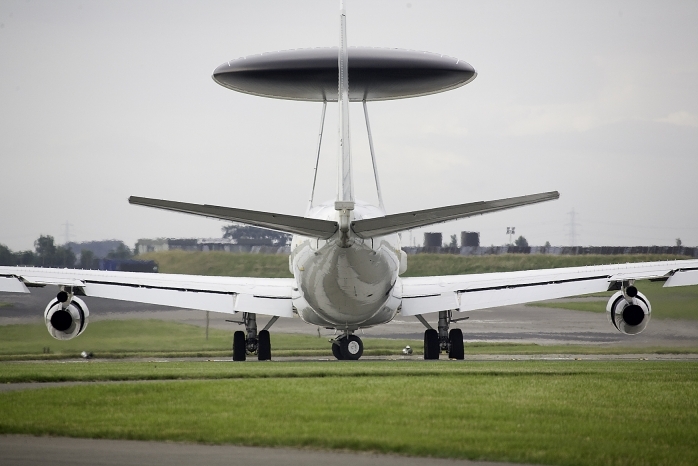 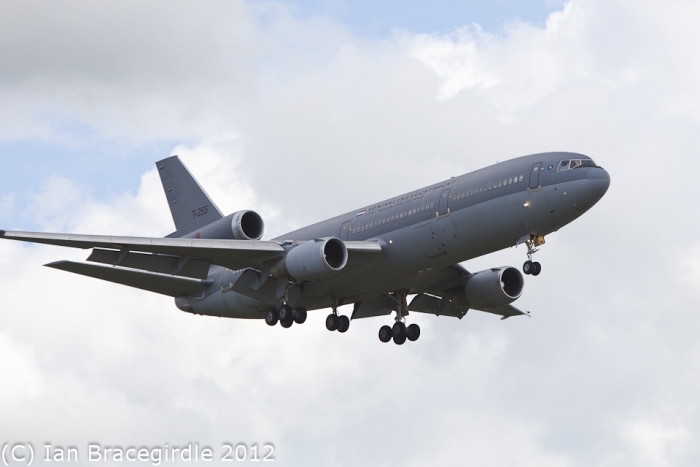 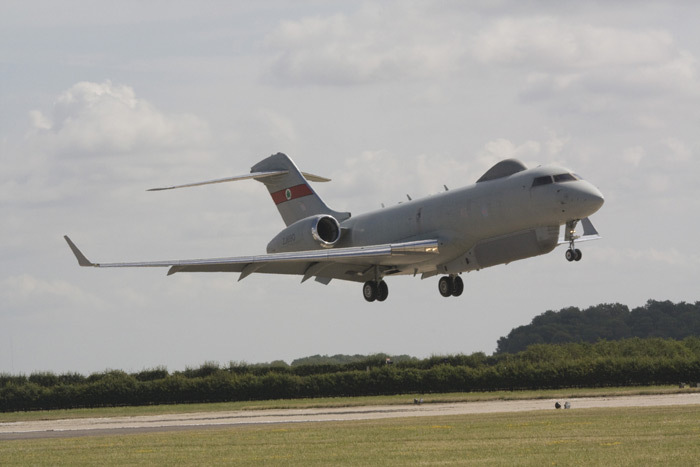 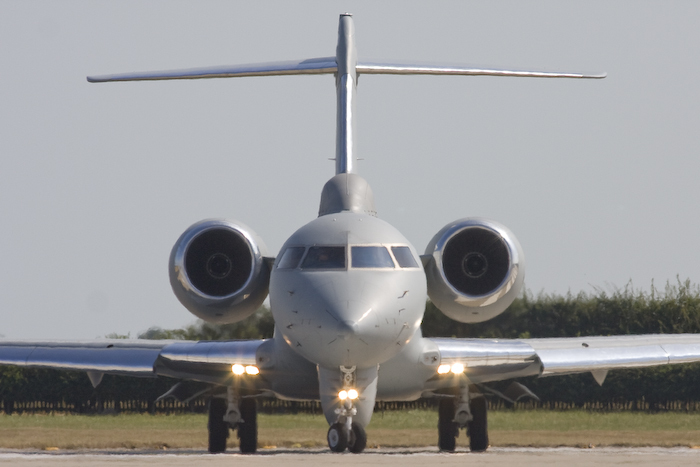 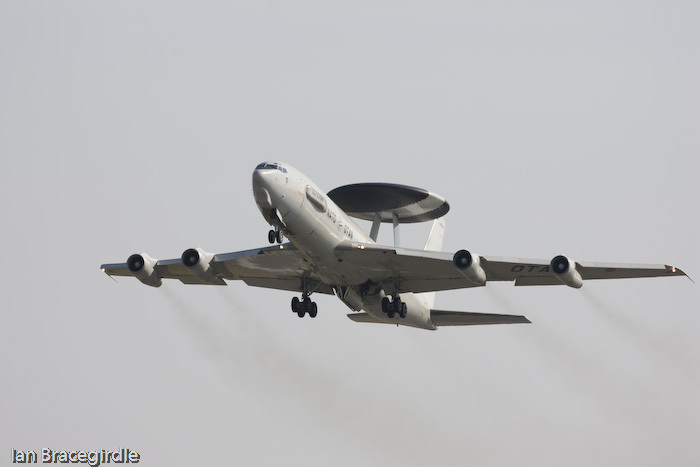 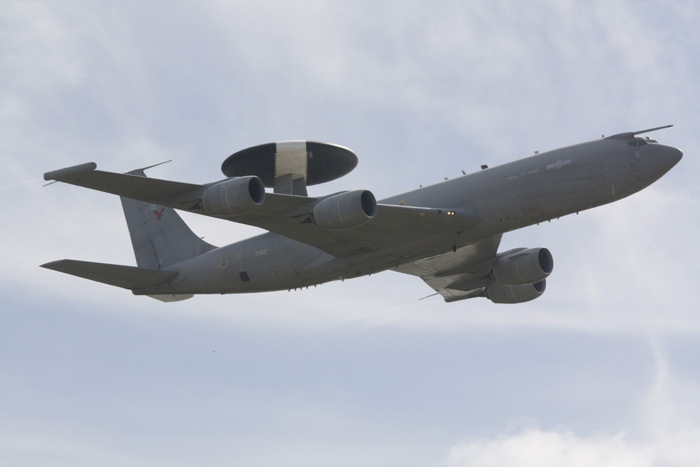 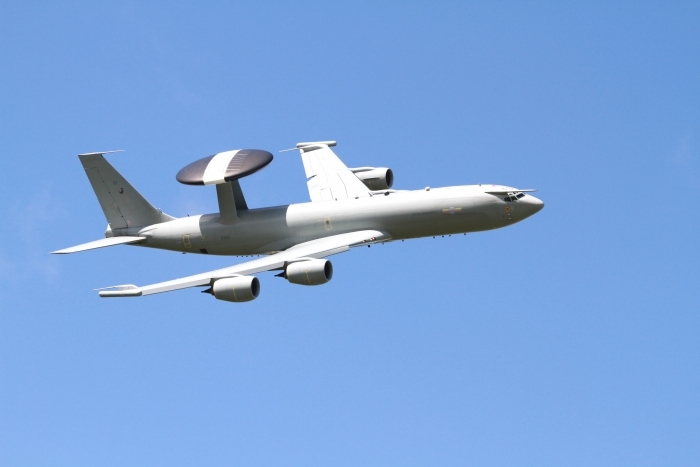 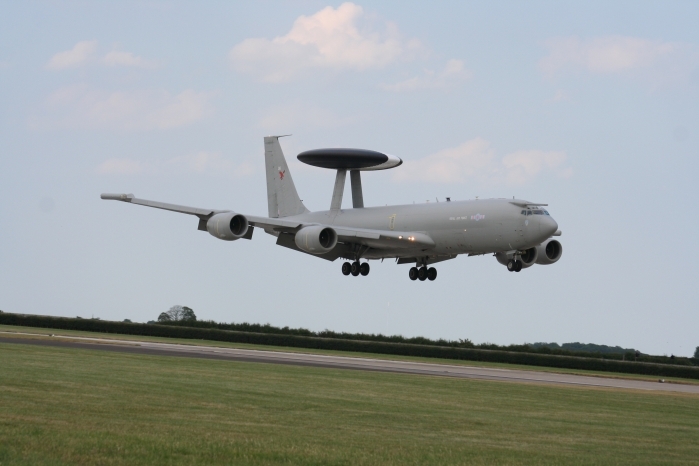 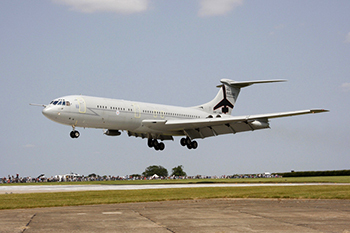 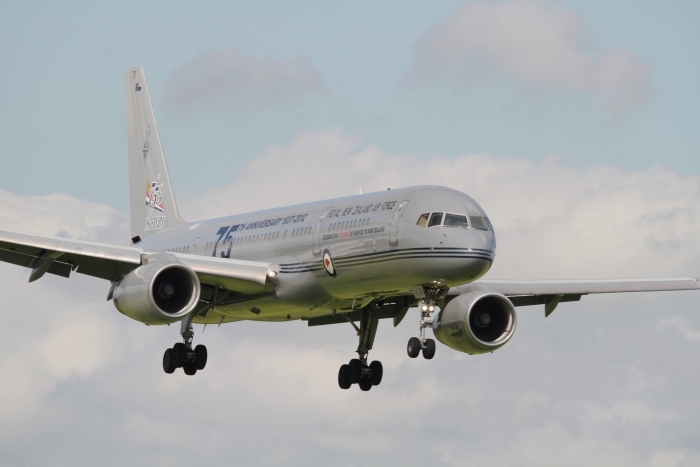 RAF Waddington is home to a variety of aircraft, such as the Sentinel R1, and the Boeing E-3D Sentry. 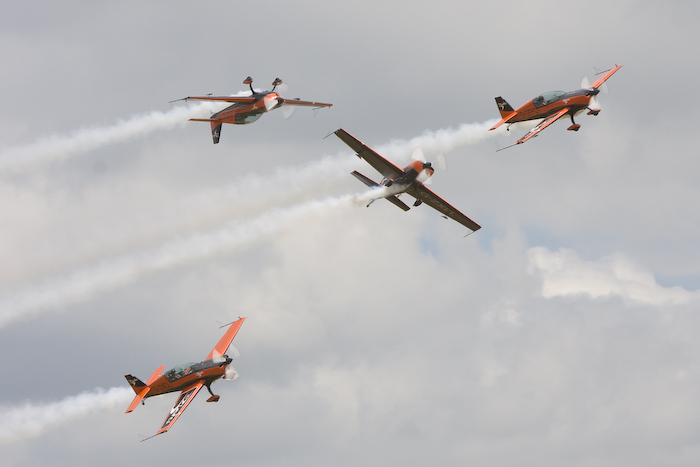 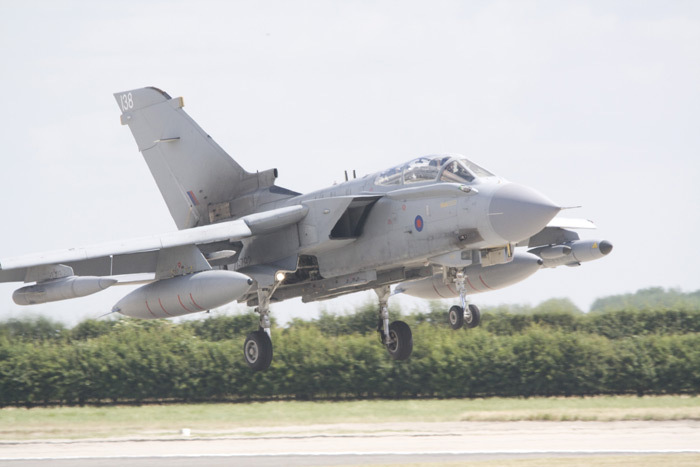 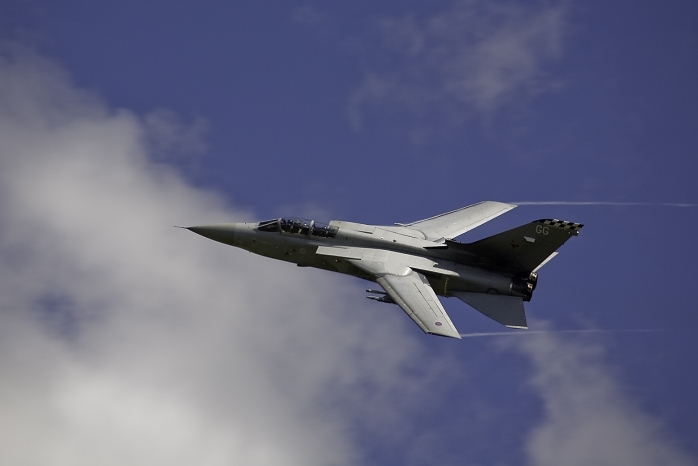 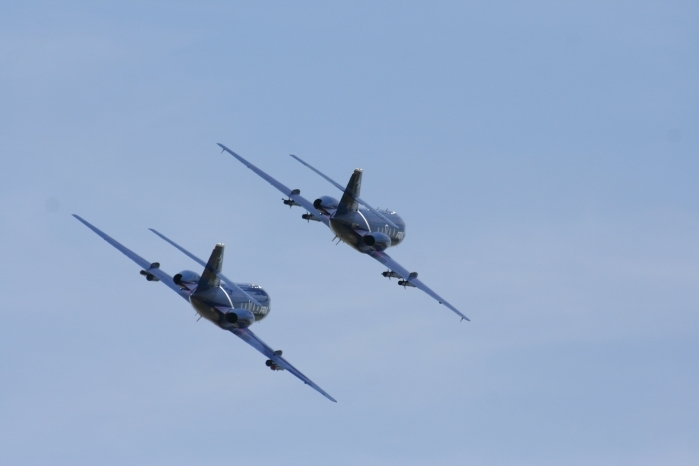 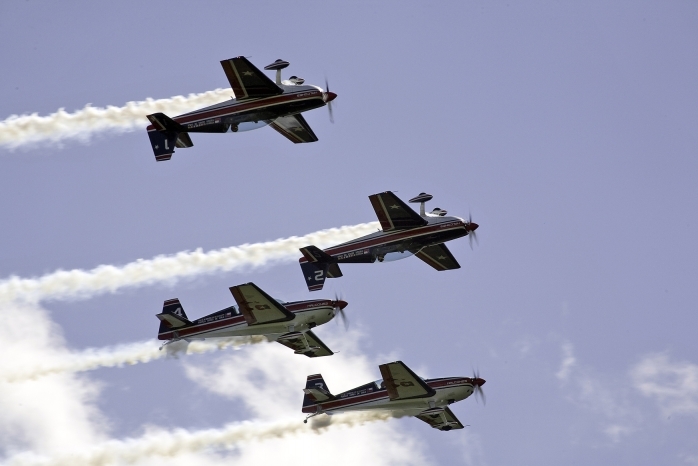 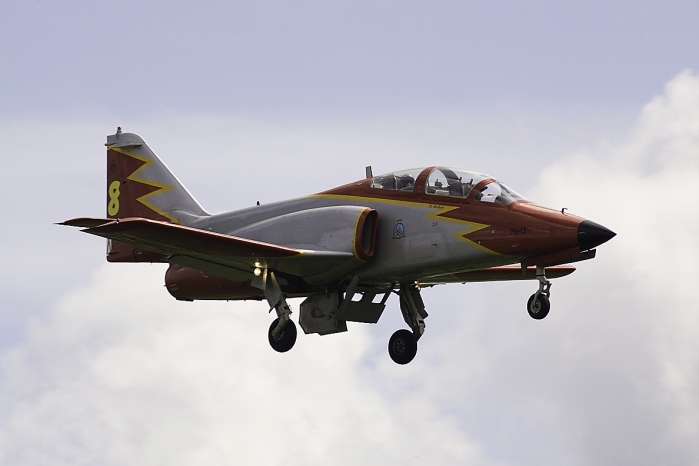 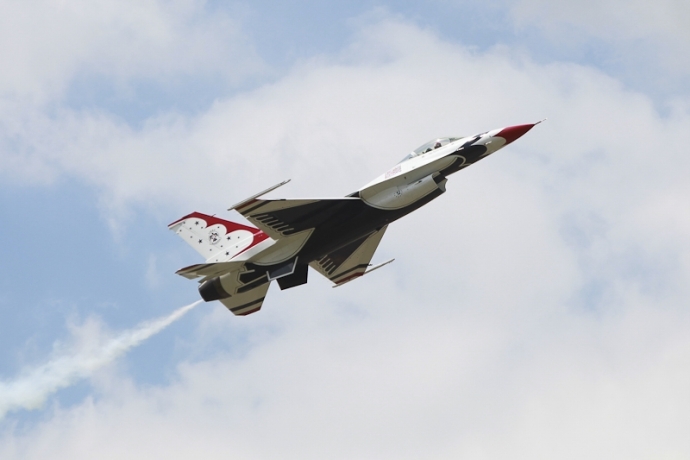 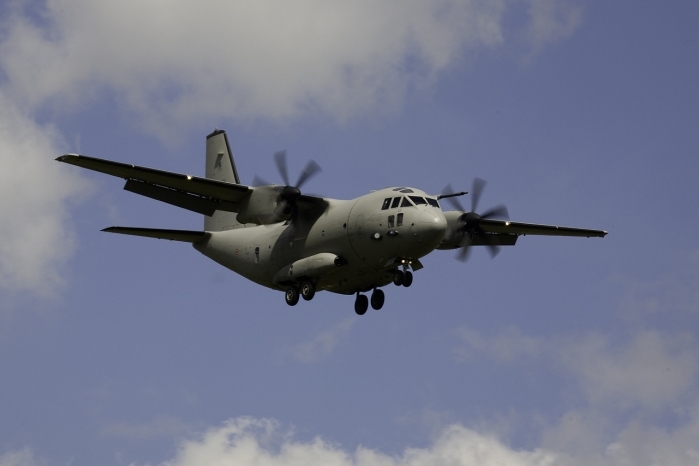 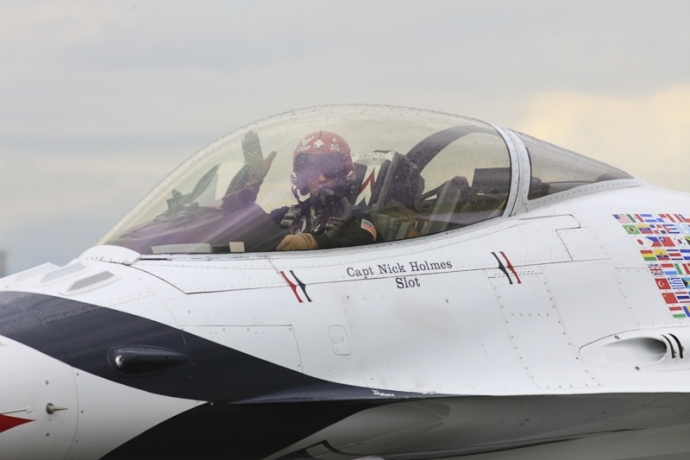 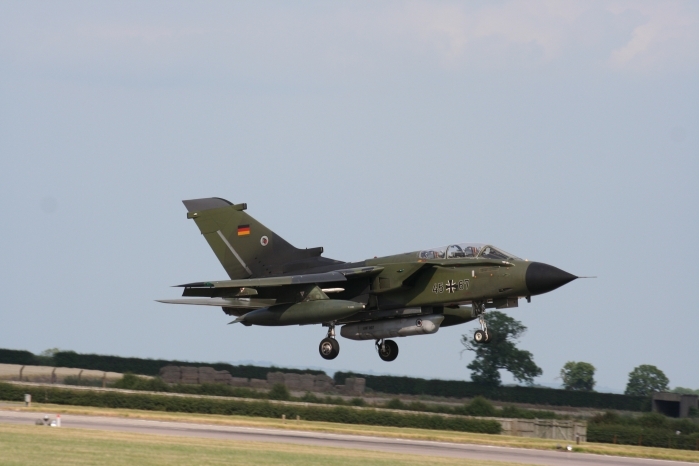 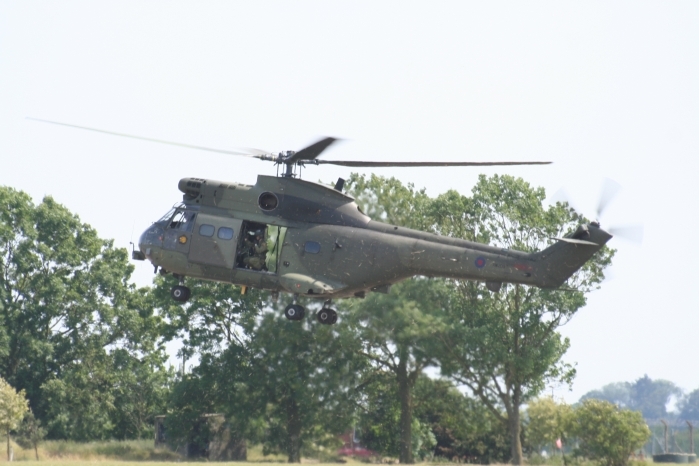 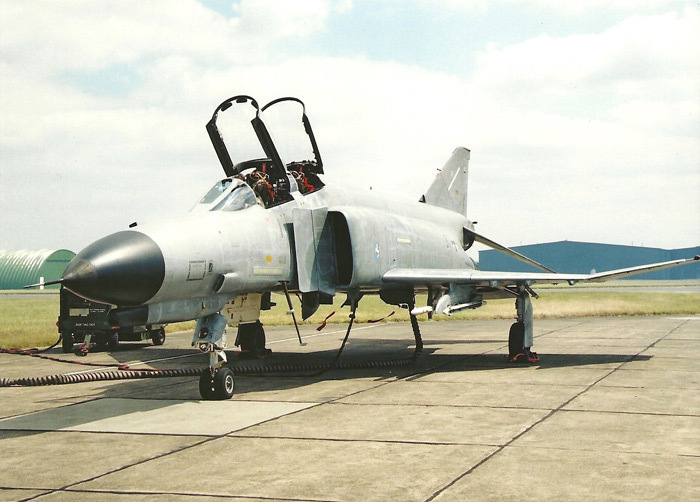 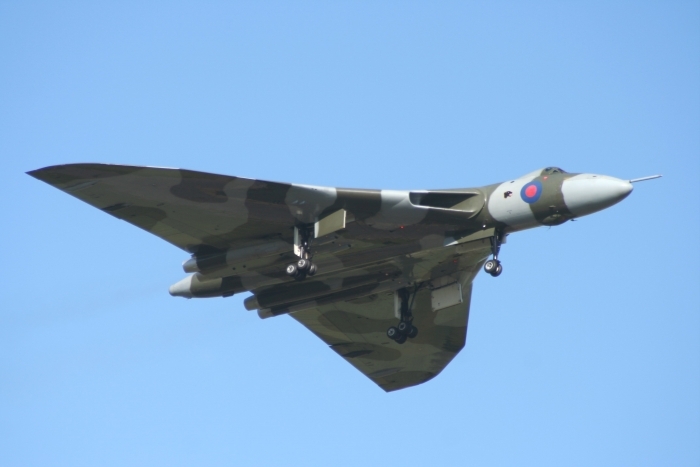 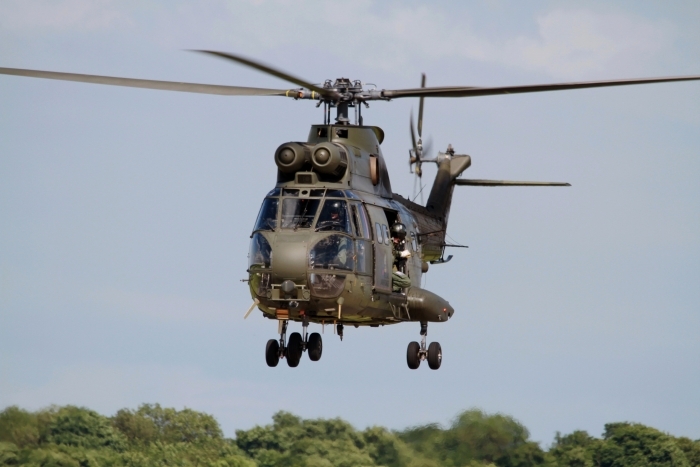 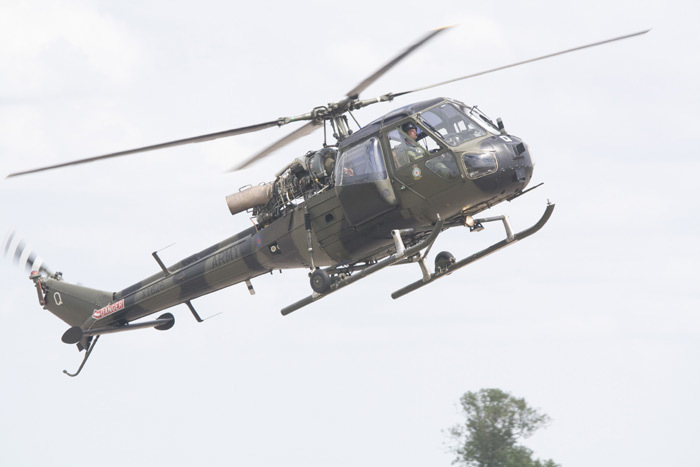 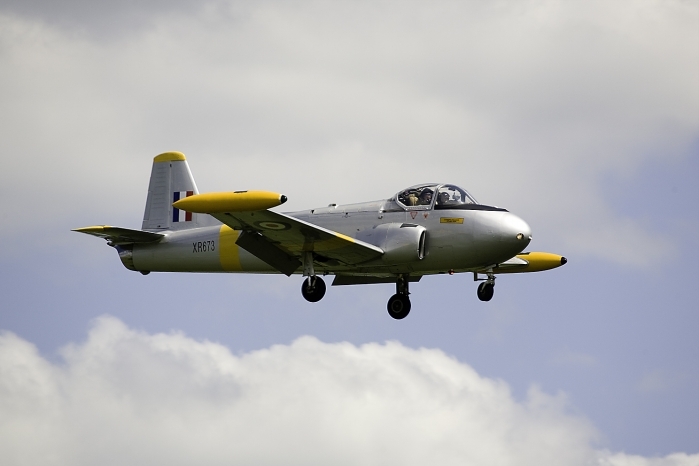 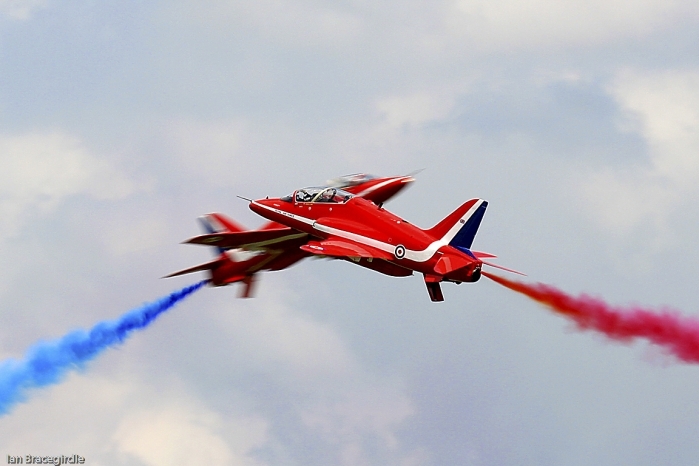 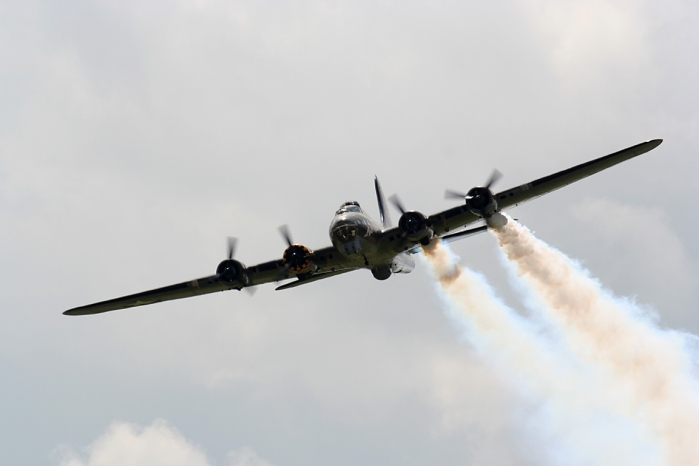 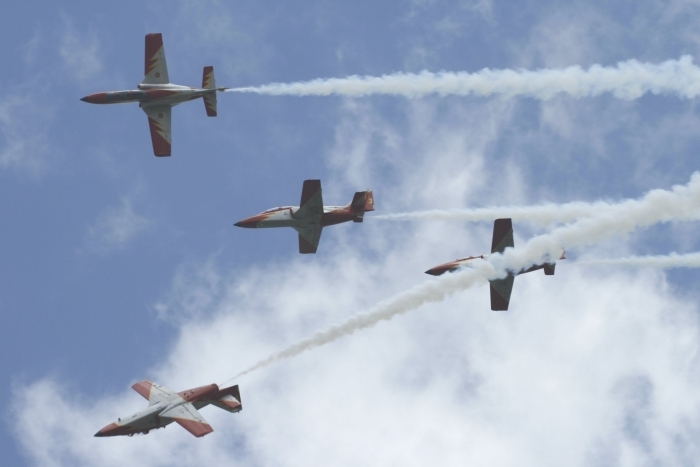 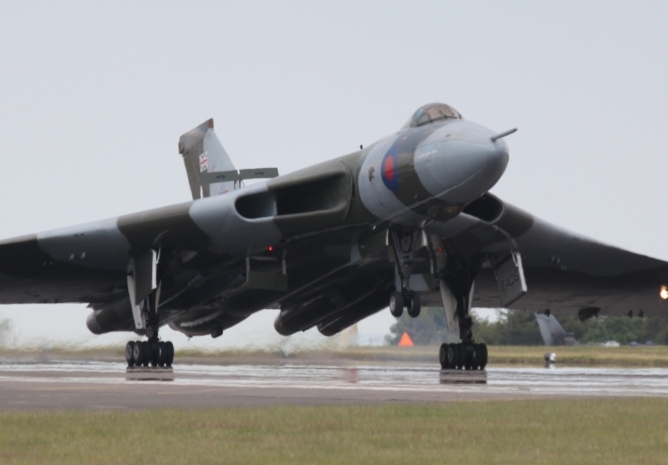 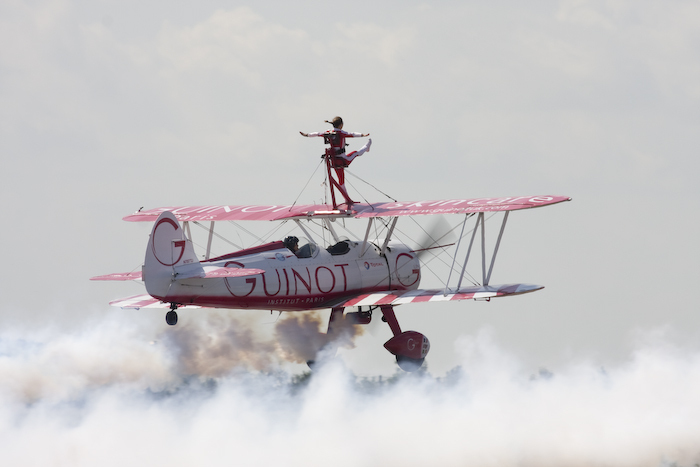 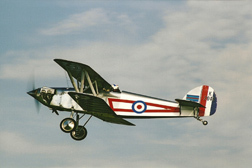 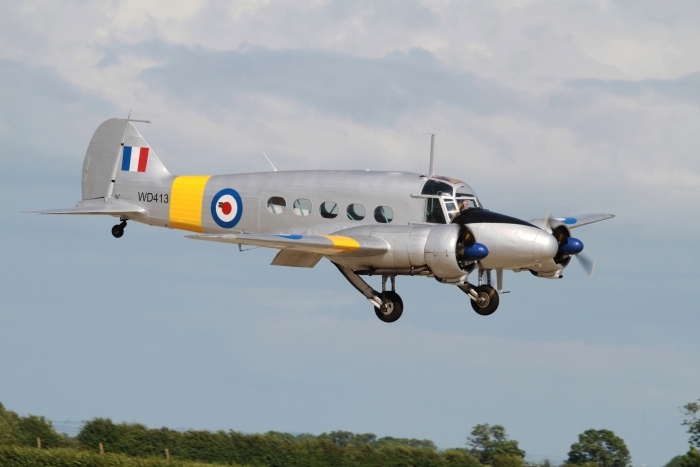 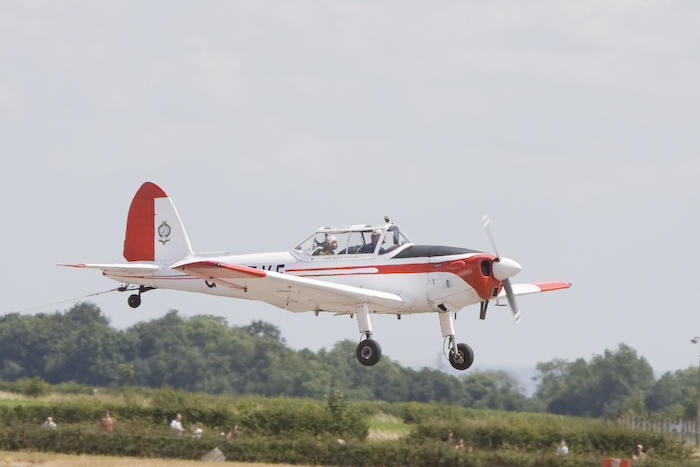 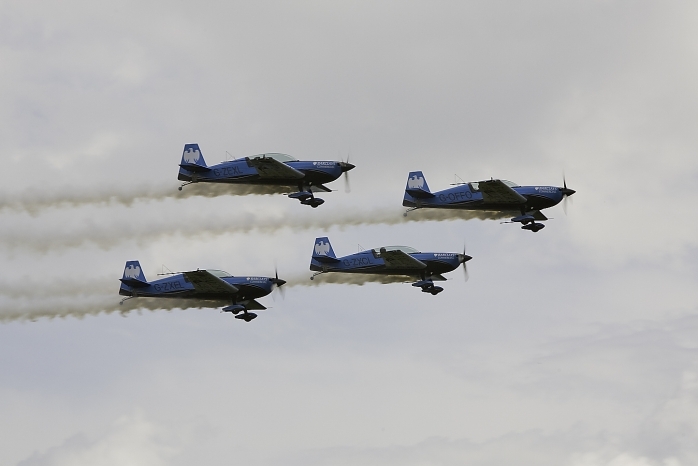 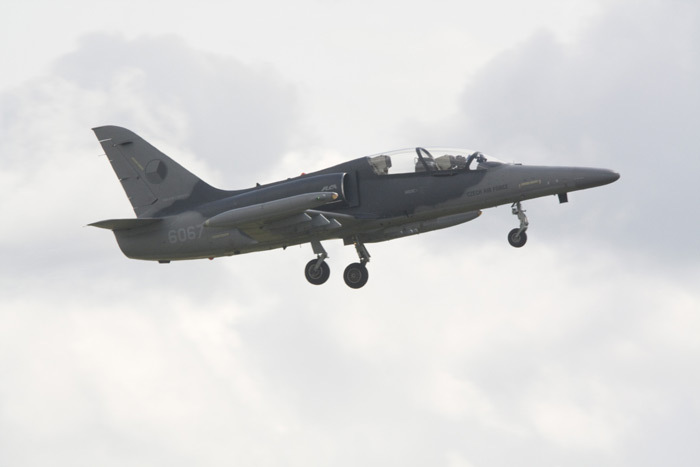 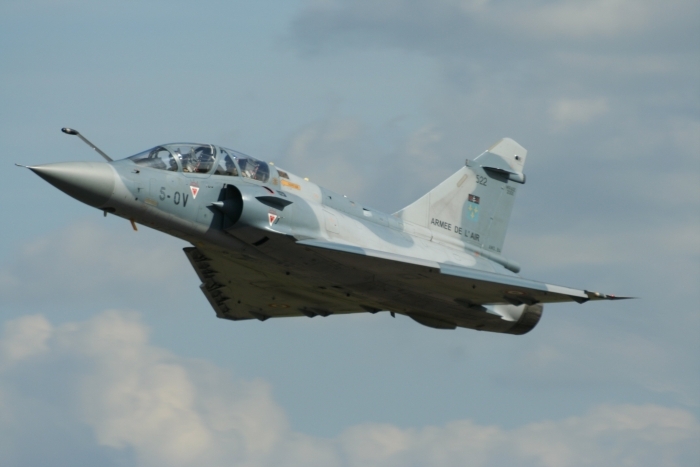 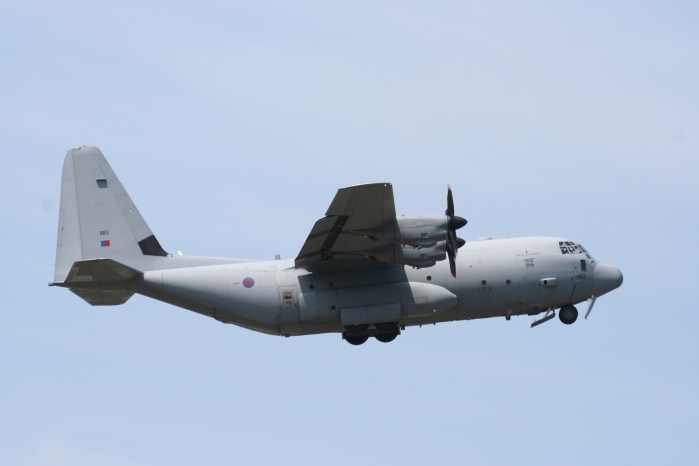 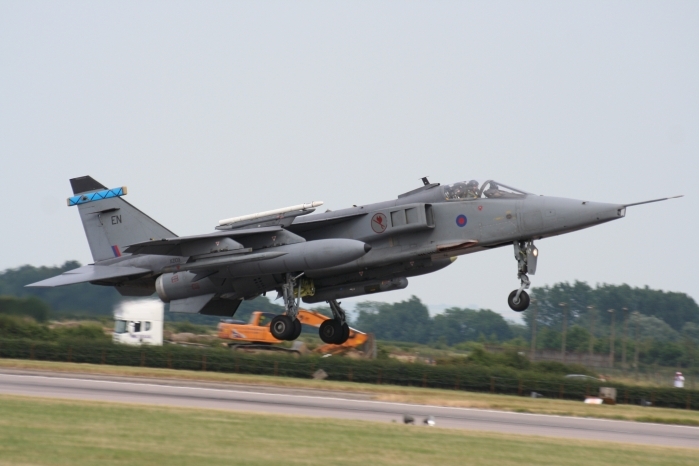 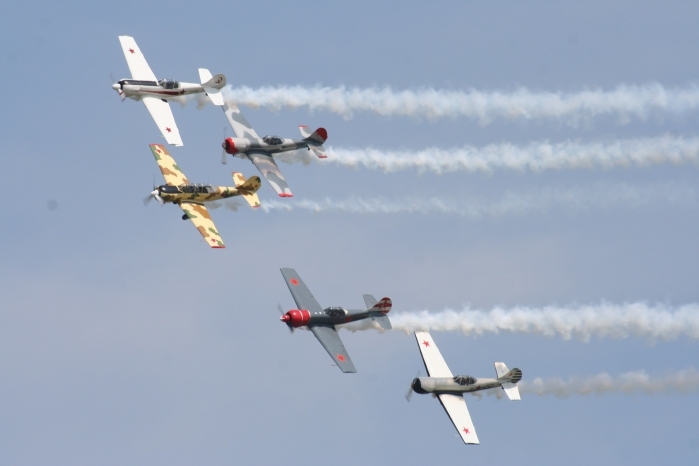 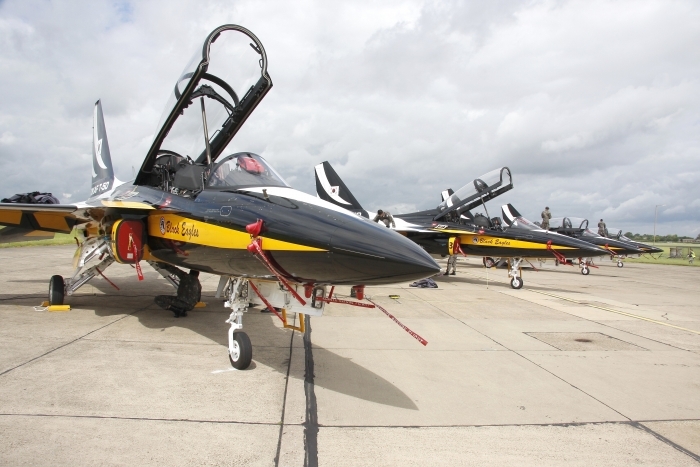 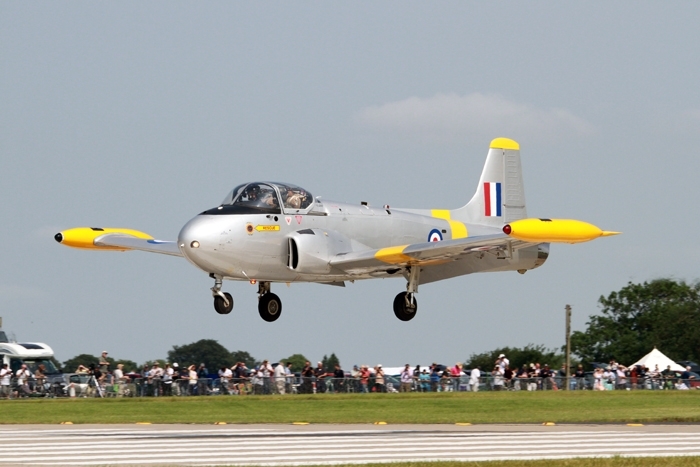 Waddington has hosted the air show since 1995 and offers a mix of both modern and vintage aircraft as well as display teams and other aircraft from around the world. 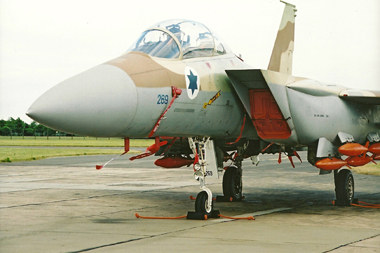 With a large static park and numerous exhibitions in the hangars. 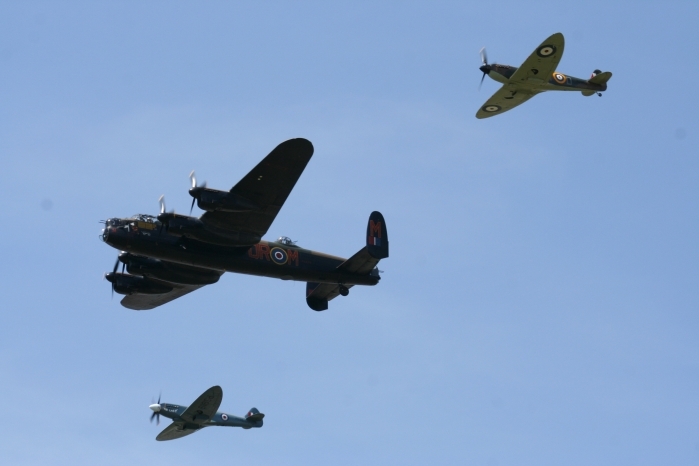 The summer really started in Lincolnshire this weekend. 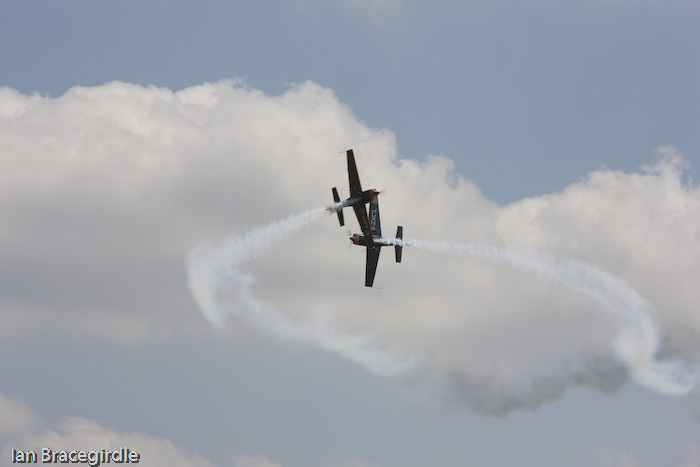 One of the country’s biggest air shows had some fantastic weather with the public packing the place out, and with an over six hour flying display there was something for everyone. 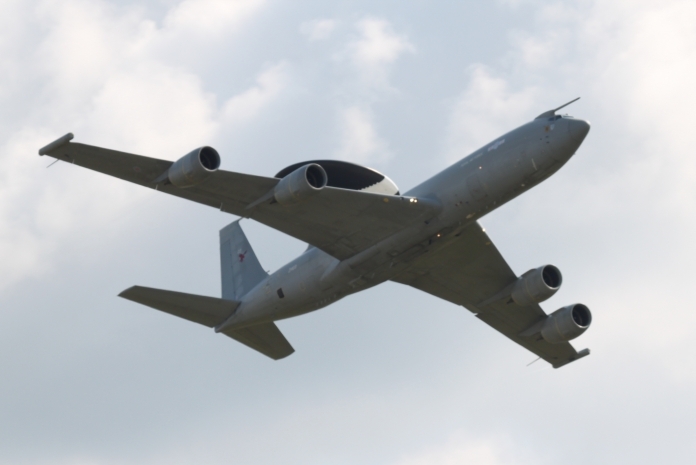 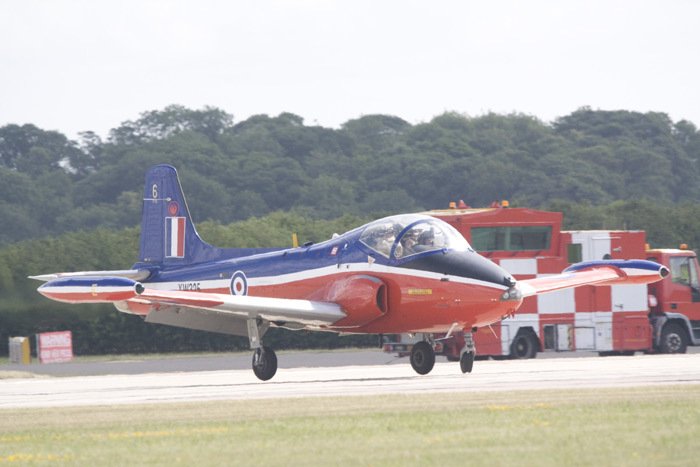 The show was started by Waddington’s customary station flypast of the Sentinel and Sentry and quickly picked up tempo with a mix and match of aircraft. As usual there were visitors from abroad as well as old favourites. 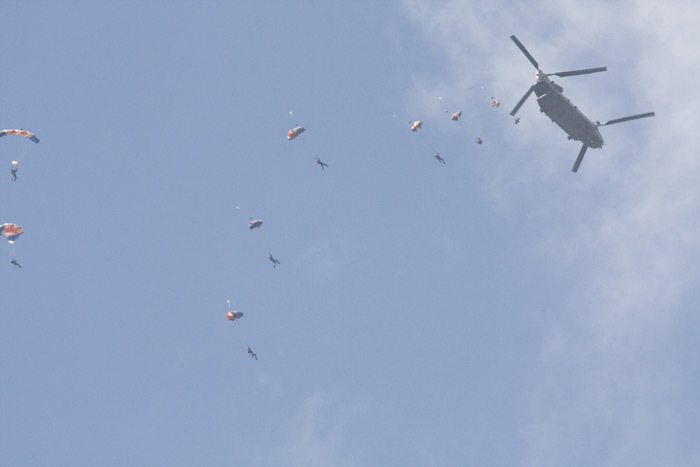 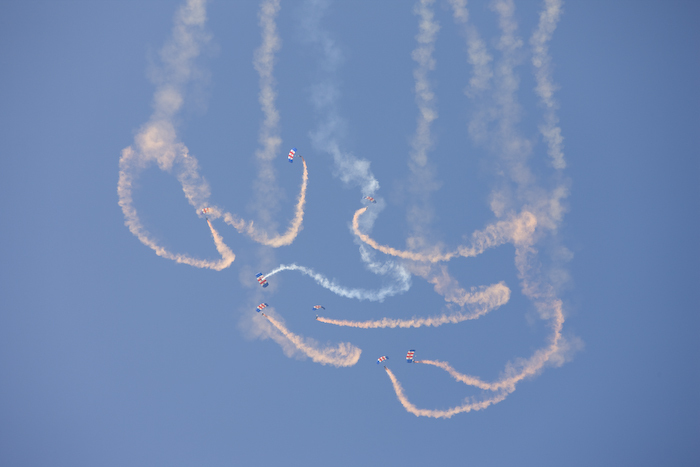 The RAF Falcons Parachute Team were one of the first on with their usual display of precision free falling and landings. 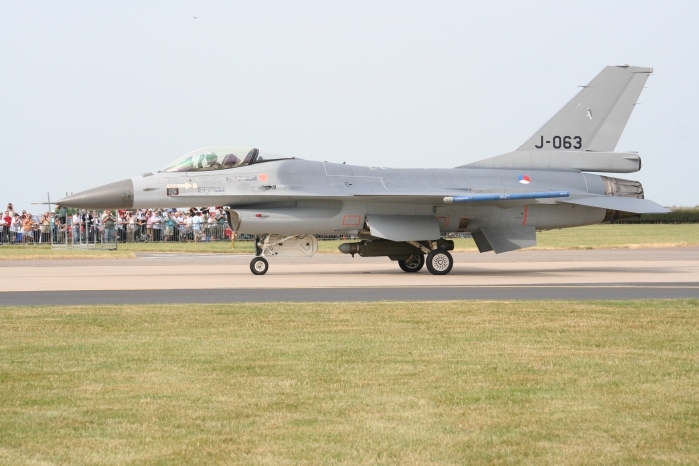 As with many air shows there was an abundance of F-16 displays at Waddington with no less than three aircraft from three different countries. 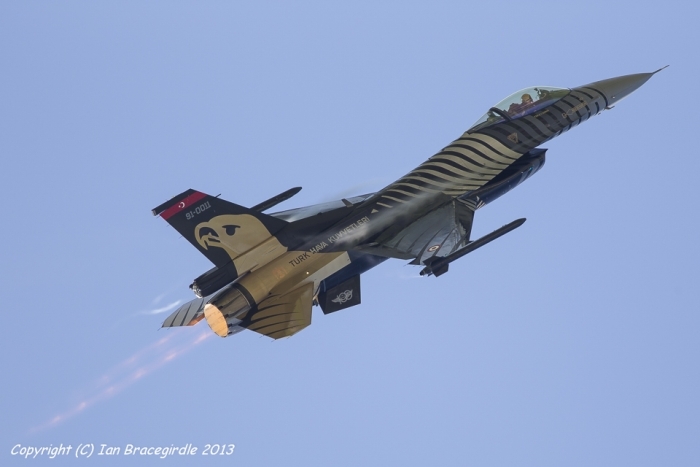 Countries represented were Belgian, Netherlands and Turkey. 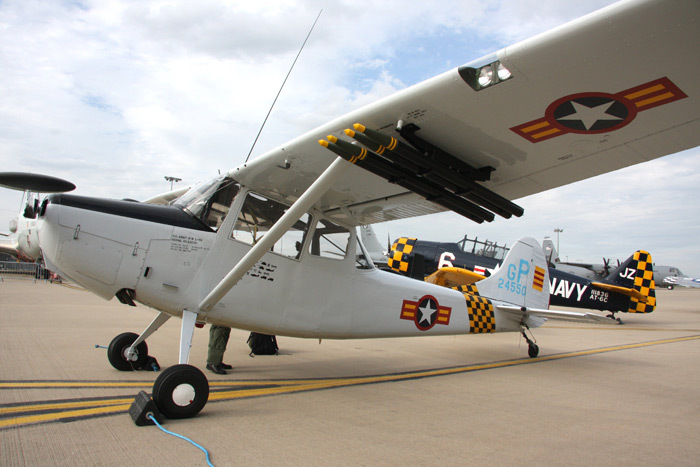 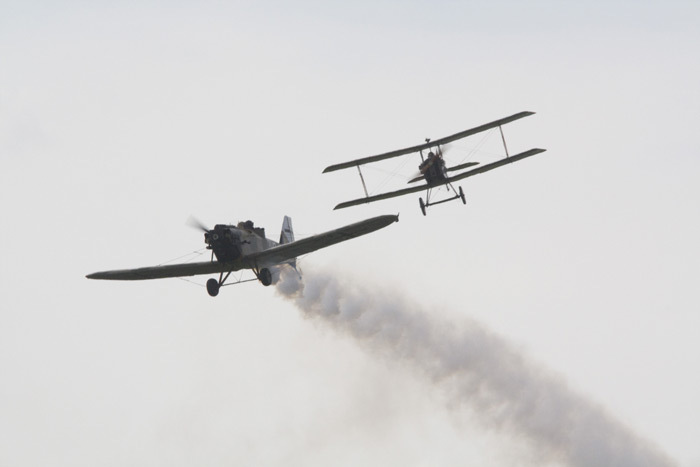 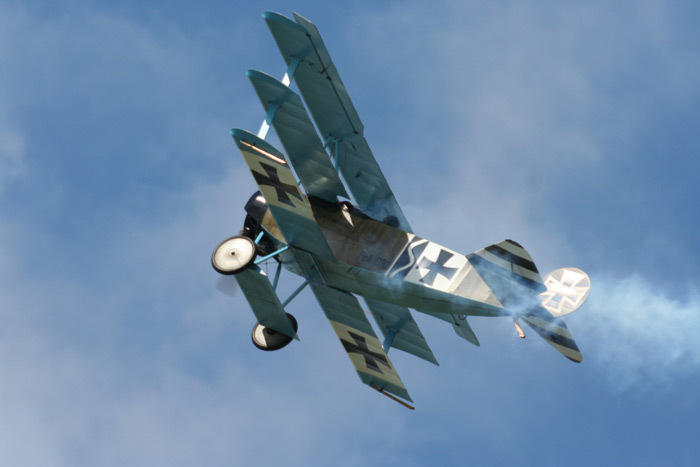 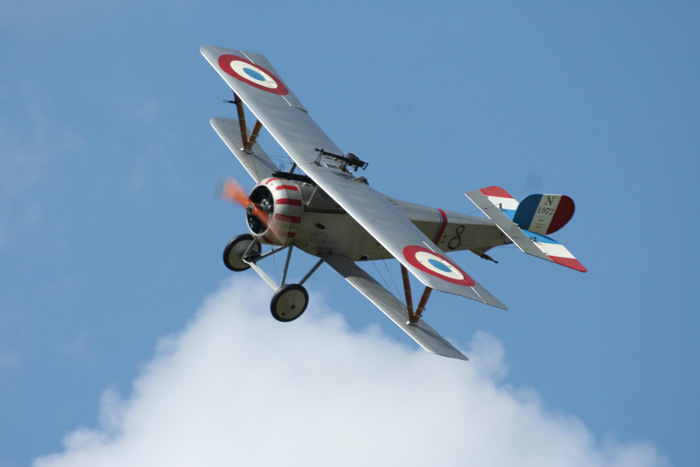 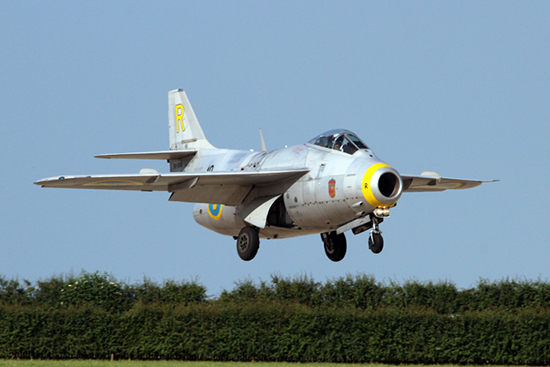 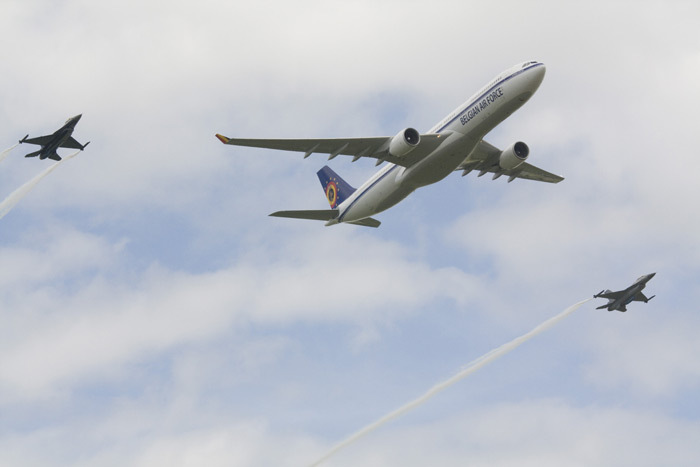 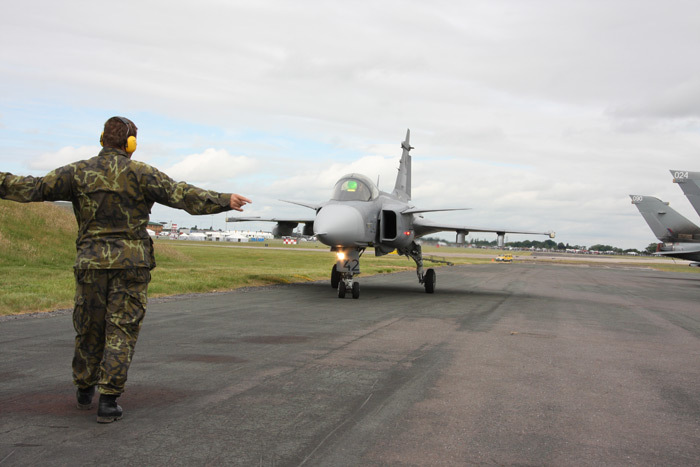 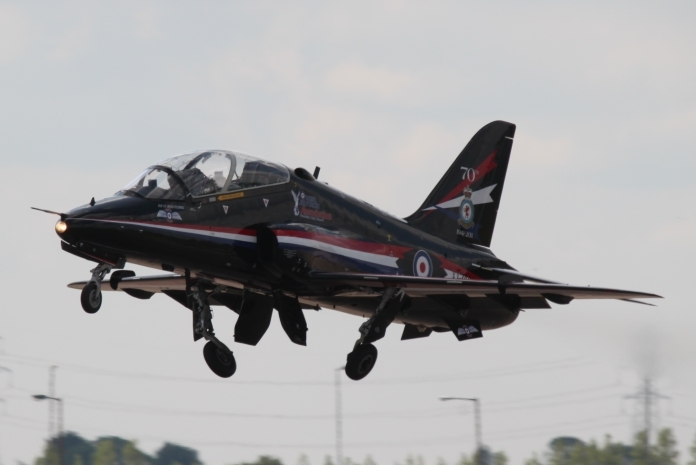 Each aircraft carried out a display which brought something different to the show. 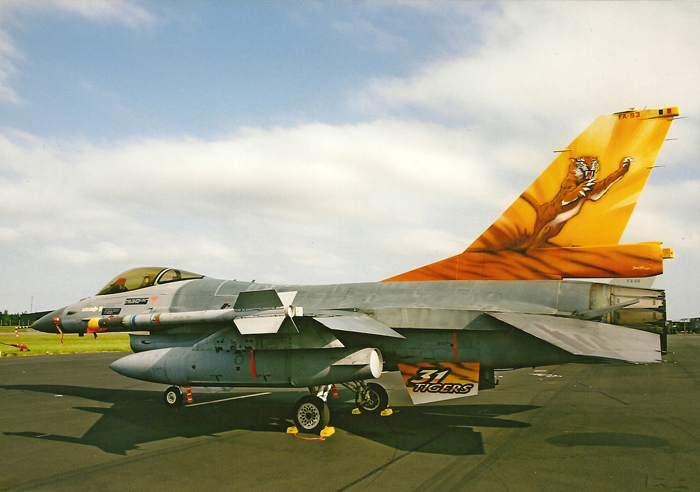 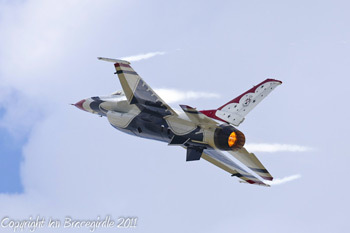 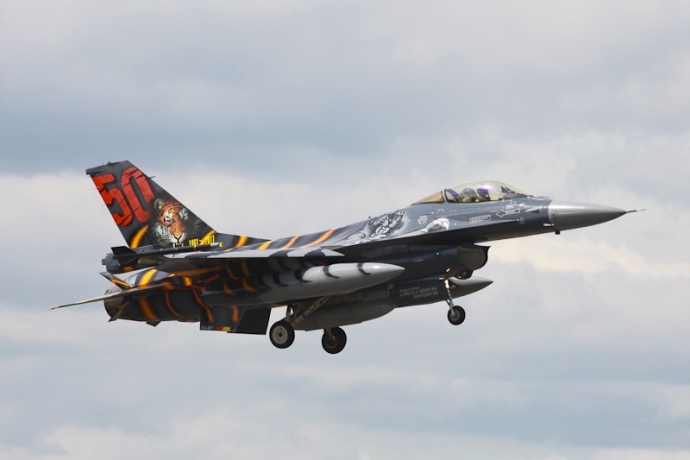 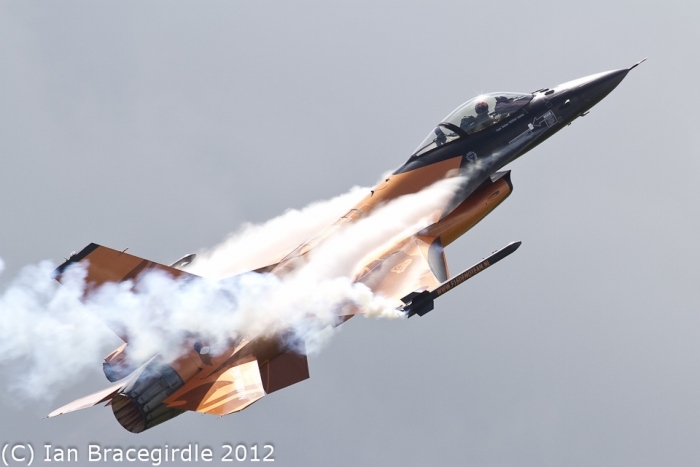 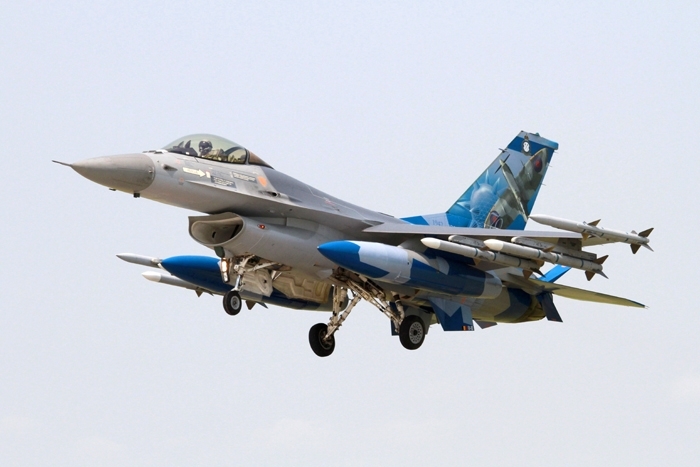 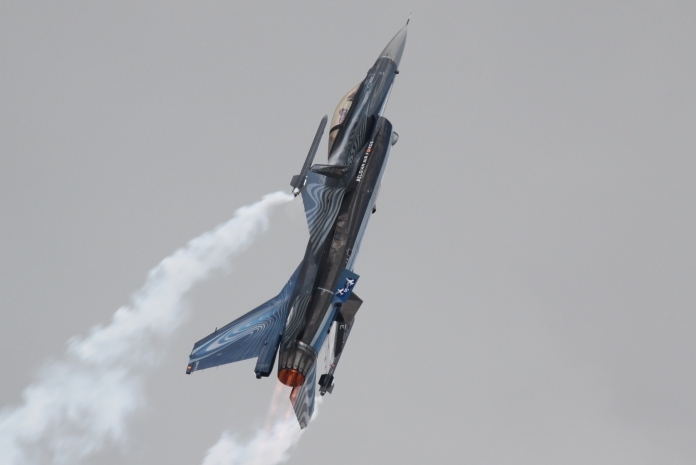 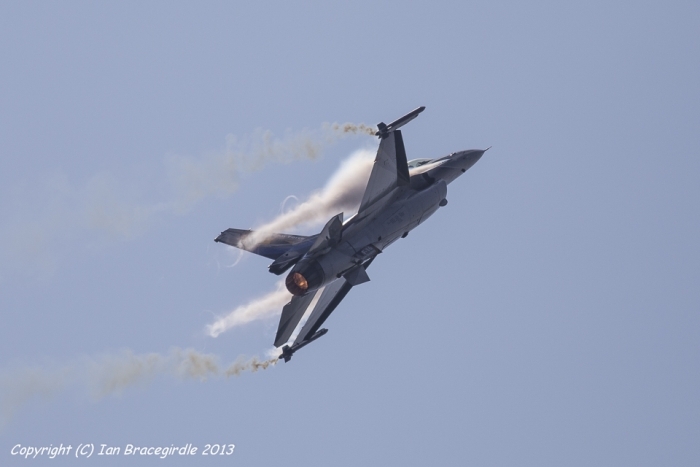 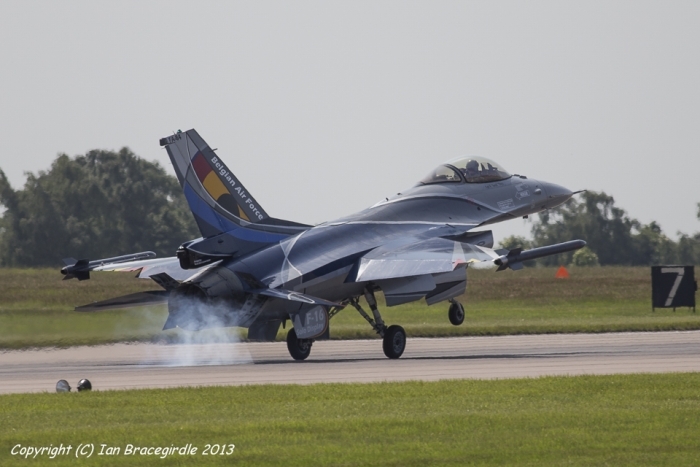 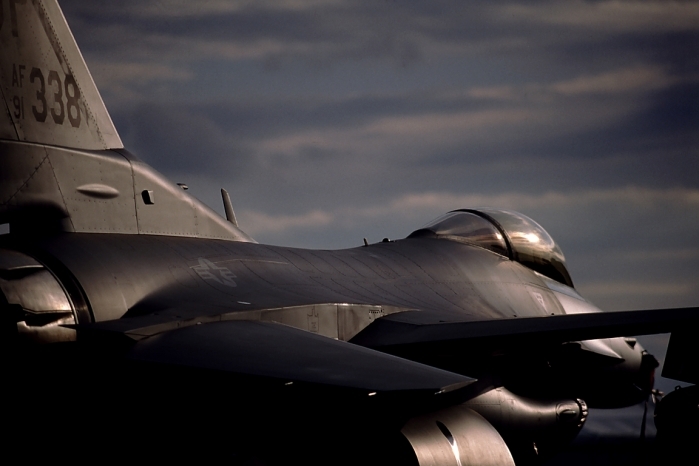 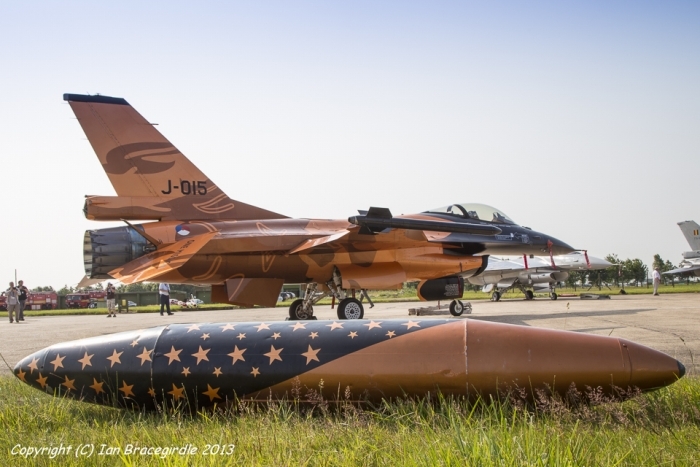 With the bright colour schemes and the smoke the F-16 is always going to be a popular item. 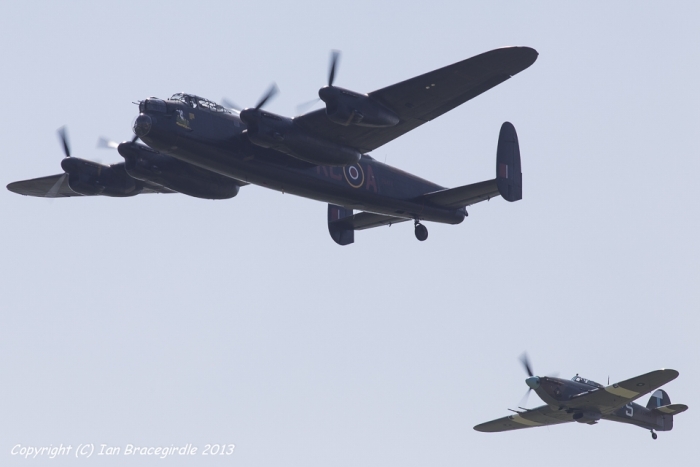 From the RAF, the ever popular Battle of Britain Memorial Flight with the Lancaster, Spitfire and Hurricane, at the end of the displays the Lancaster flew past with a 617 Squadron Tornado, marked up with the Dambusters 70th anniversary tail art, to the Short Tucano and finally the Typhoon, this year from RAF Coningsby. 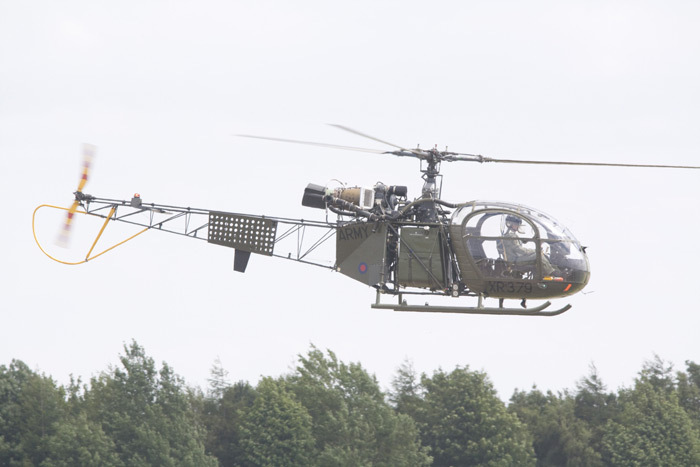 Helicopters were also well represented with three types, each with a different type of display. 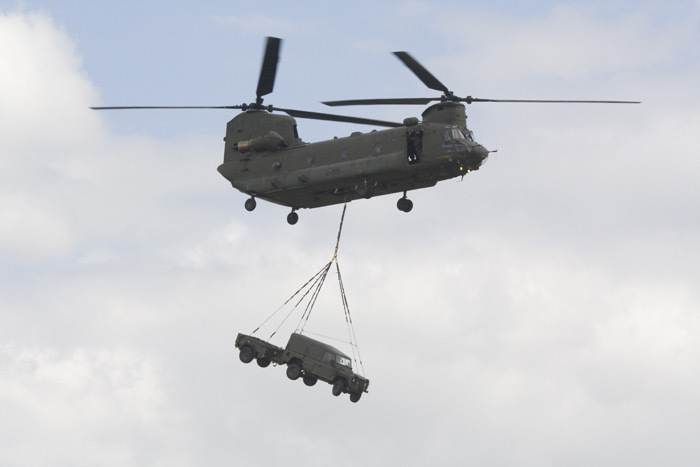 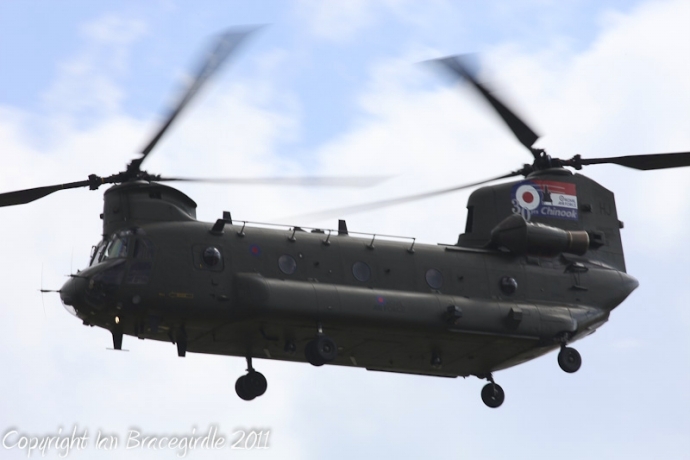 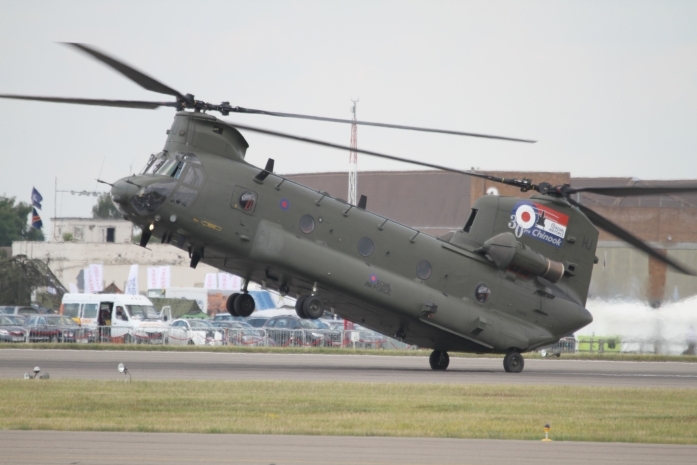 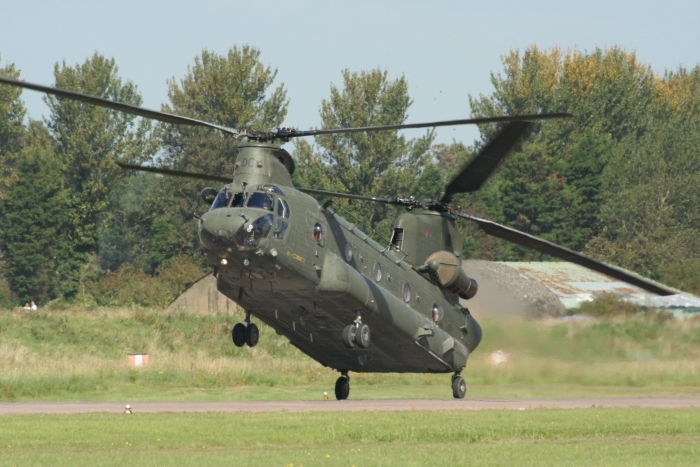 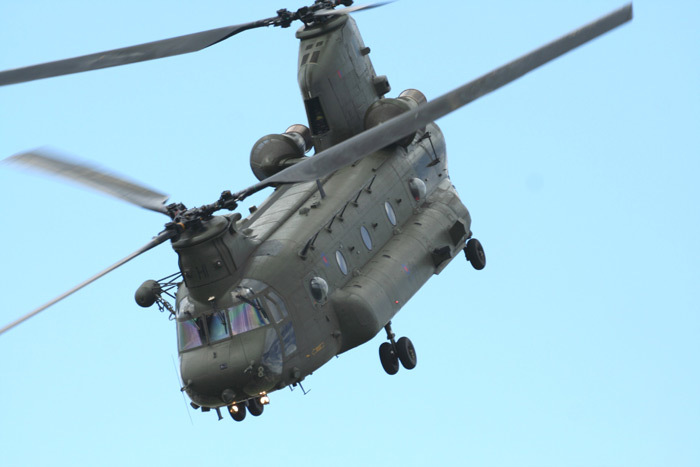 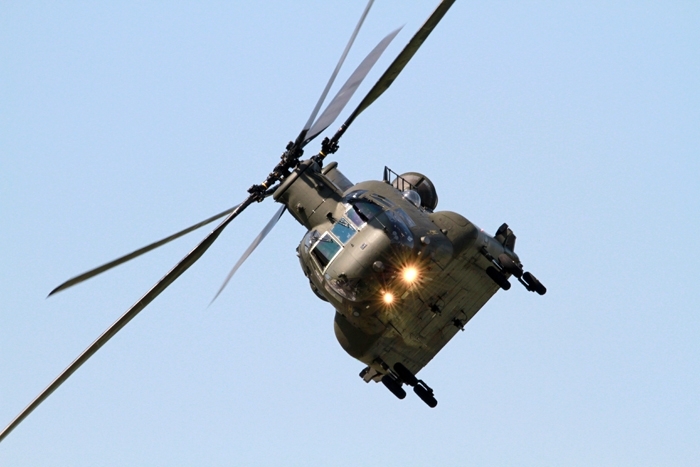 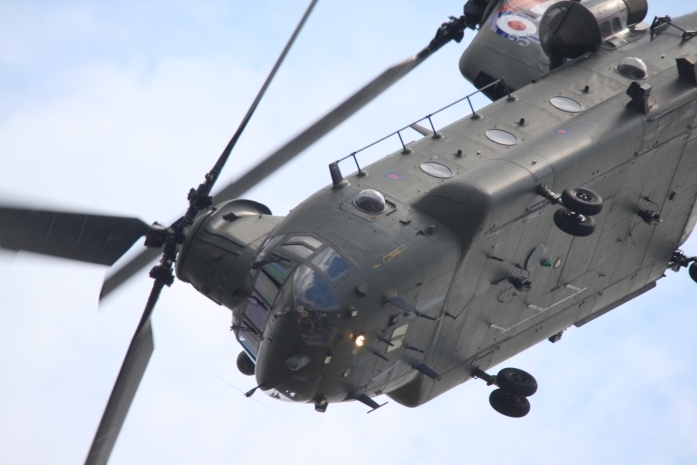 The Apache, Chinook and Merlin. 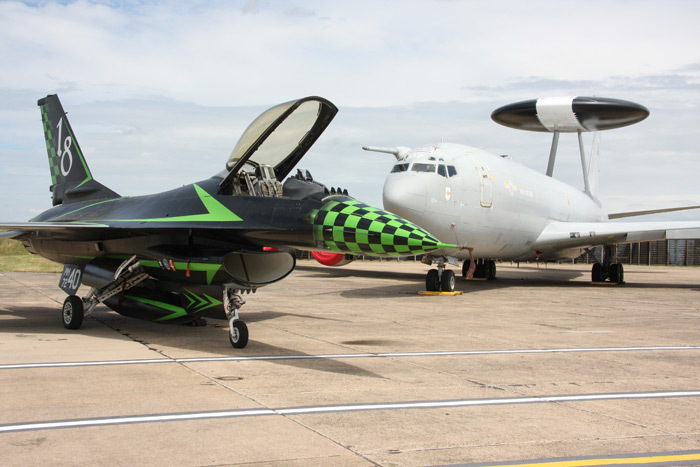 Ex RAF aircraft were also displaying at Waddington including the Bulldog, a pair of Gnats and the Avro Vulcan, a former aircraft based here. 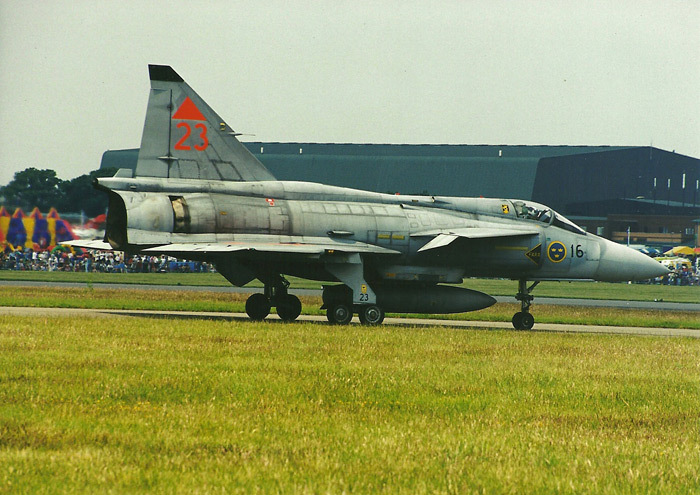 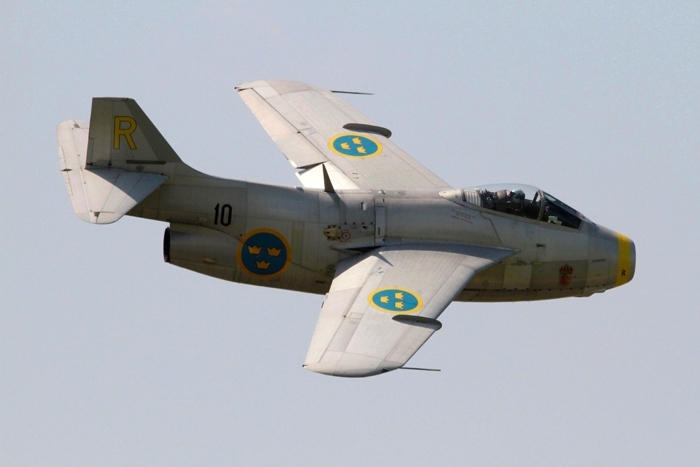 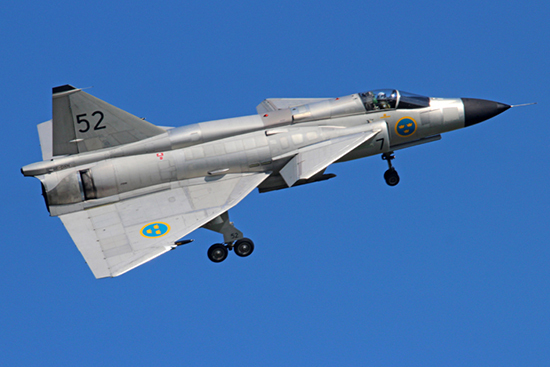 One of the highlights of the weekend was the Viggen, Tunnan and SK60 from the Swedish Historic Flight. 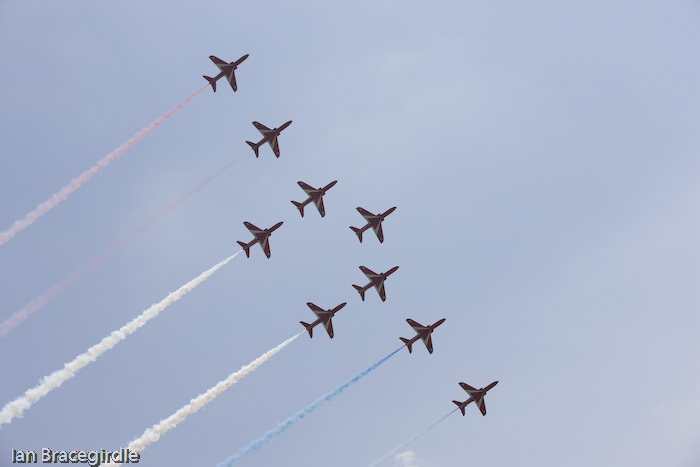 Several display teams were also displaying, including the Red Arrows who carried out a flypast with a five Squadron Sentinel, the Blades and closing the show the Patrouille de France. 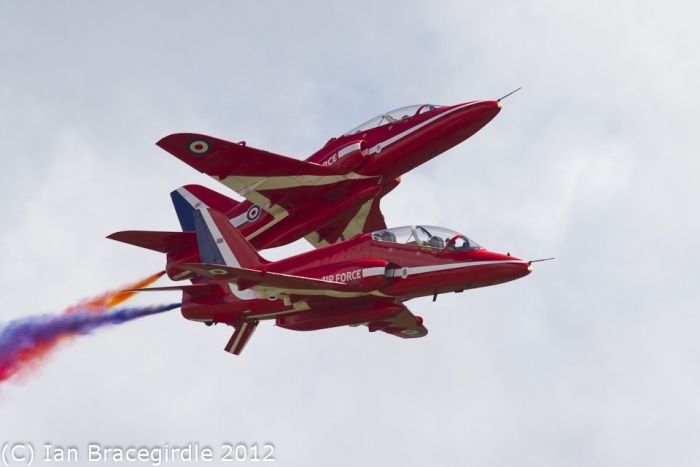 Overall a well coordinated show which was well balanced and enjoyable to watch. 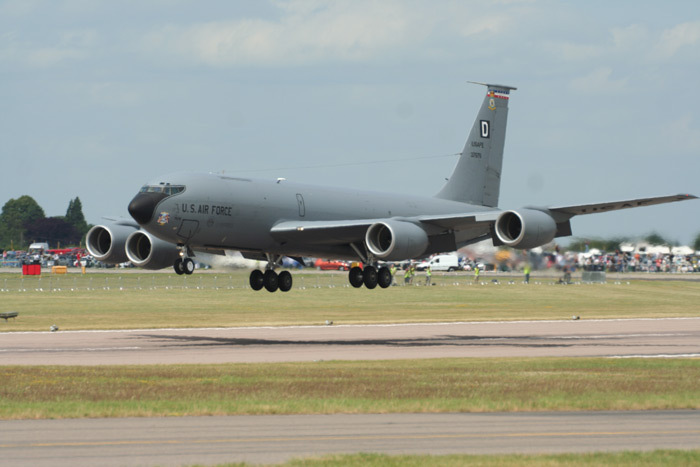 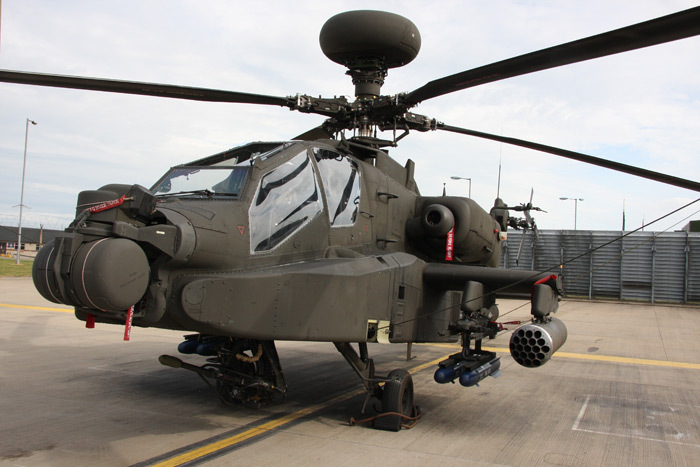 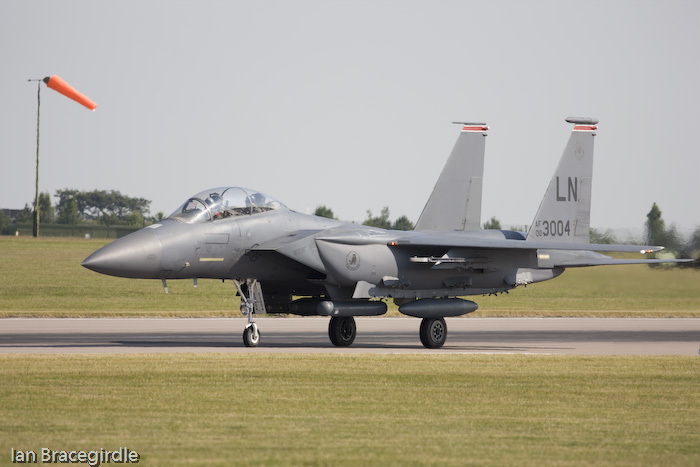 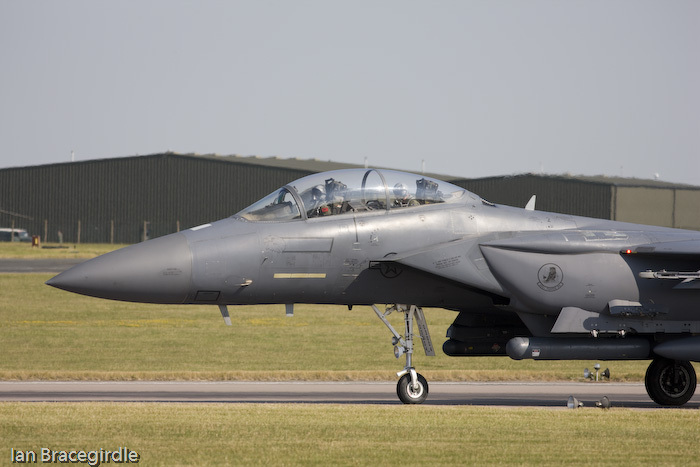 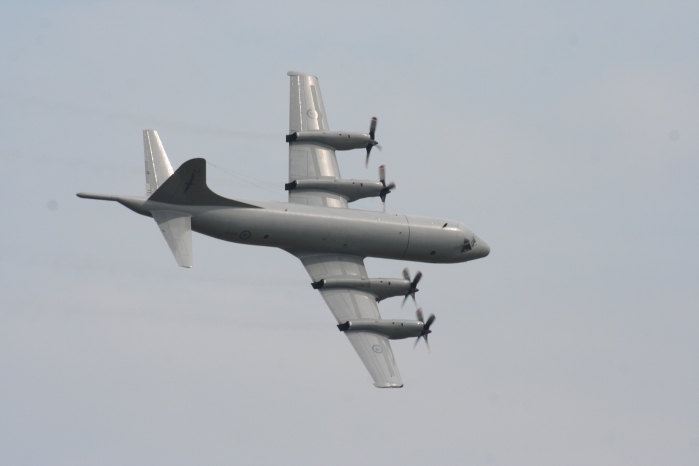 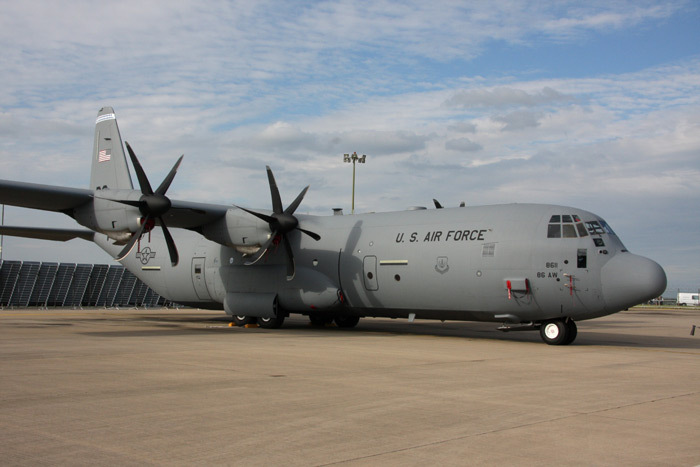 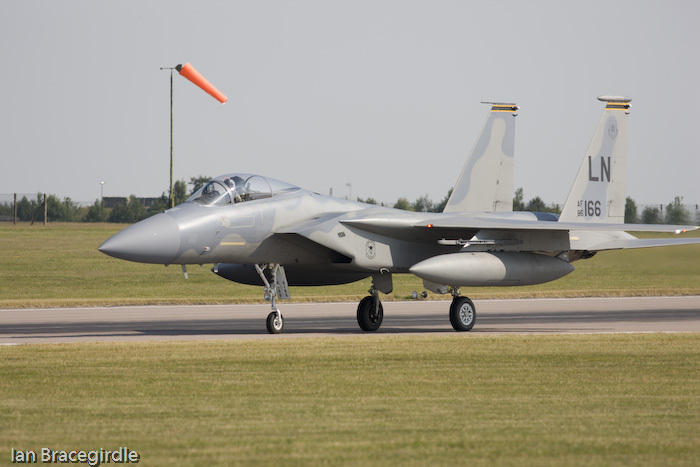 RAF Waddington’s annual air show attracts aircraft from around the world, including New Zealand, Australia and Korea to name a few. 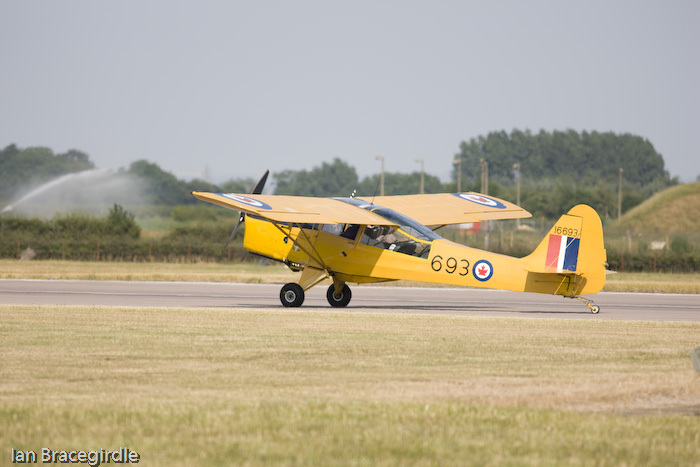 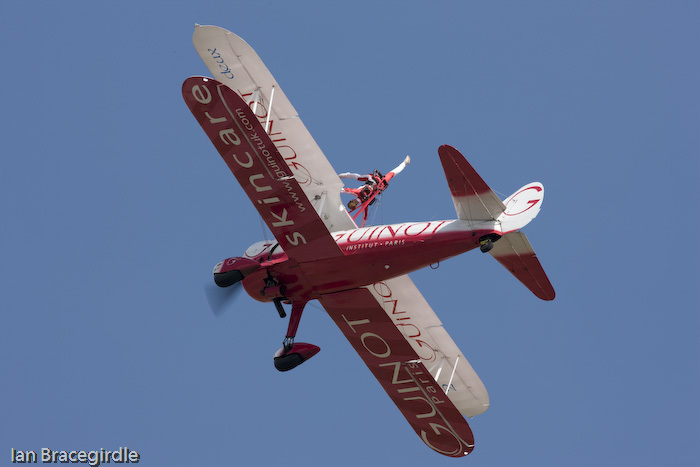 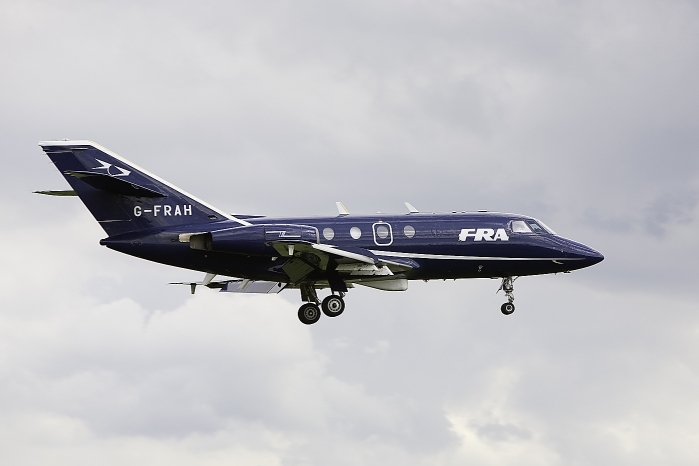 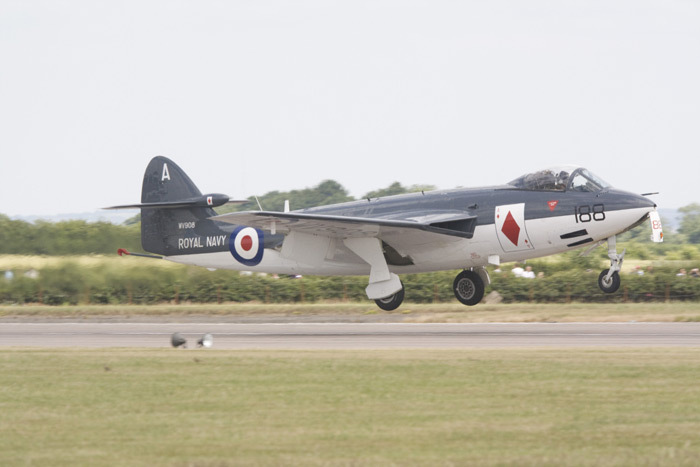 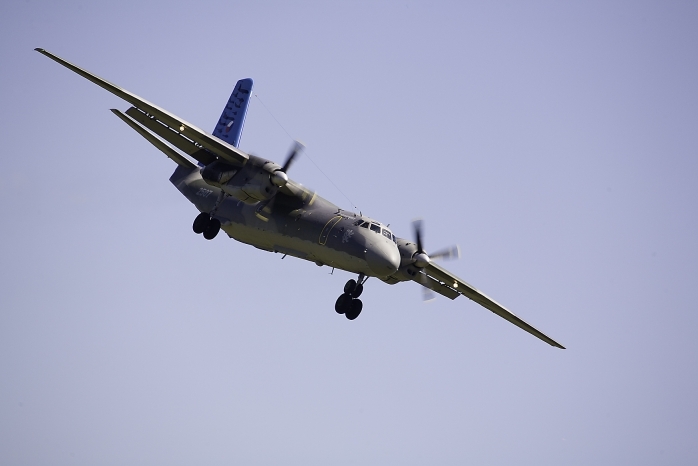 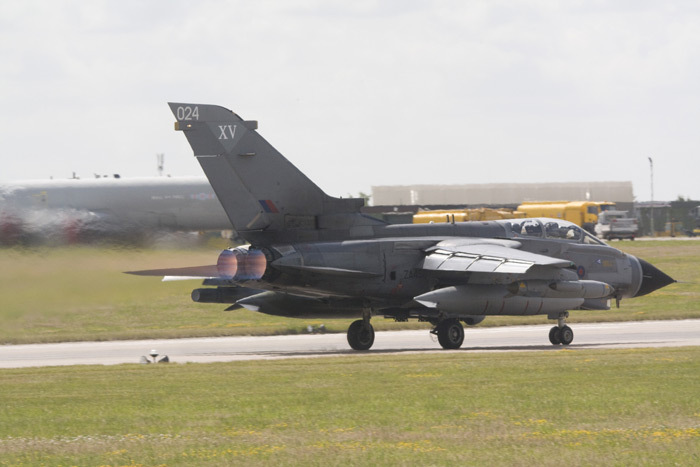 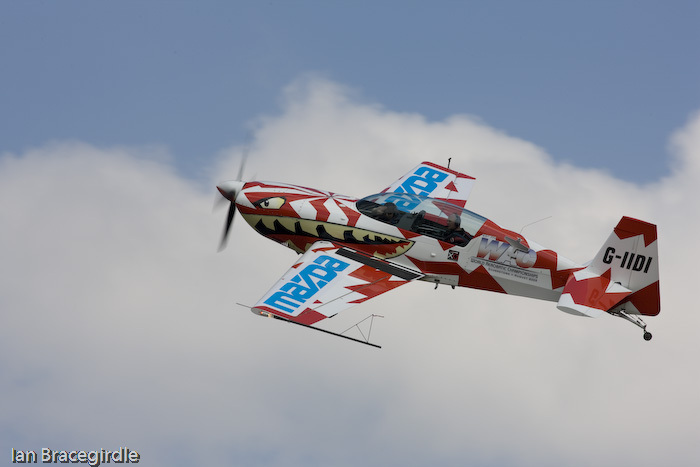 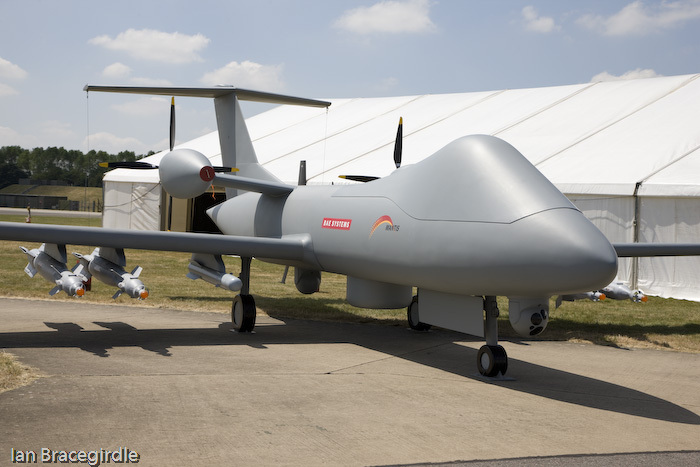 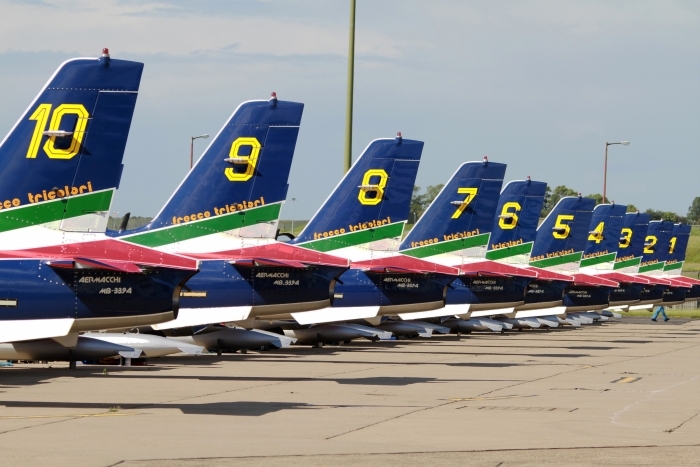 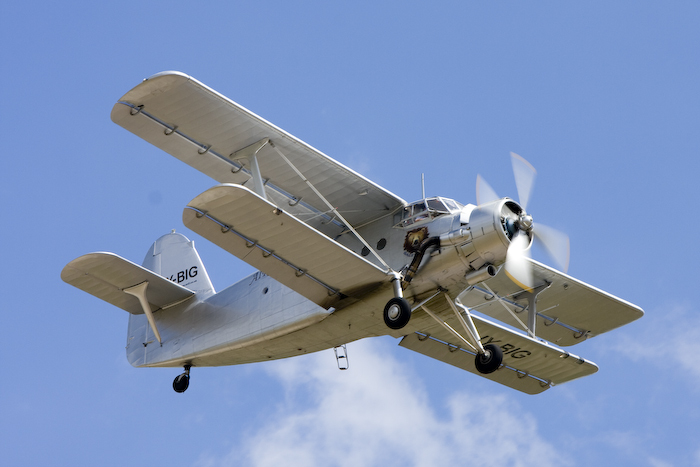 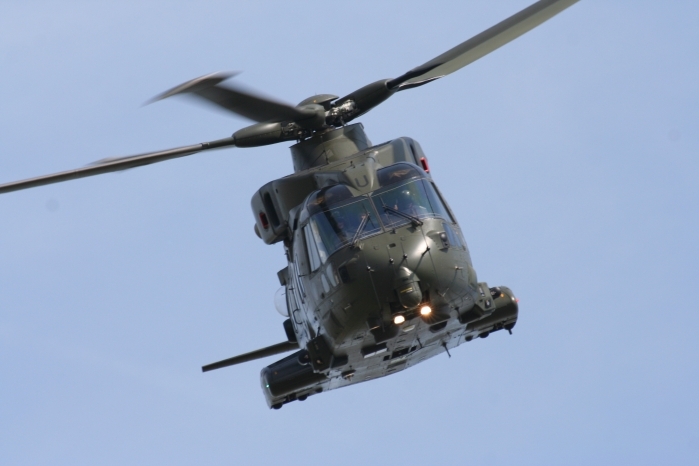 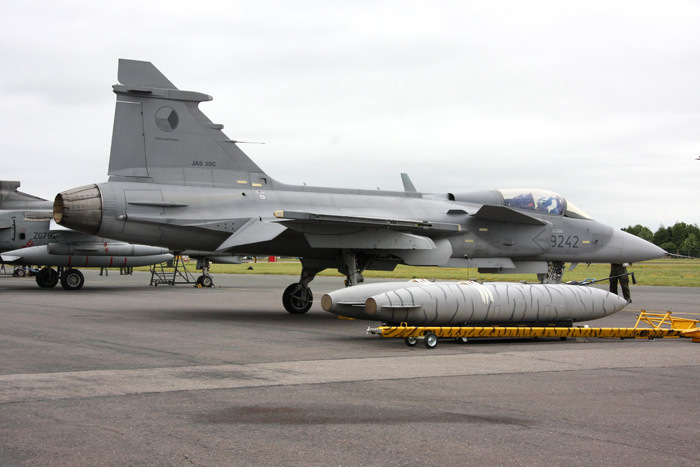 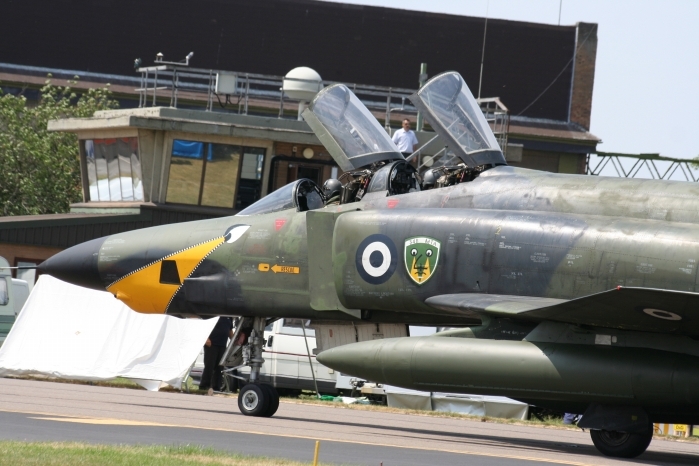 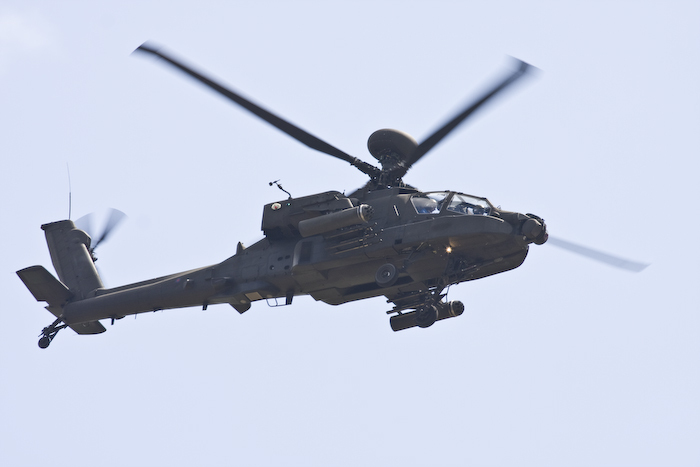 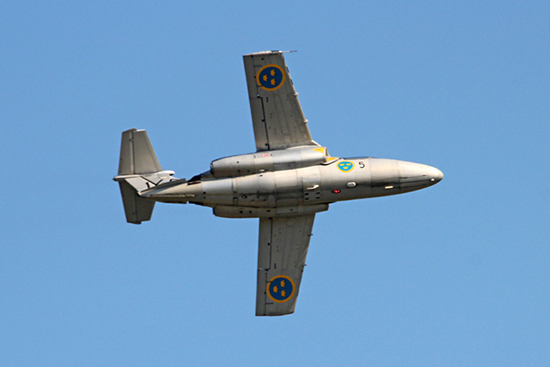 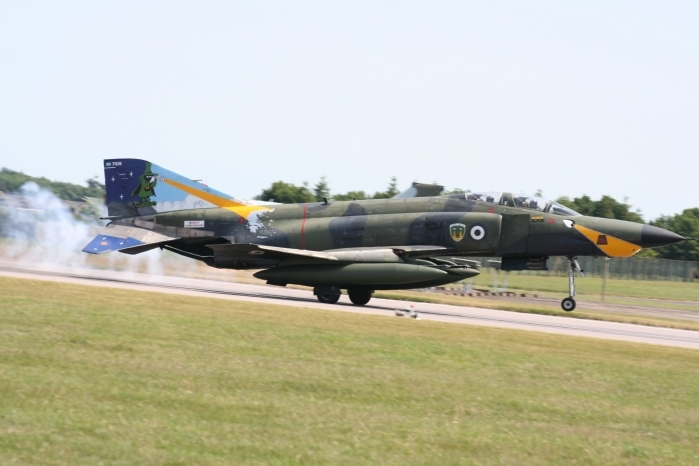 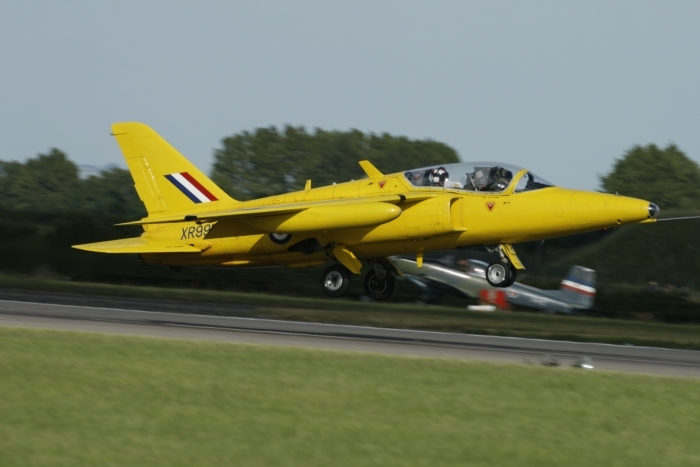 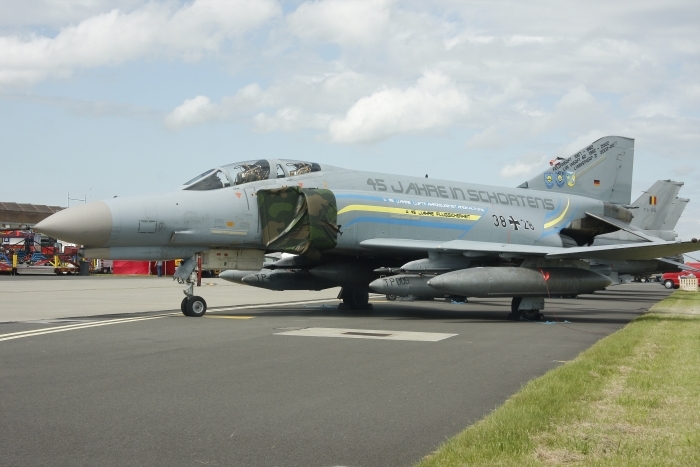 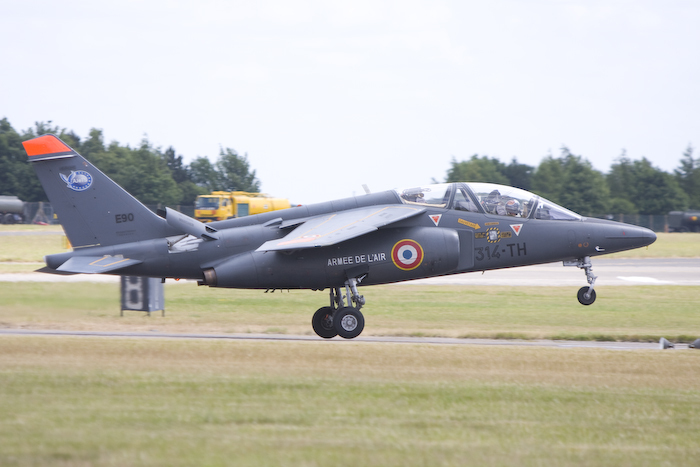 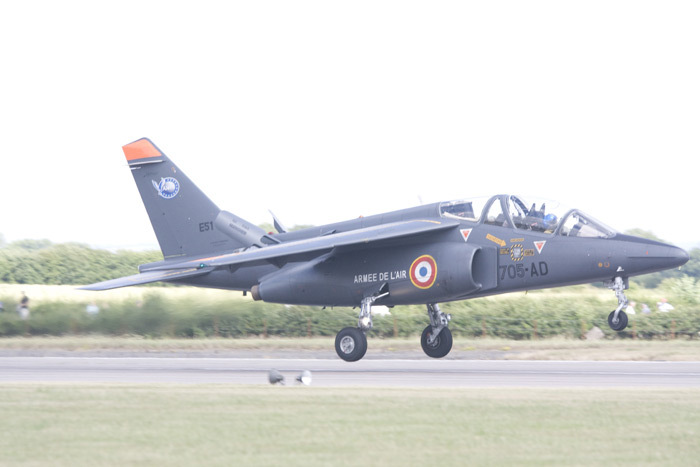 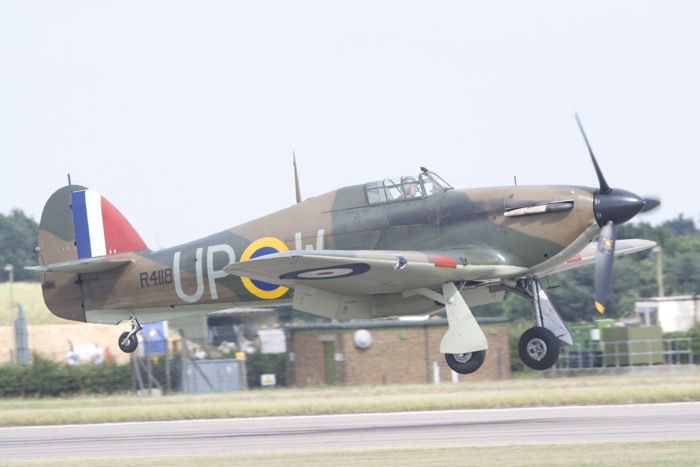 The weather was reasonably good over the weekend, unlike the preview day on the previous Thursday when the airfield was swamped with thunderstorms and lightning. 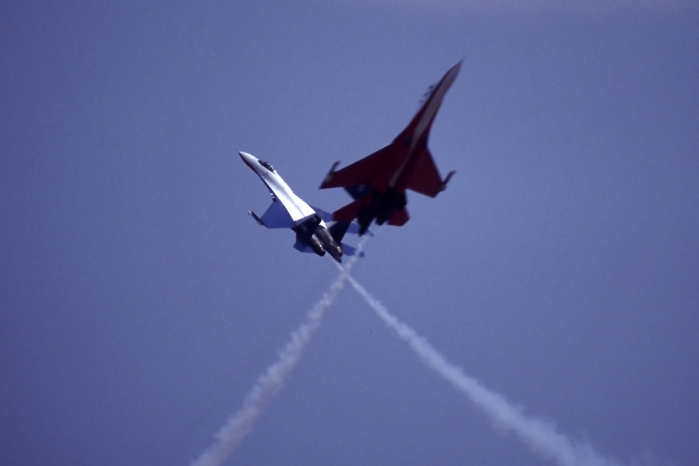 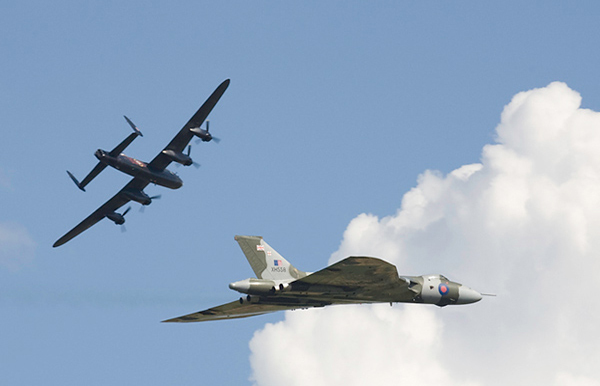 Waddington has always had a reputation for attracting aircraft from far away places, this year was no exception. 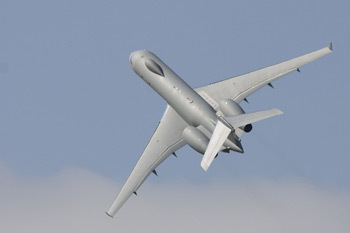 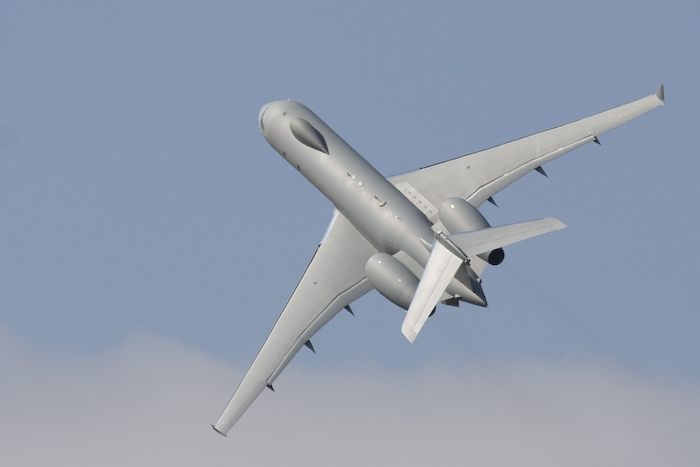 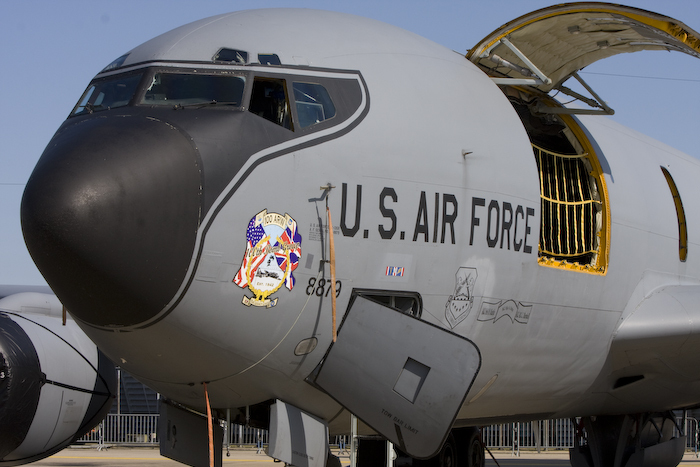 Some of the regular participants included the E-3D Sentry and Sentinel R1, which opened the show. 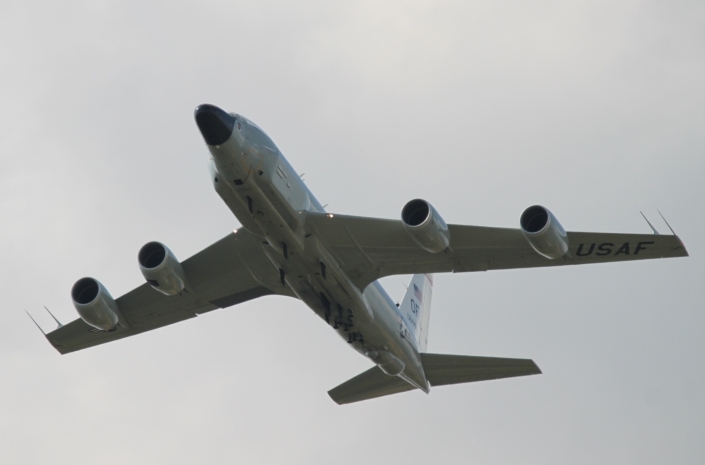 There was also a flypast by the American Air Force’s Rivet Joint, the type of aircraft that will be joining 51 Squadron next year. 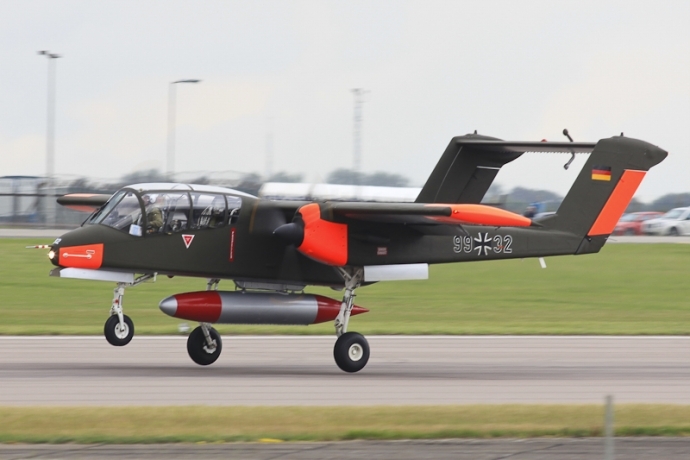 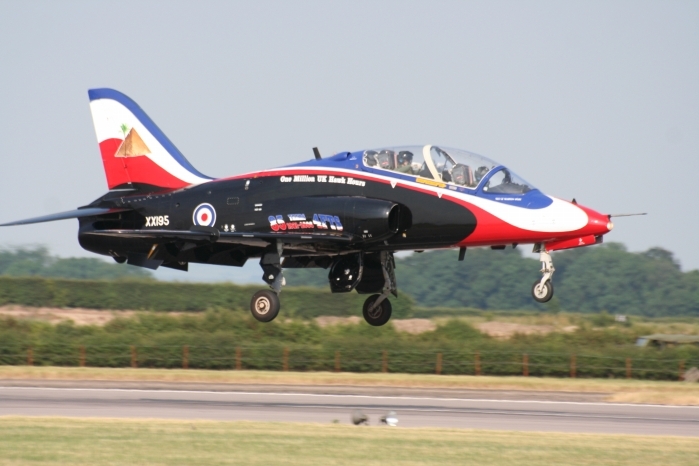 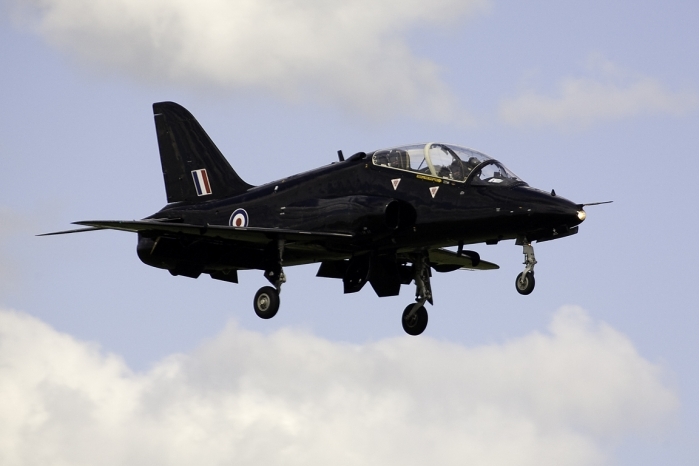 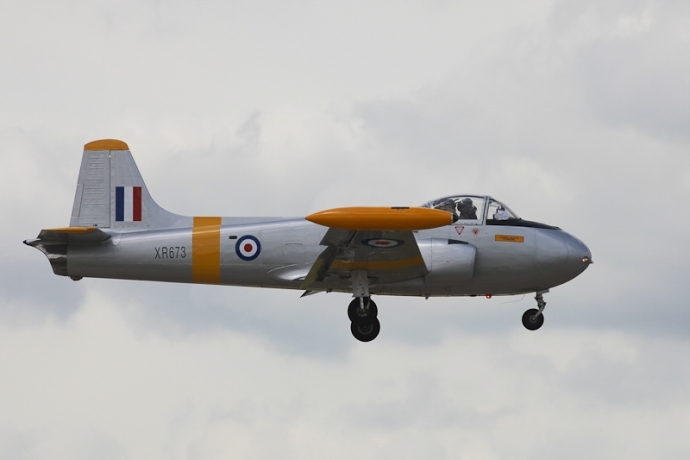 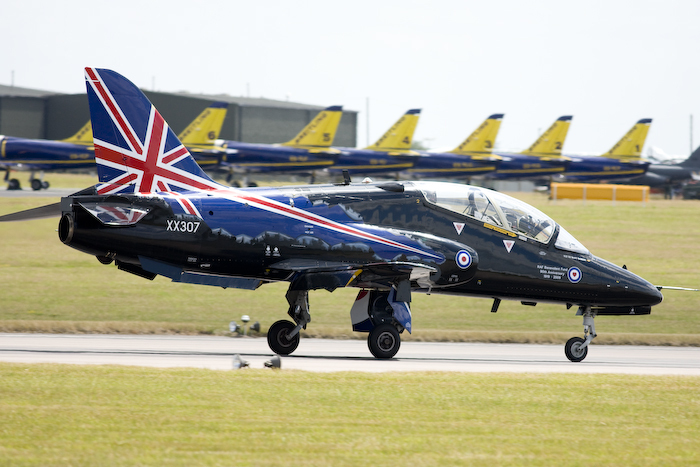 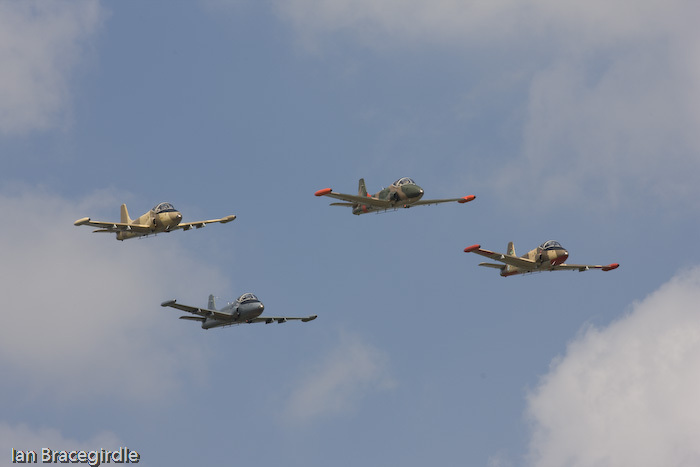 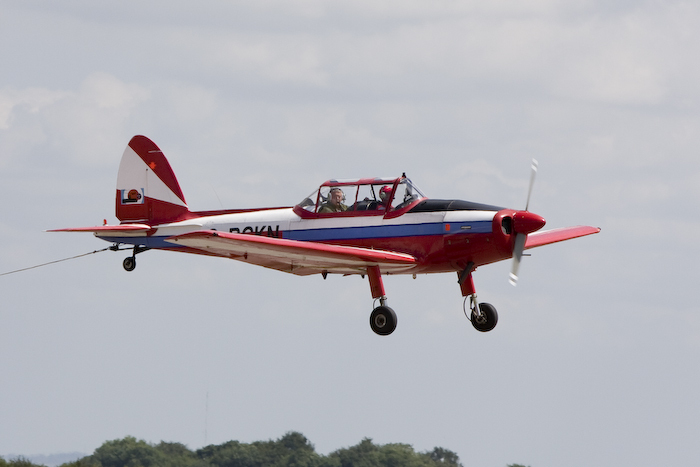 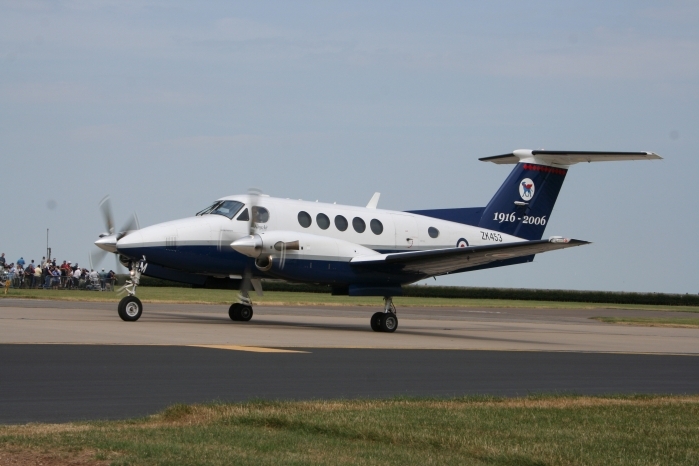 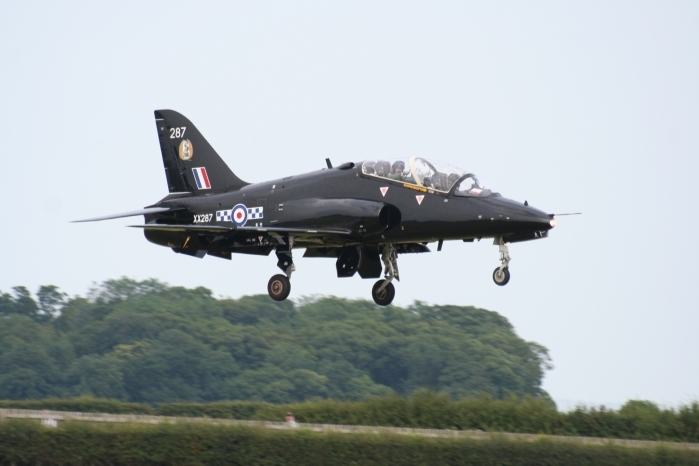 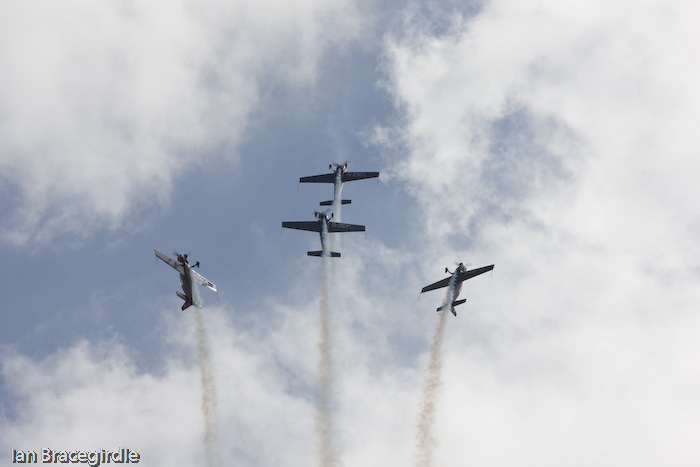 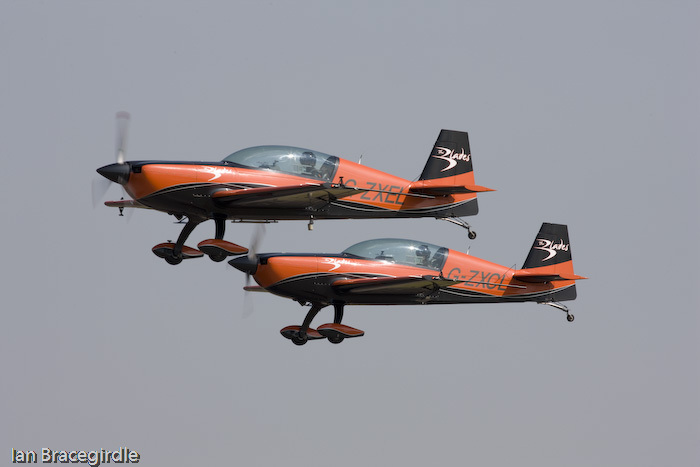 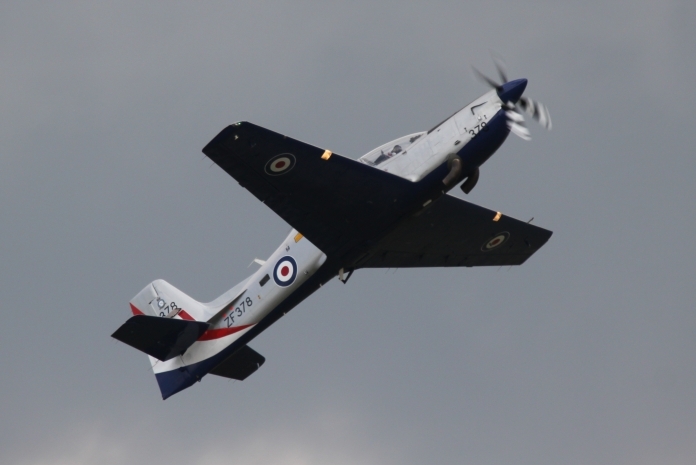 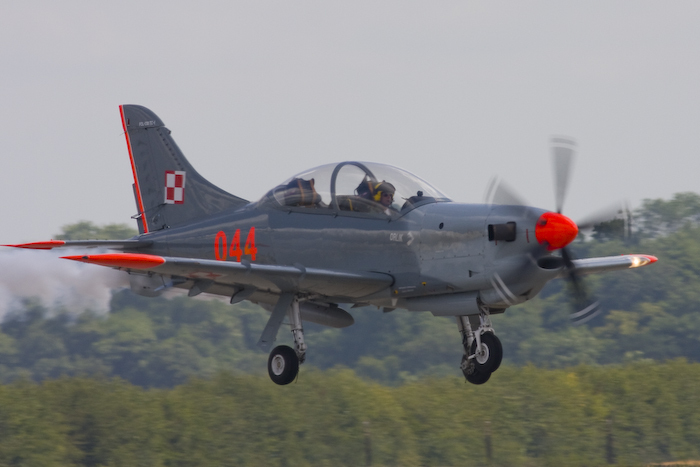 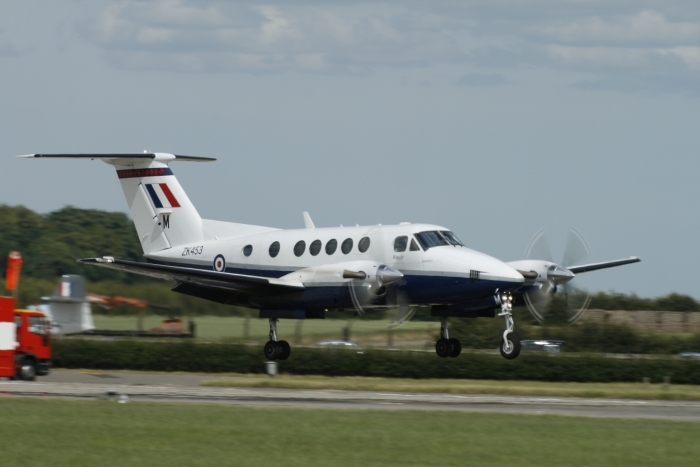 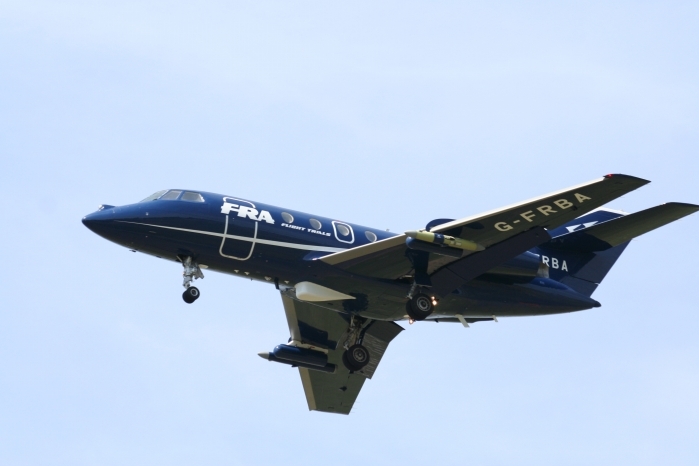 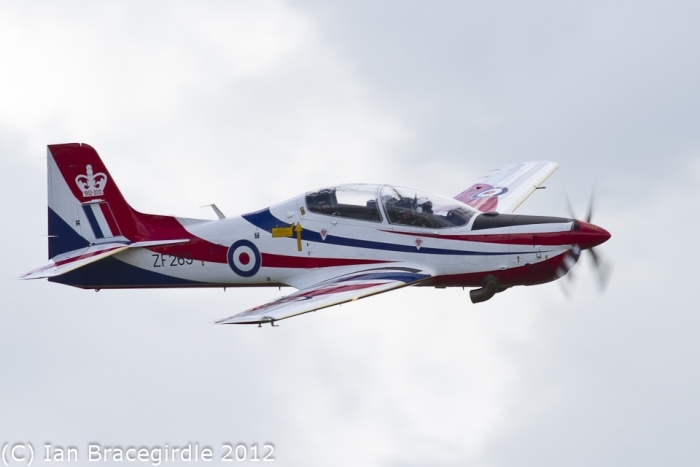 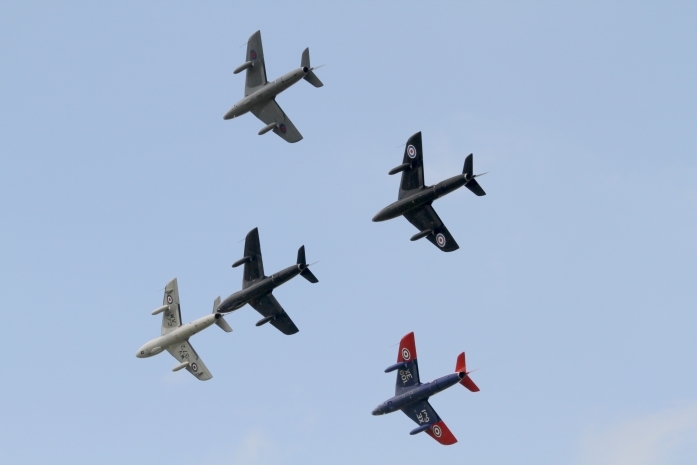 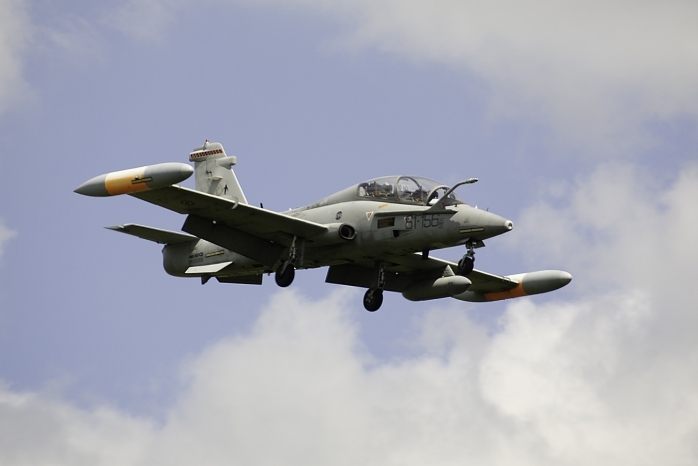 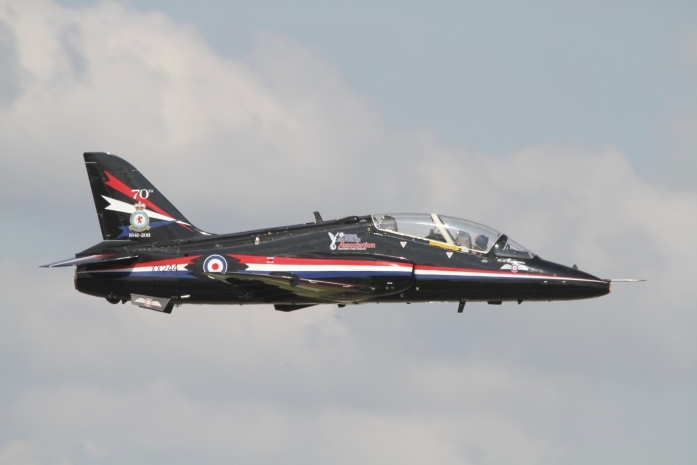 RAF regulars included the BAE Hawk, Grob Tutor and King Air, all of which put on their normal polished performances. 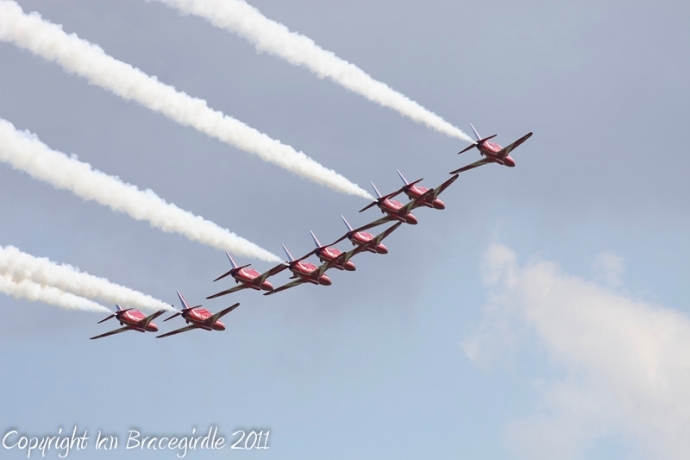 Waddington always attracts a mix of display teams, this year was no exception with our own Red Arrows and the ever popular Blades Team. 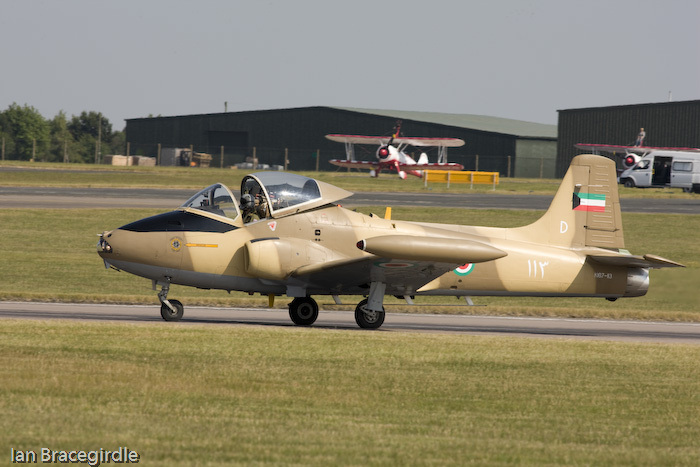 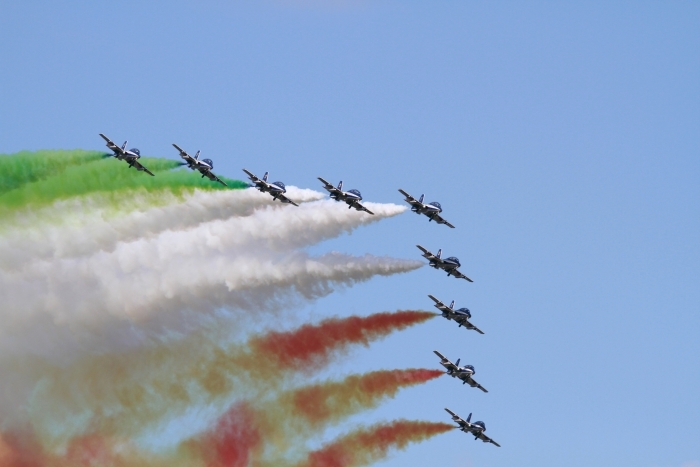 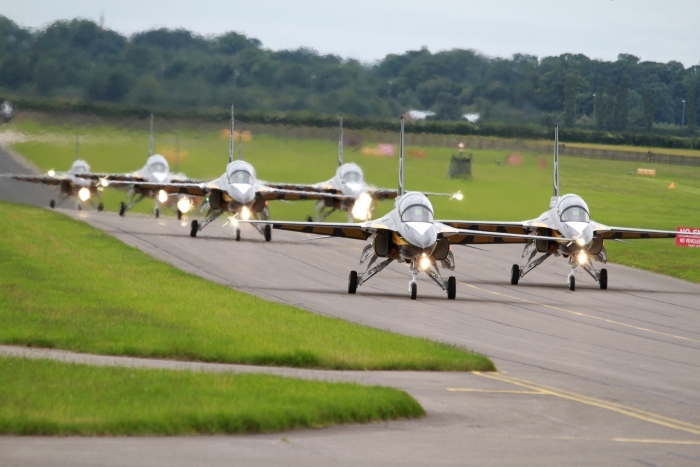 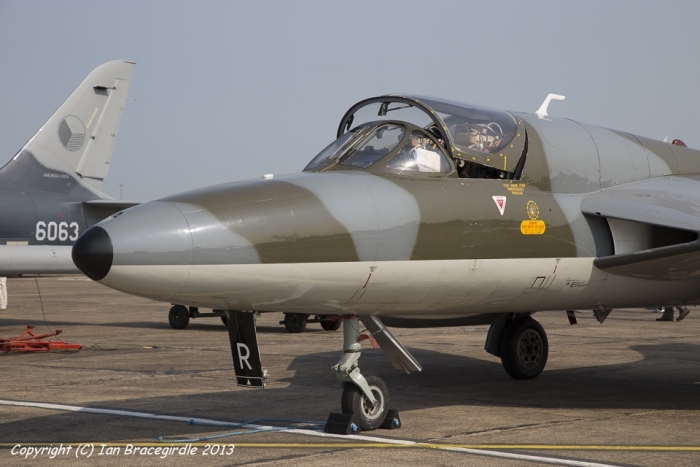 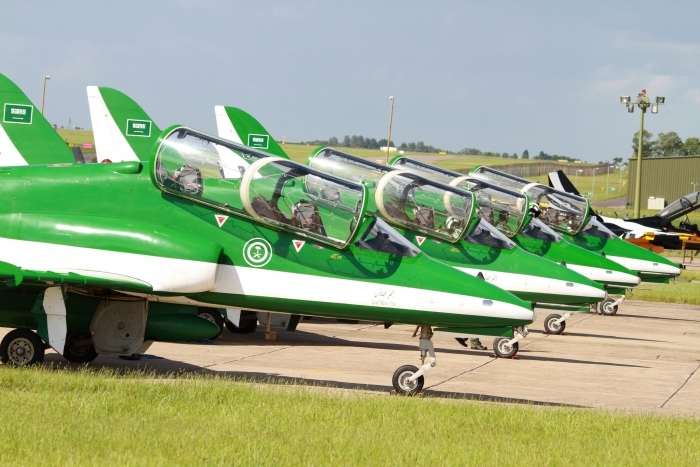 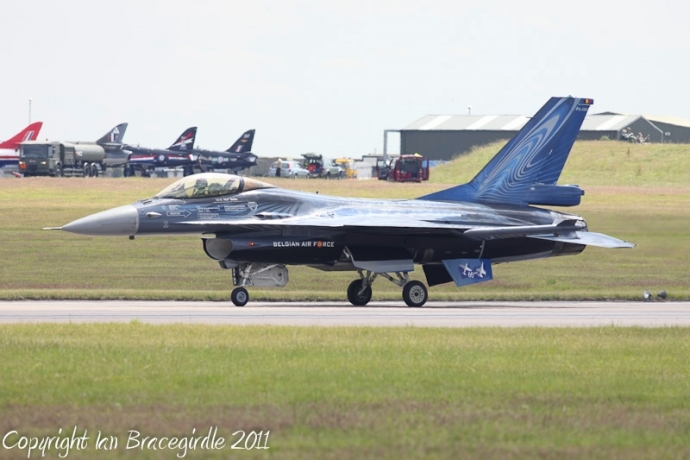 The Frecce Tricolori made a return to Waddington this year and making a debut here were the Saudi Hawks, who were one aircraft down due to the pilot being ill. Making their first ever public appearance outside of Korea were the Black Eagles, flying the T-50 Golden Eagle jet trainer. 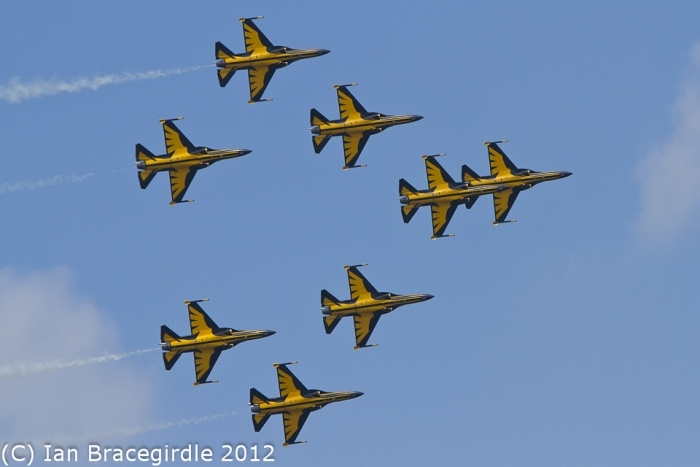 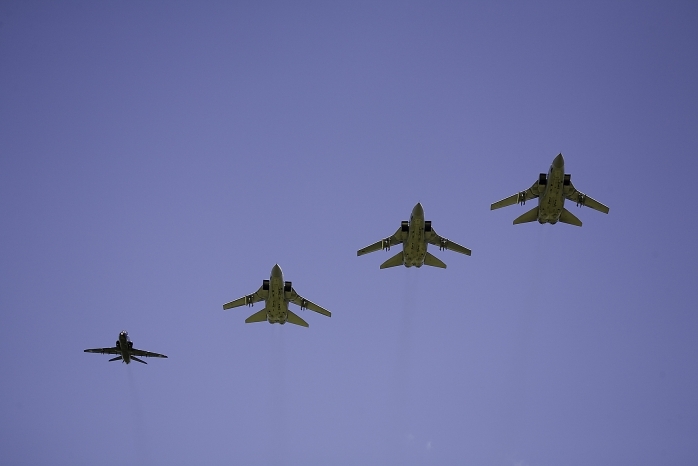 The Black Eagles put on a fast moving, well coordinated display with plenty of formation changes and variations. 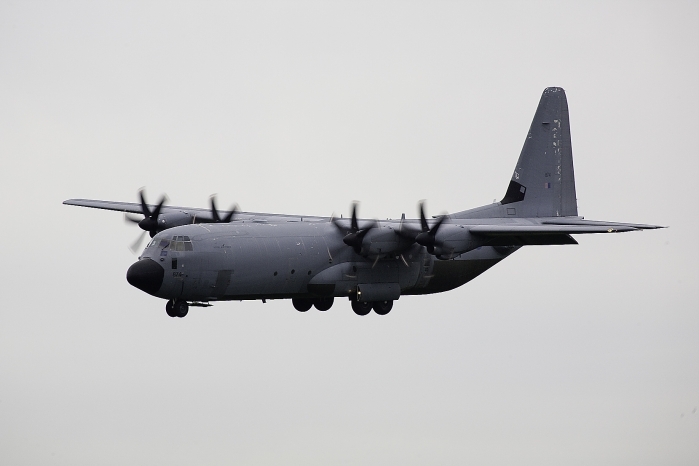 Larger aircraft visiting Waddington included C-130 Hercules from the Algerian and Belgian Air Force, the Boeing 737 Wedgetail from the Royal Australian Air Force and from the Royal New Zealand Air Force, the Boeing 757 which had brought Bomber Command veterans over for the unveiling of the new Bomber Command Memorial in London. 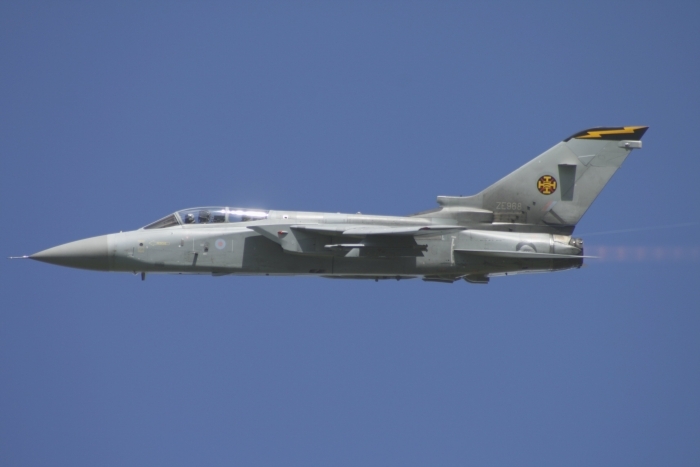 Also of note were displays by the F-18 Hornet, the Belgian Red Devils Team, and a noisy fast-moving role demo by the RAF’s GR4 Tornados. 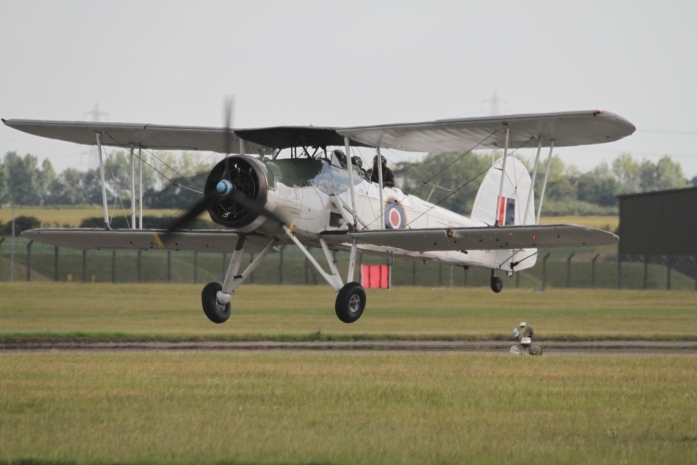 Overall a good weekend’s flying, with the added bonus of various static displays of aircraft and interesting hangar exhibits. 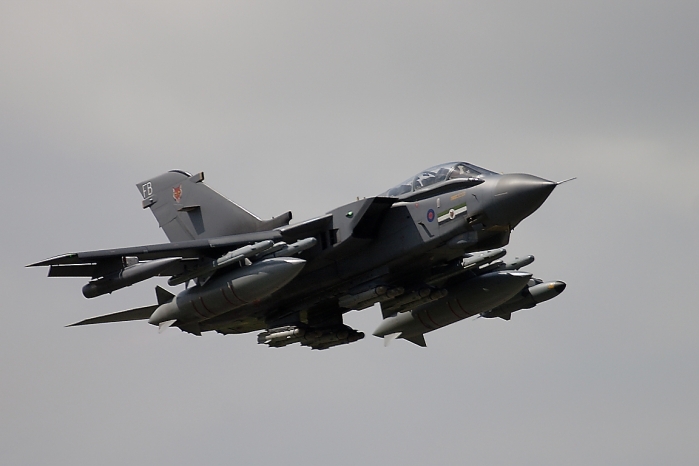 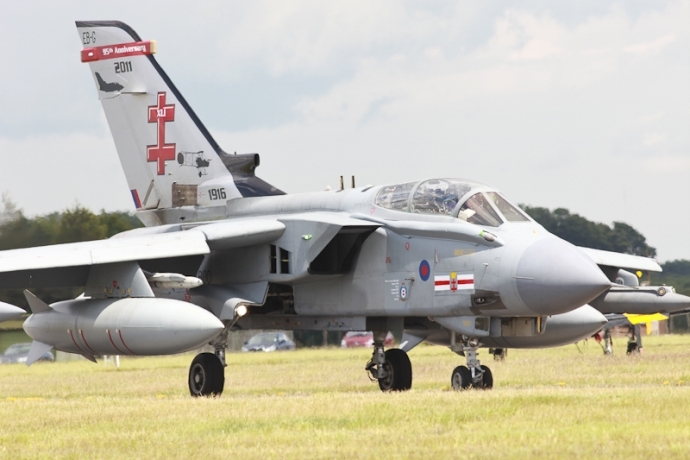 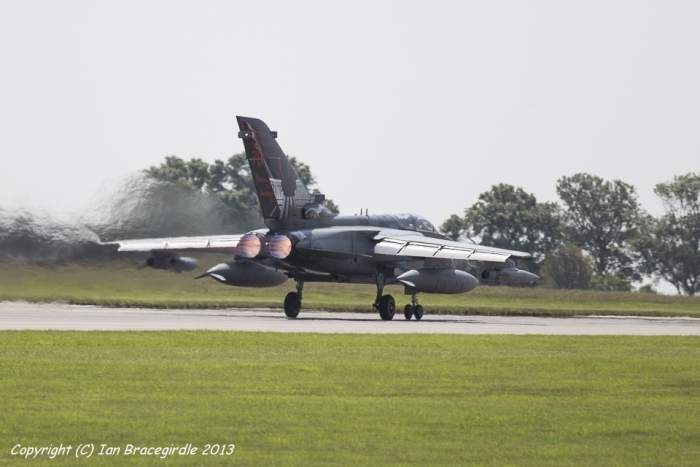 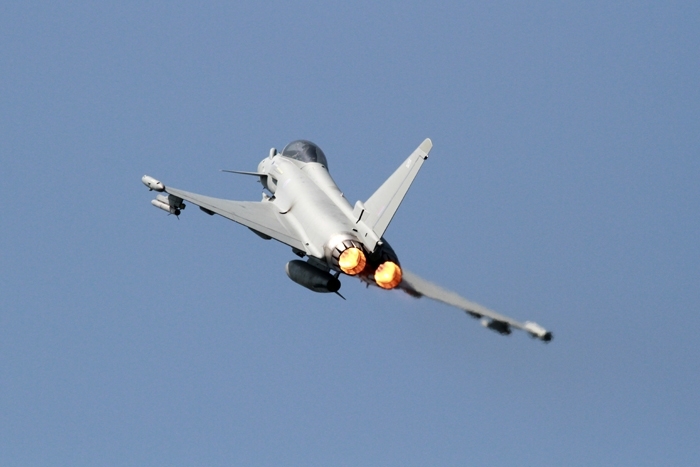 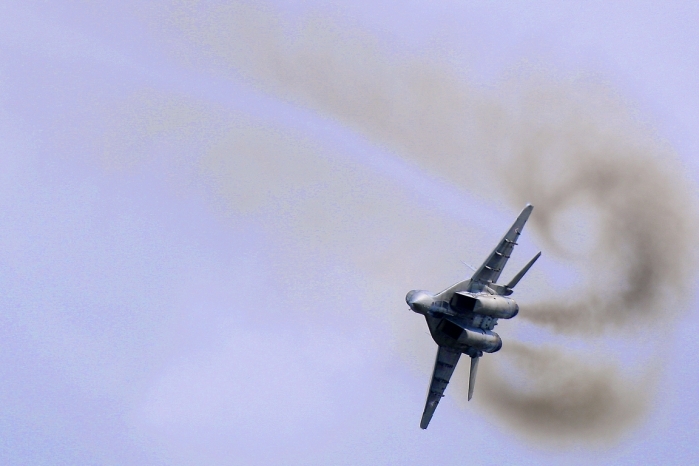 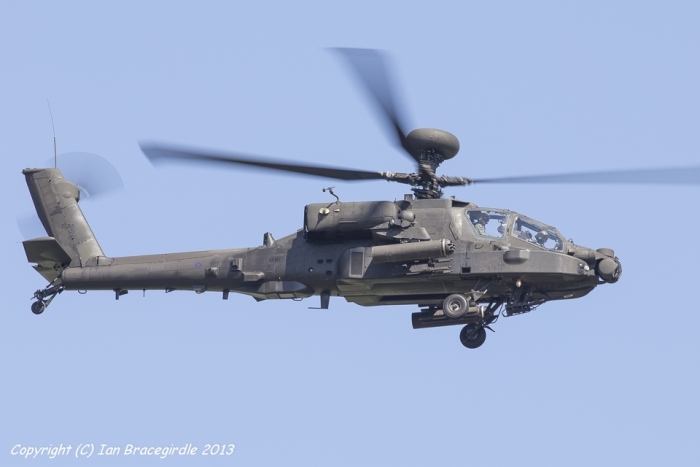 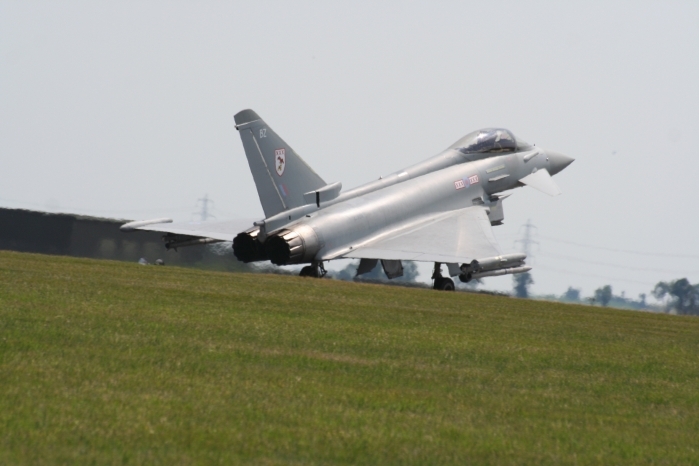 RAF Waddington's annual air show was graced with some decent weather for this year. 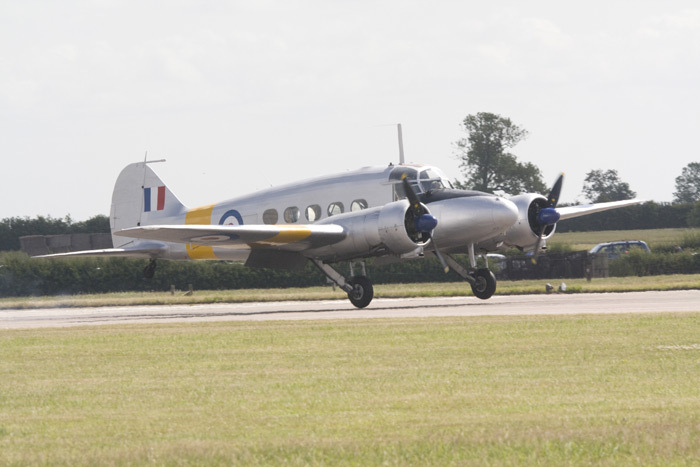 With an interesting and varied line up of aircraft displaying this year, we welcomed back aircraft not seen in this country for some years. 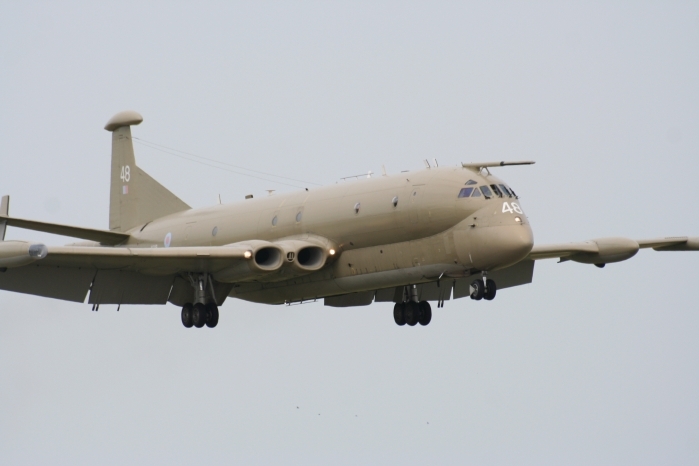 The static line up had a mix and match of both military and Ex Military aircraft, including Nimrod R1 XV249 and XW664 just retired from 51 Squadron, a nice line up of Jet Provosts and various current RAF aircraft. 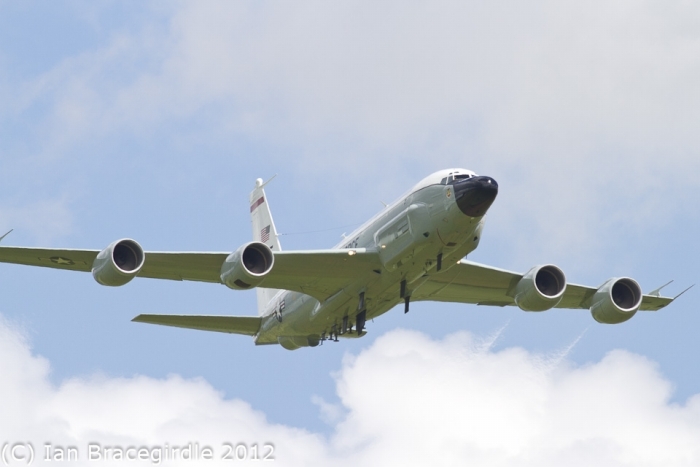 The flying got off to a good start with a run through of a Boeing RC-135 Rivet Joint followed by almost seven hours of superb flying. 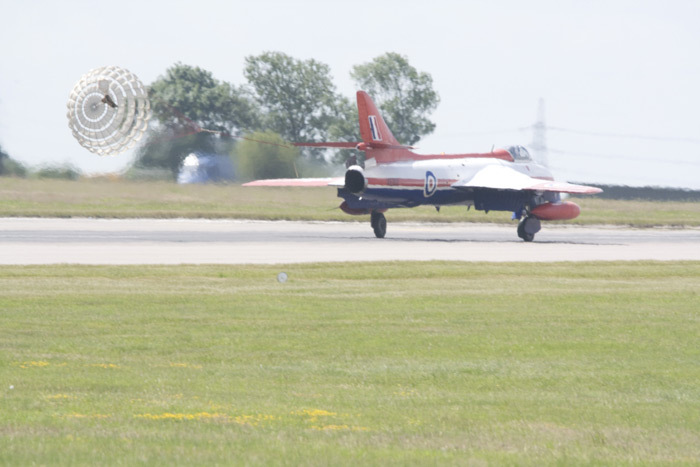 One of the highlights of the two-day event was the usual noisy display by the Avro Vulcan, another highlight were The Thunderbirds flying their F-16 aircraft. 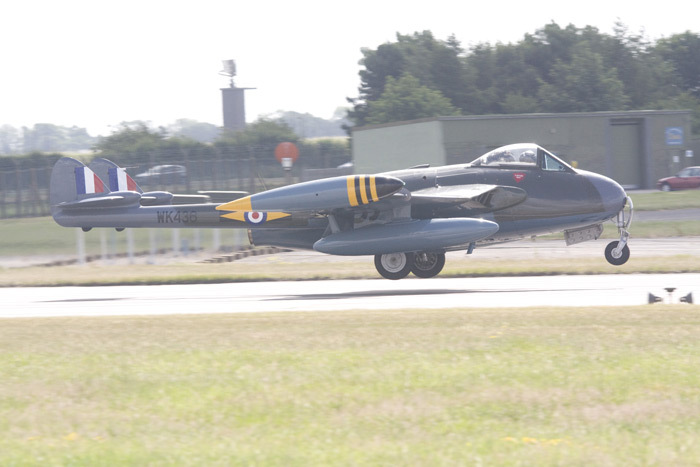 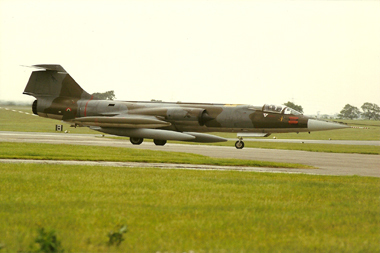 Another first were Team Viper with their five Hawker Hunters, also of note were the pair of Vampires and the Bronco. 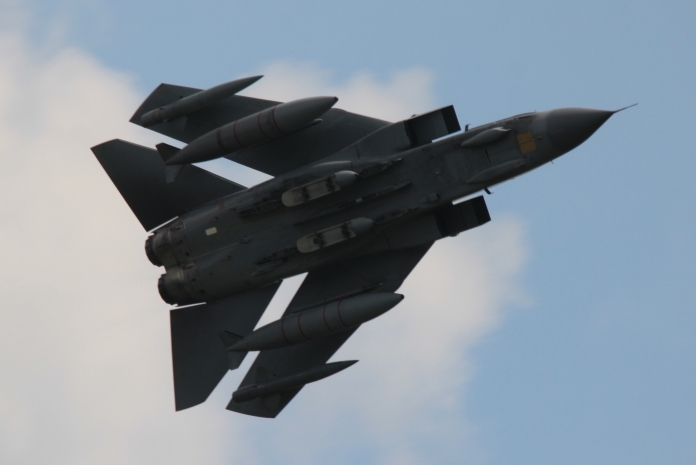 As well as unusual aircraft, there were displays from The Red Arrows, The Battle of Britain Flight and the Tornado role demo. 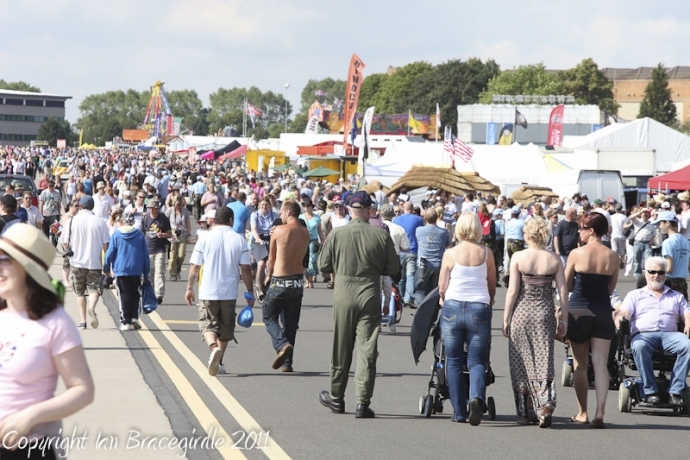 On the whole a smooth running show with a good selection of exhibits. 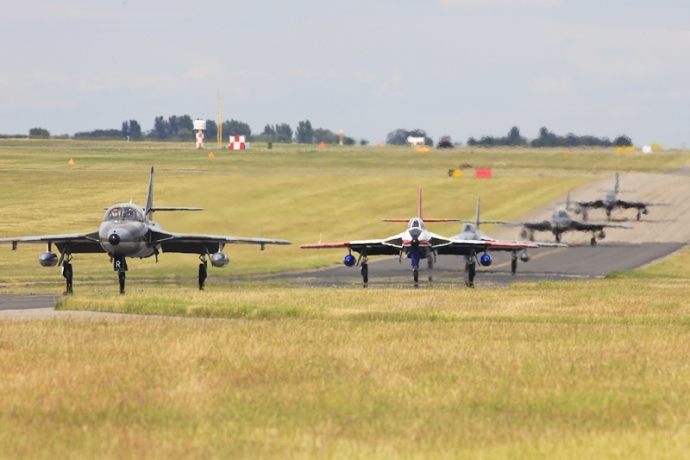 As Waddington Air Show gets ever nearer, when we get to the arrival/practice day this part of Lincolnshire starts to get very busy with a steady stream of aircraft arriving at Waddington. 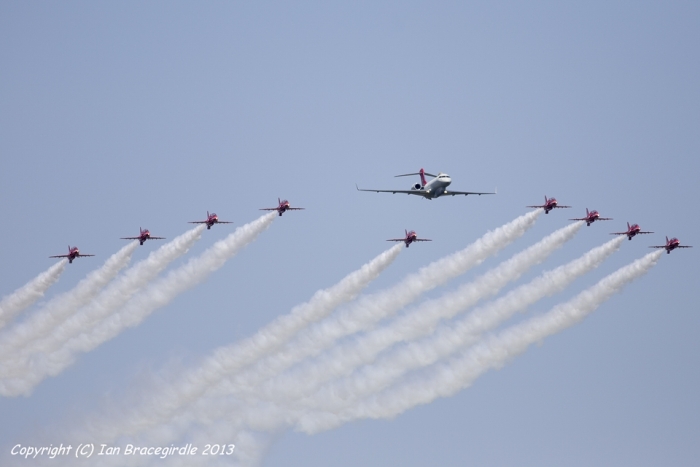 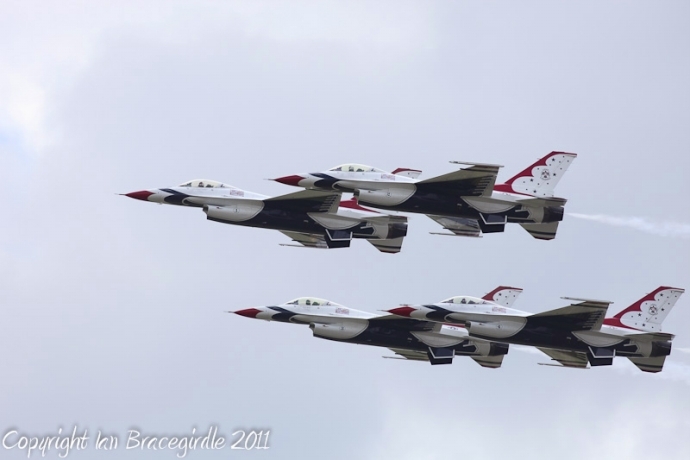 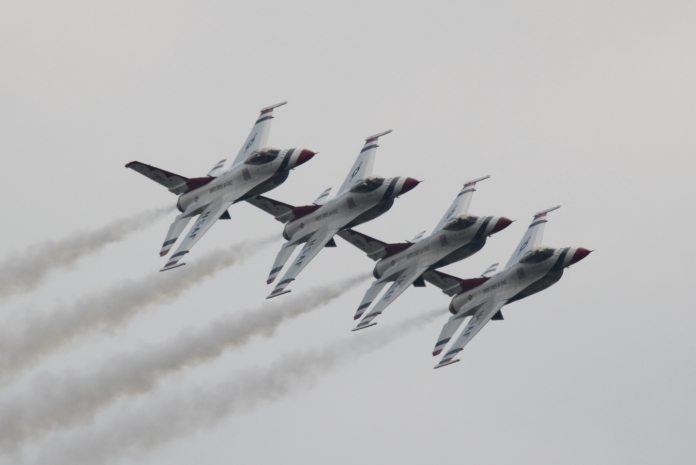 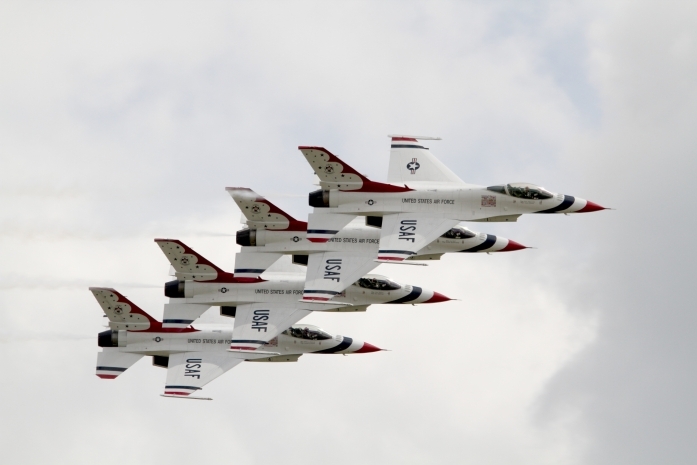 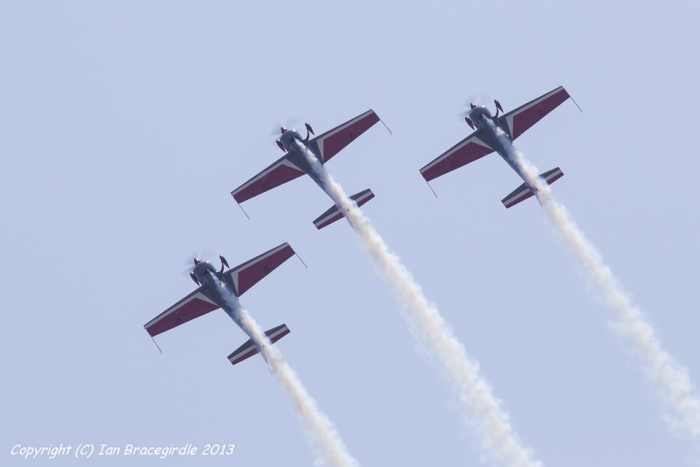 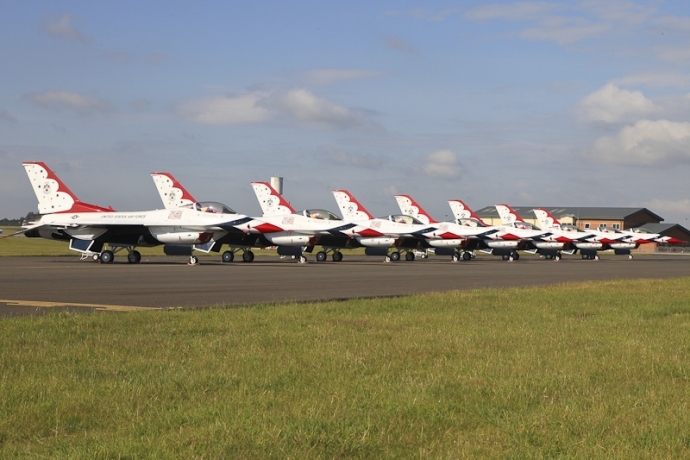 One of the eagerly awaited participants for this year was the world famous Thunderbirds Display Team. 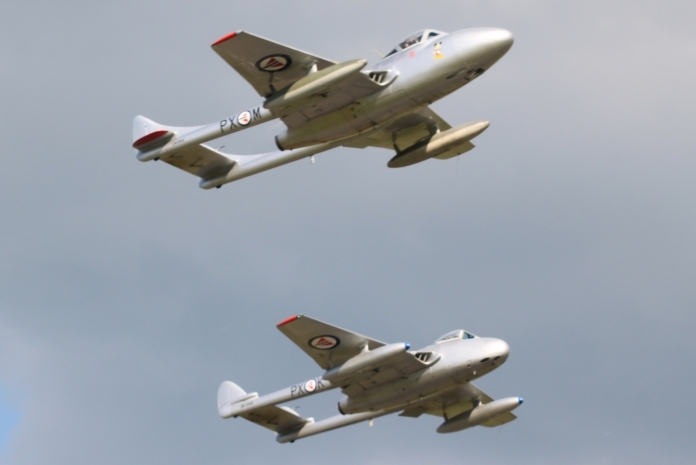 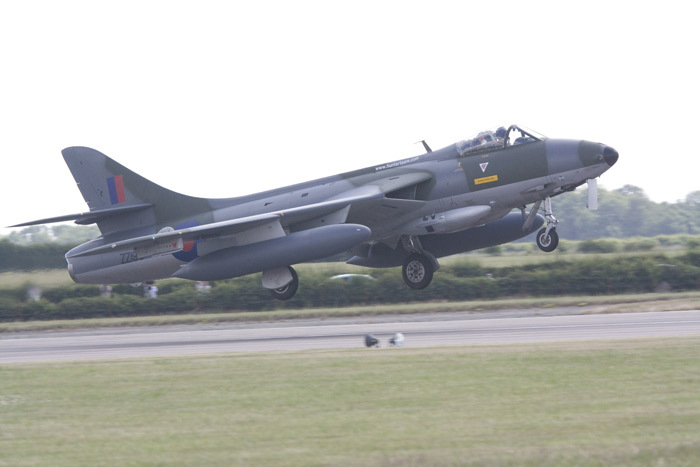 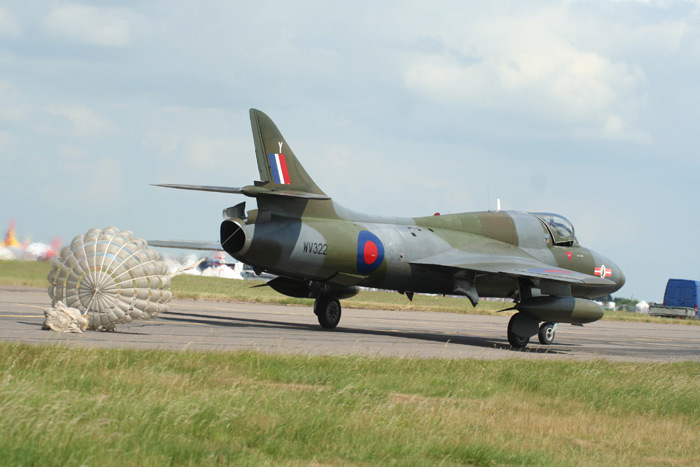 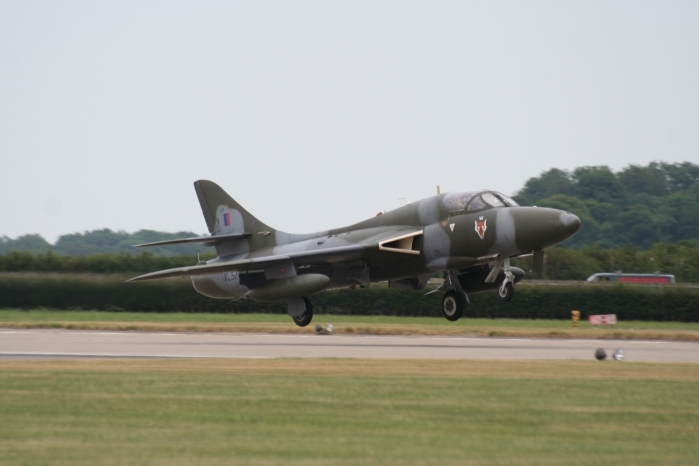 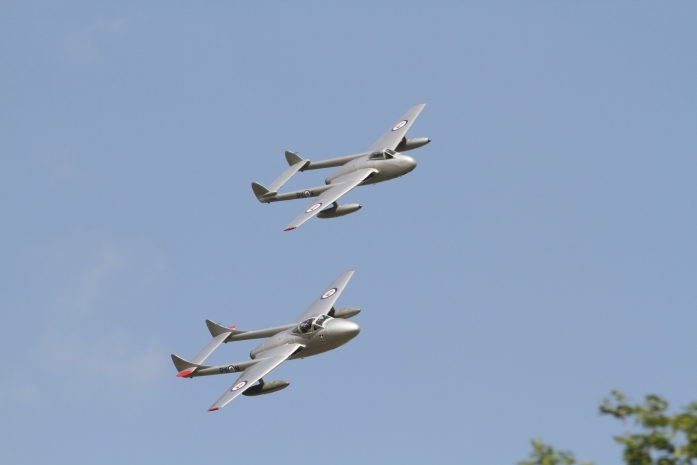 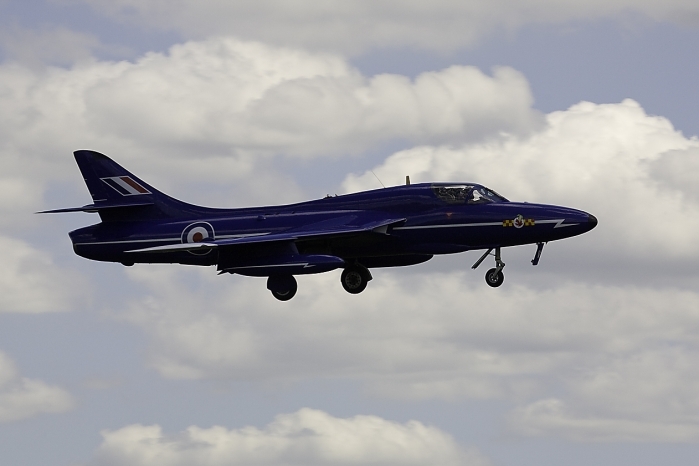 Also flying this season were five Hawker Hunters from Team Viper, other favourites included the Avro Vulcan. 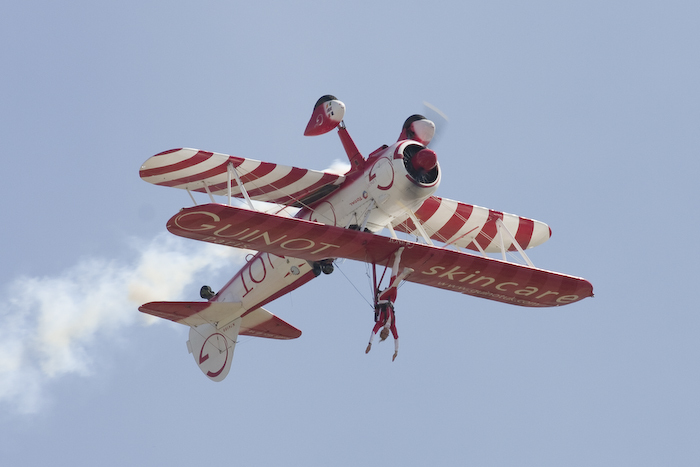 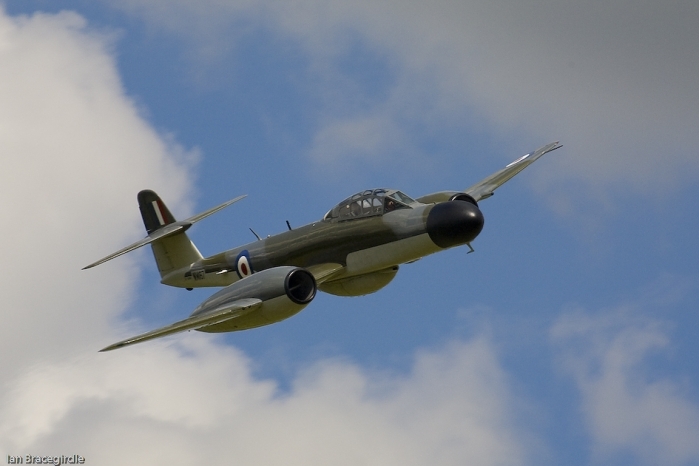 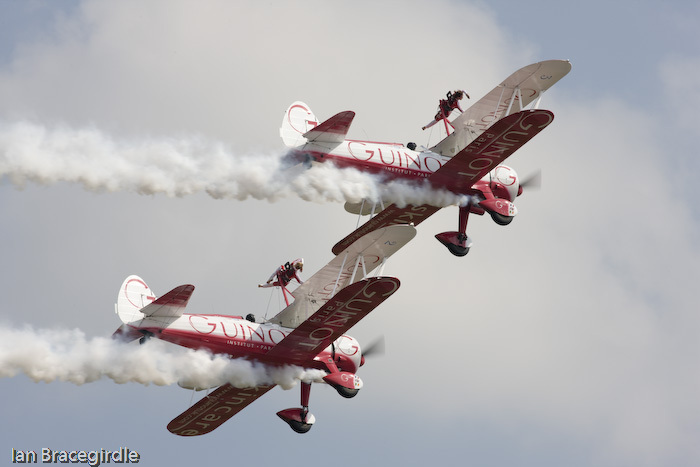 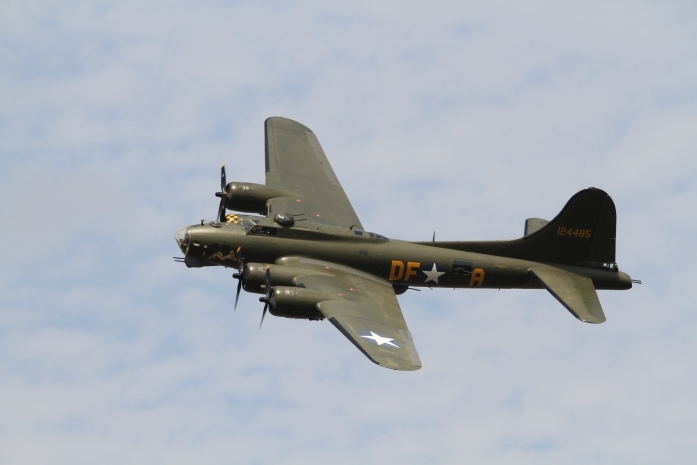 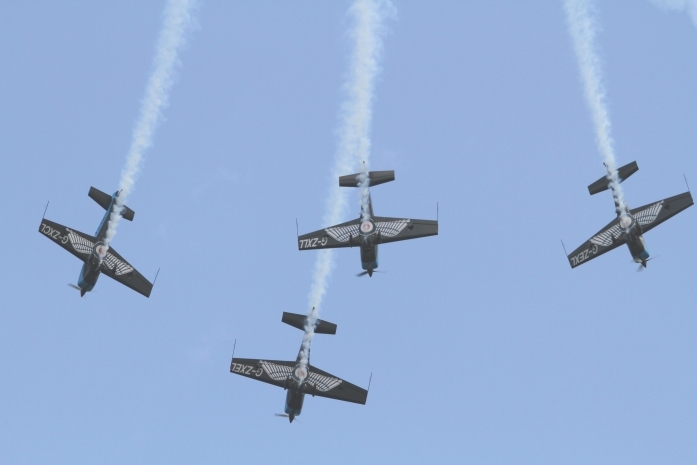 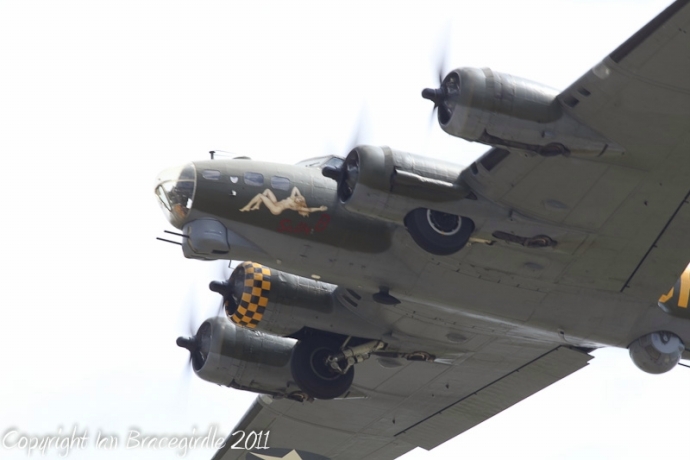 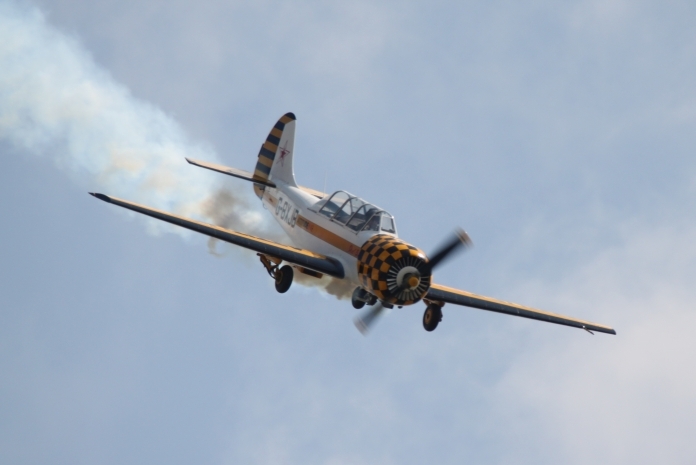 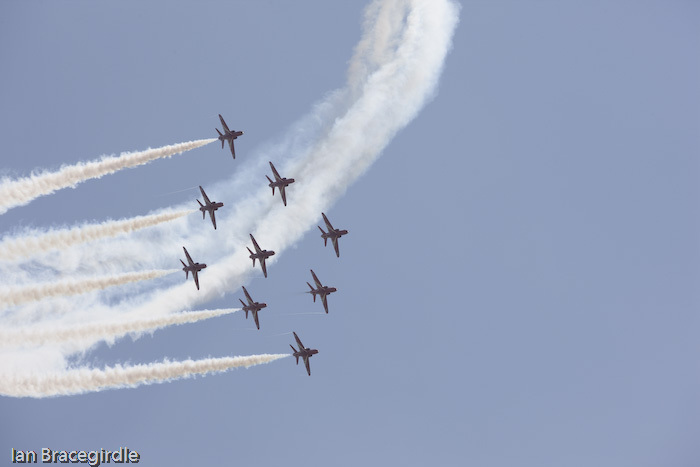 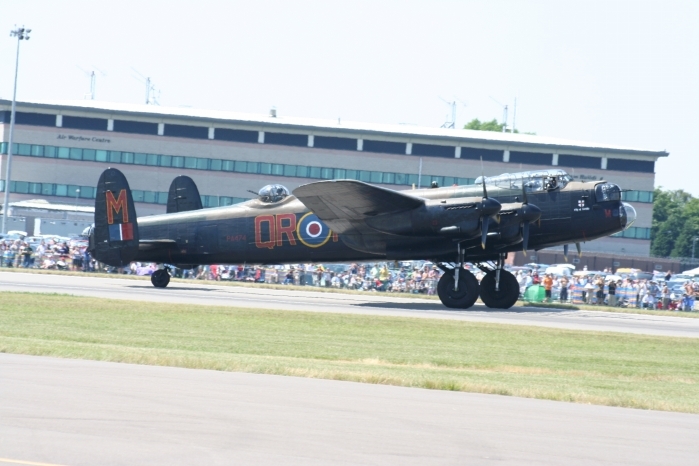 Saturday was the first day of Waddington's two-day show, with almost unbroken sunshine for the whole day. 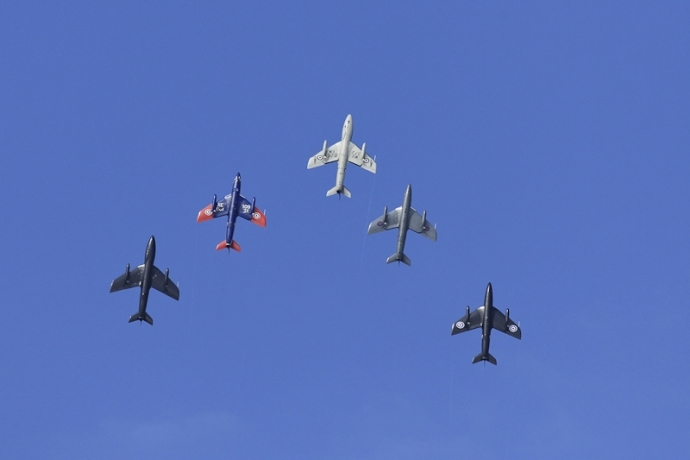 As usual the static line up was very varied with over 100 aircraft on display. 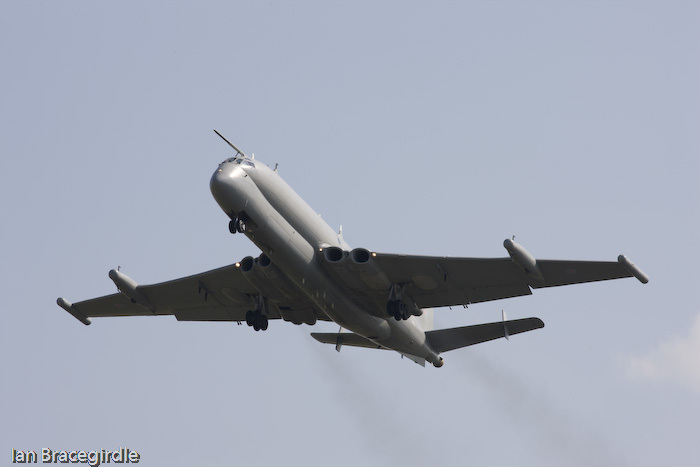 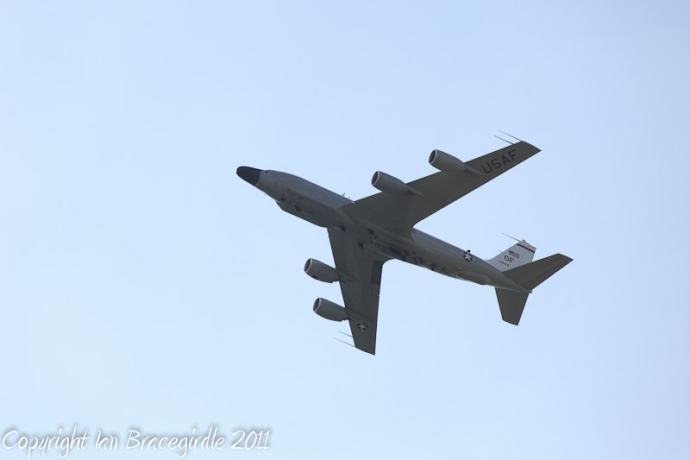 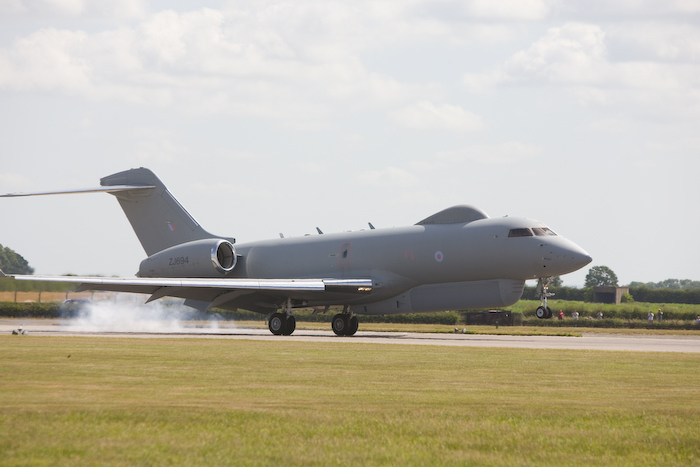 The flying got off to an early start at 10am, with the usual flypast by base aircraft, with a Nimrod R1, Sentinel and E-3 Sentry. 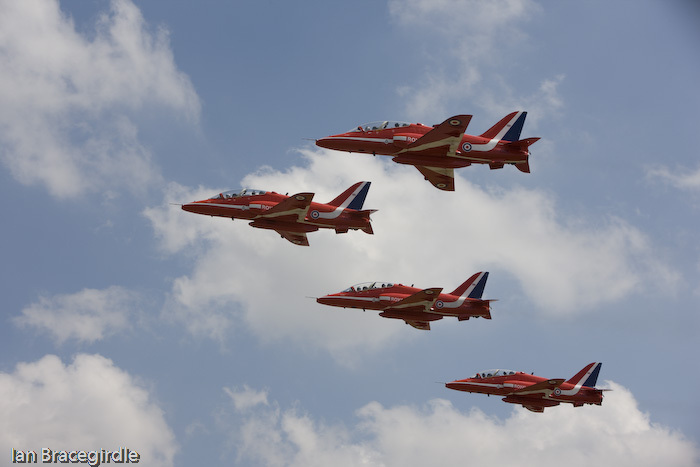 The flying programme included The Red Arrows flying an eight-ship formation due to one of the pilots being ill, a role demo by a pair of GR4 Tornados and a Spitfire, Hurricane and the Lancaster. 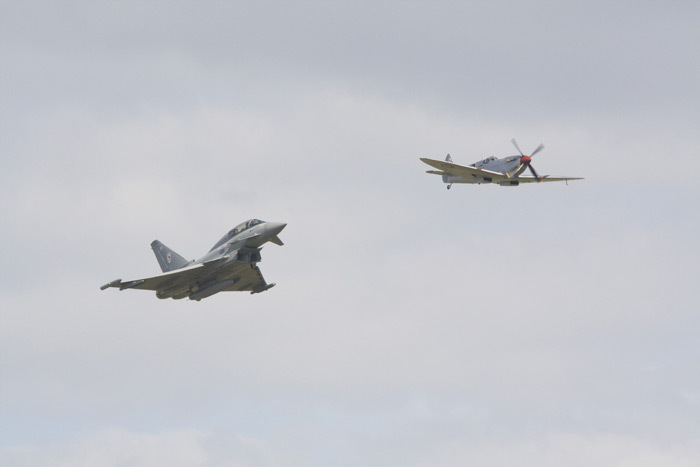 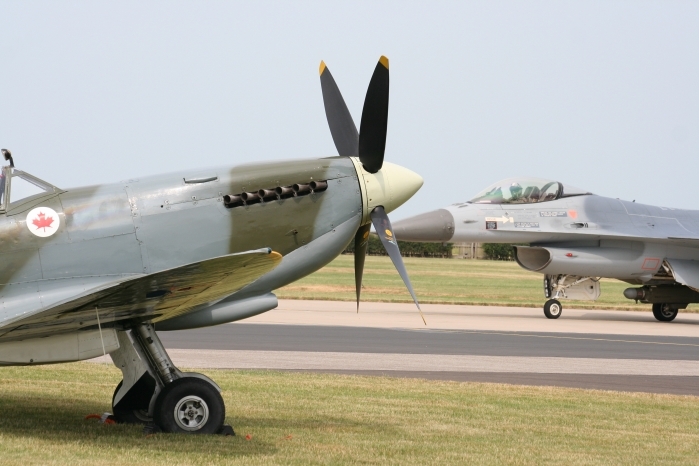 Also an interesting pairing of the old and the new, a BBMF Spitfire and a Typhoon. 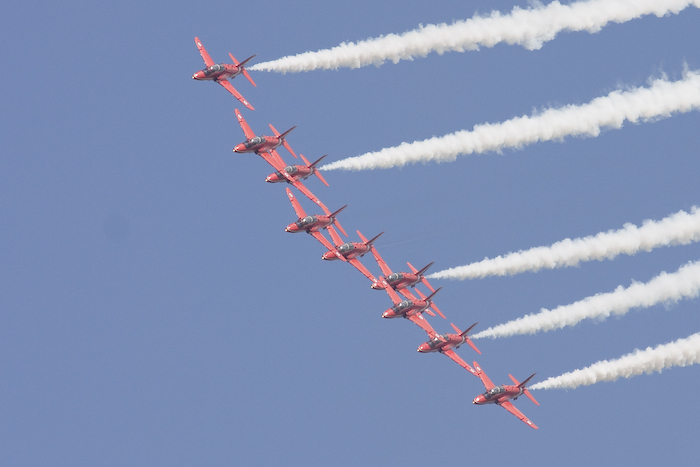 After many years absence it was nice to see the routine put in by The Turkish Stars and hear their well polished commentator describing the manoeuvres as they were performed. 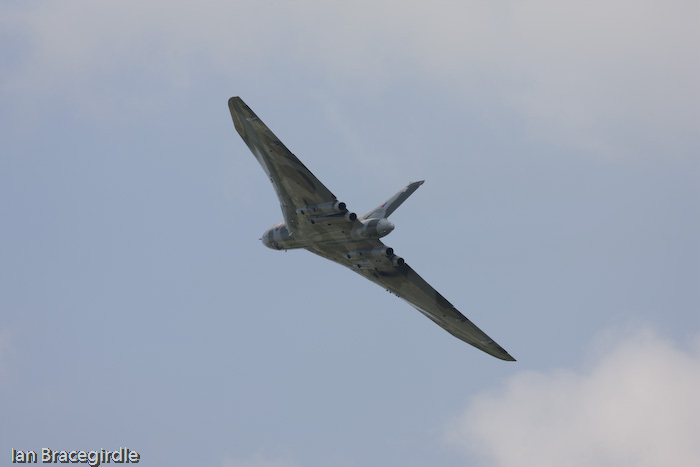 Probably one of the highlights of the Waddington weekend was the Avro Vulcan. 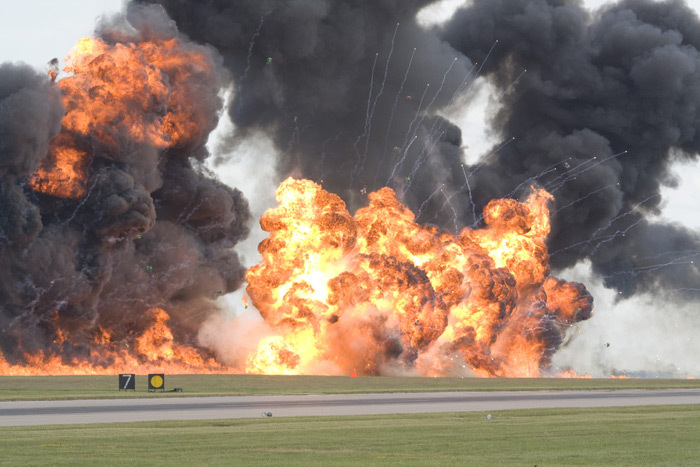 The question was. 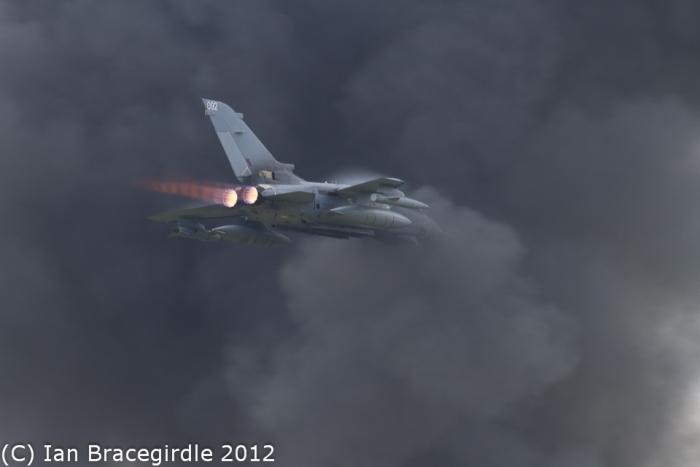 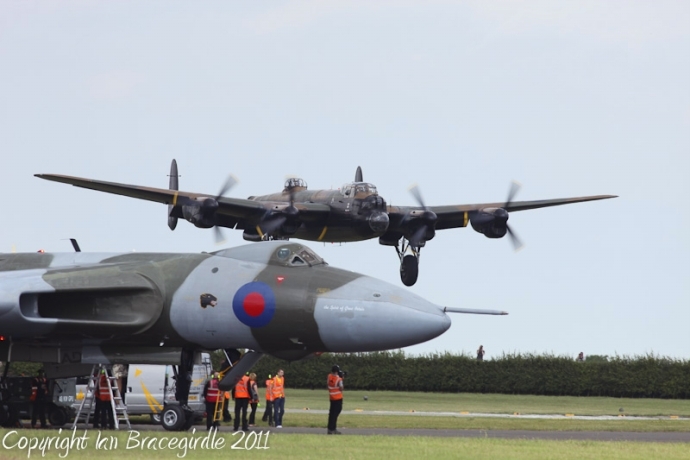 Was it going to get to Waddington or not? 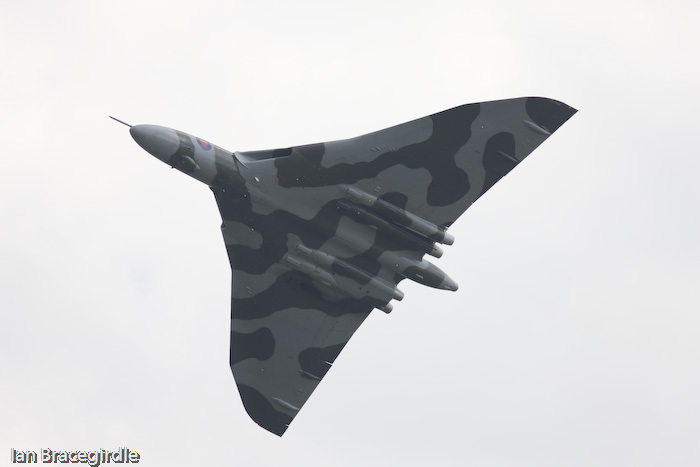 I am reliably informed that the Vulcan ground crew put in a tremendous effort to get the aircraft serviceable for this weekend, having disappointed so many people at last years show due to a paperwork error, but Vulcan fans were not disappointed as the aircraft turned up on time and put in a tremendous display, which was well worth the journey. 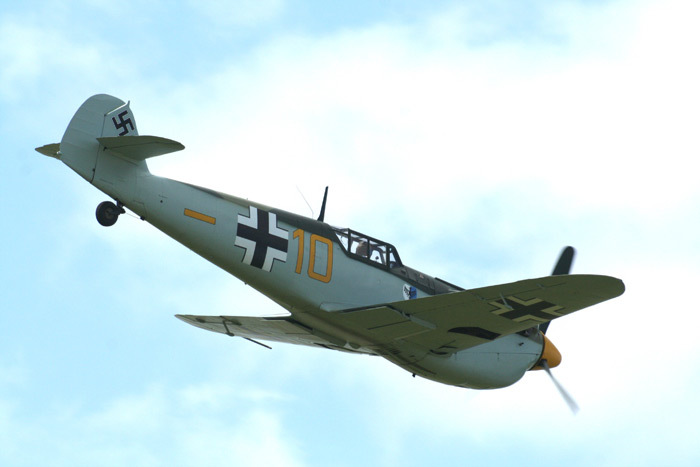 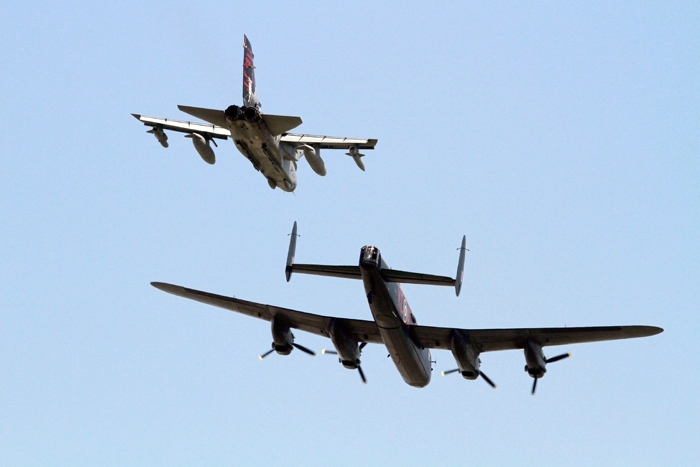 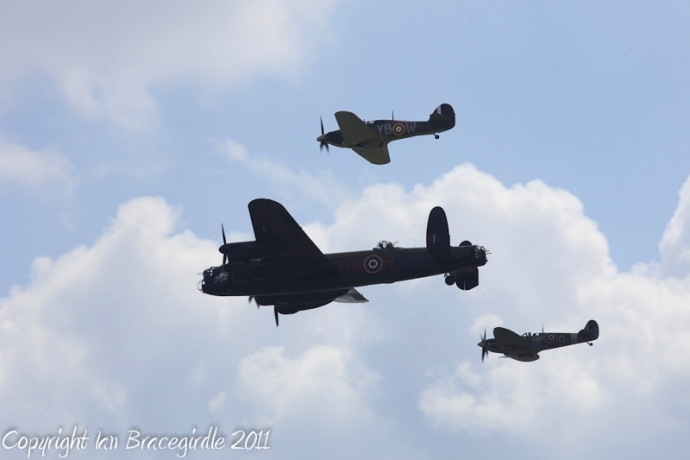 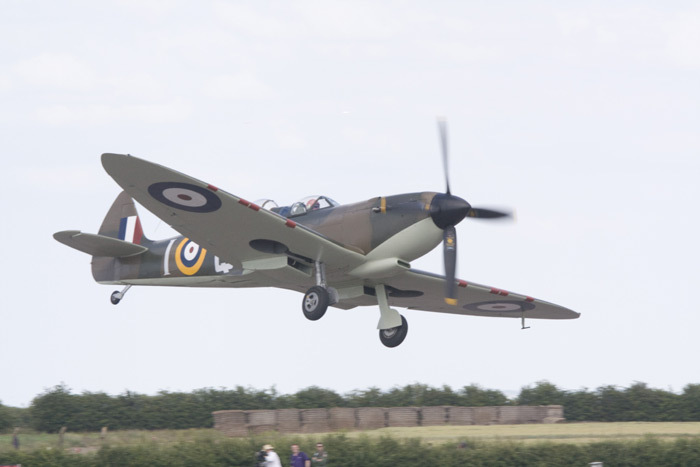 Later in the afternoon it was the turn of the World War II fighters simulating dogfights overhead Waddington's runway. 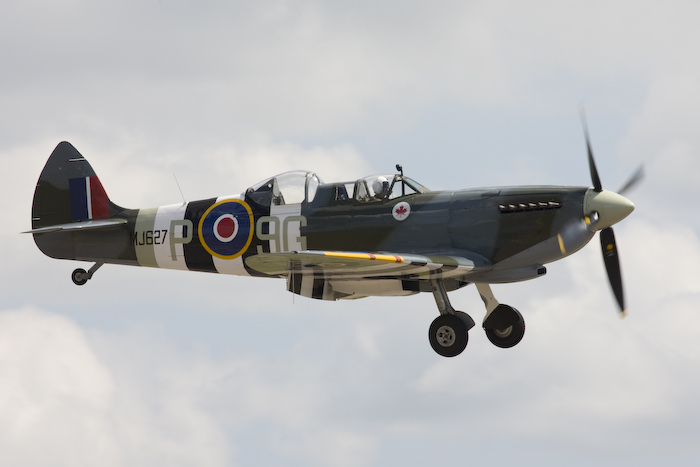 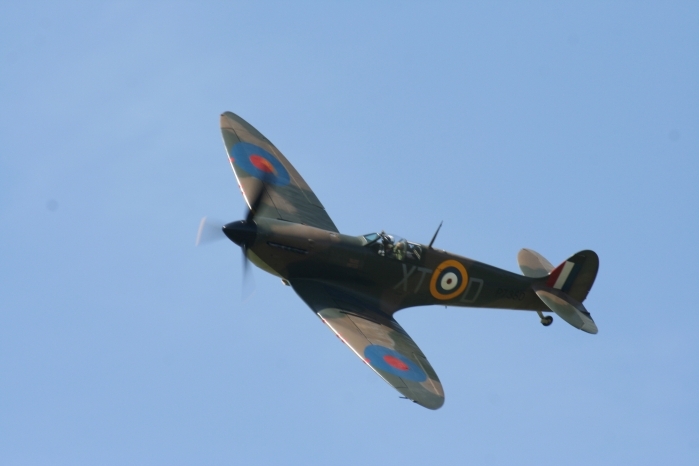 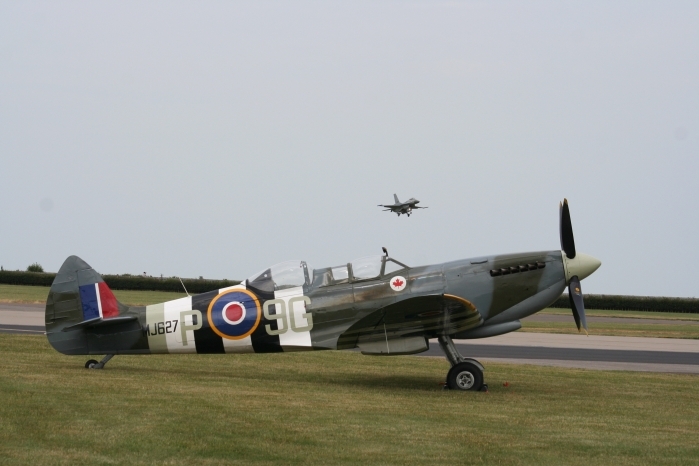 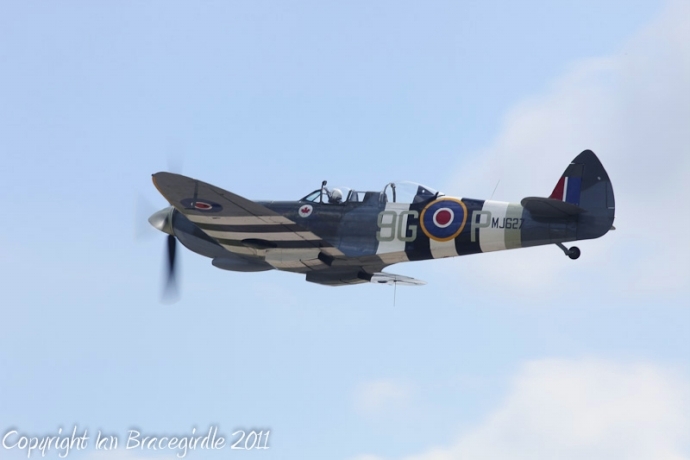 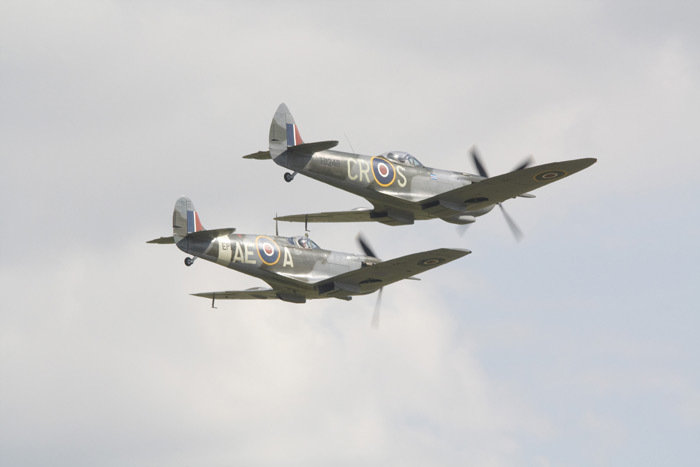 The sound of Merlin engines reverberating around the airfield brought back memories of the wartime years. 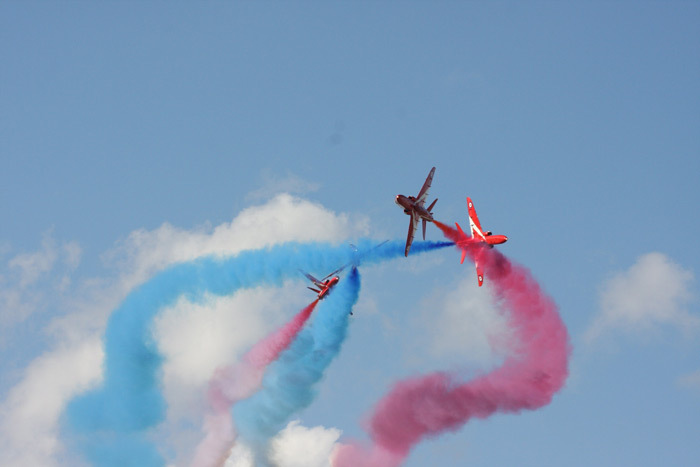 The fifteenth annual Waddington Air Show. 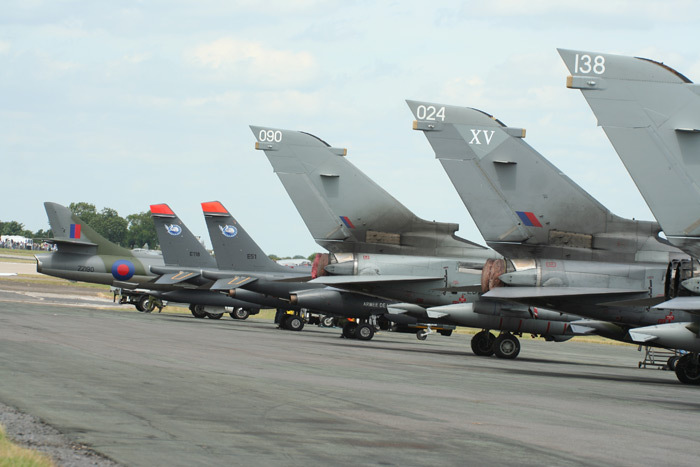 Aircraft represented in the static part, VC10, C-130K Hercules, KC-135, a 41 R Squadron Harrier GR9, most RAF types and even the old faithful German F-4 Phantom. 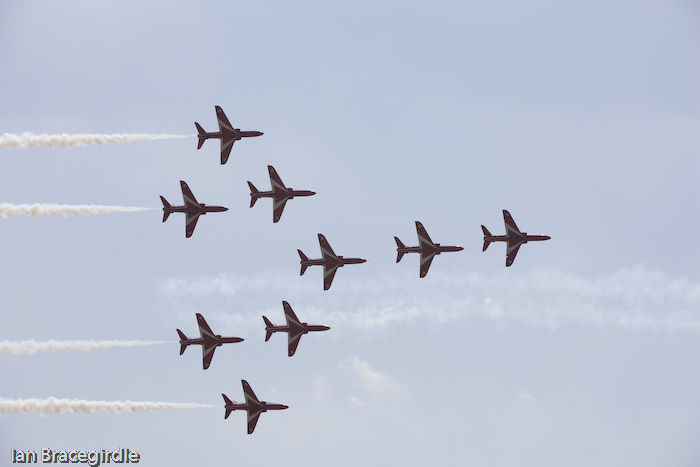 Representative aircraft in the flying display were the E-3D Sentry, Sentinel R1 and Nimrod R1, The Blue Eagles Helicopter Display Team, The Blades and as usual The Red Arrows display. 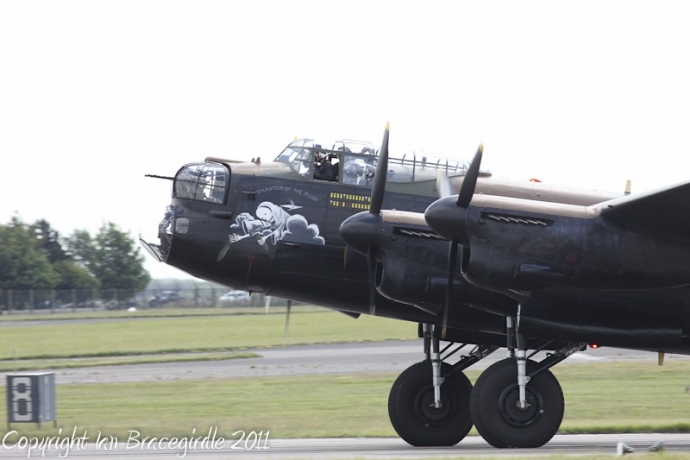 On the whole with reasonable weather conditions Waddington turned out as another successful air show. 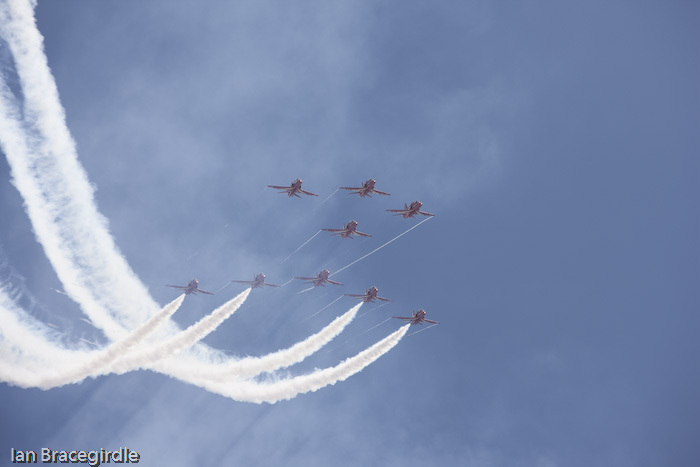 With almost a full day of unbroken sunshine Waddington Press Day got off with a stunning display by The Red Arrows. 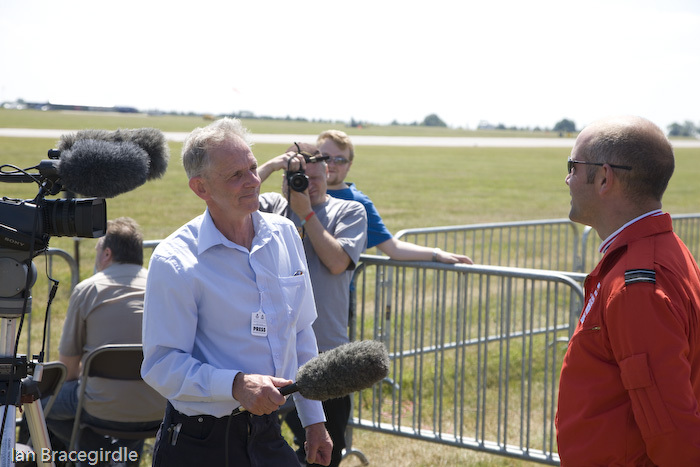 Whose pilot's later in the day visited the press enclosure to carry out interviews for the media etc. 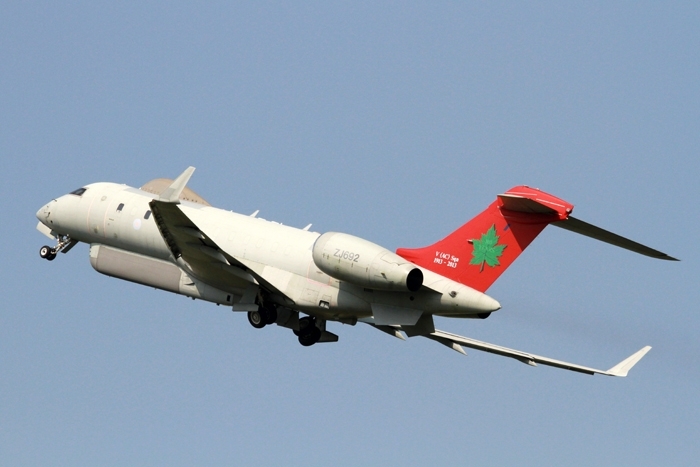 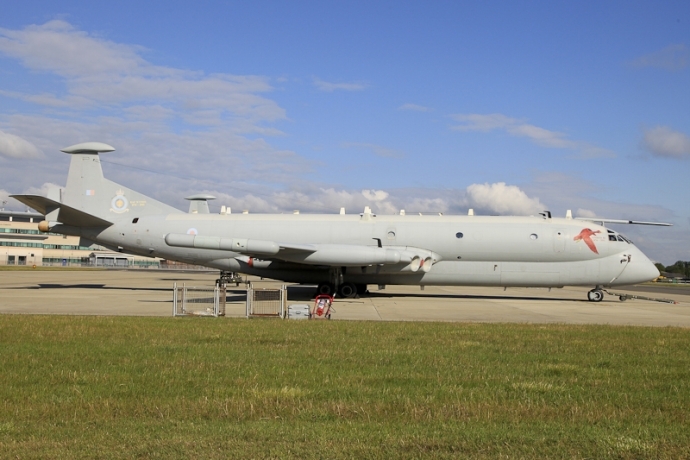 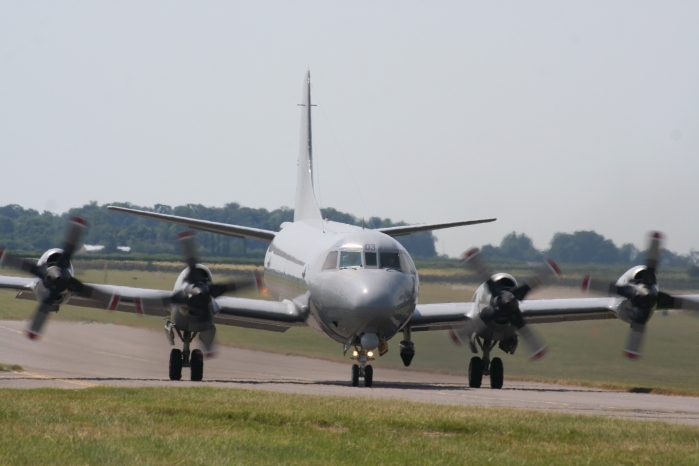 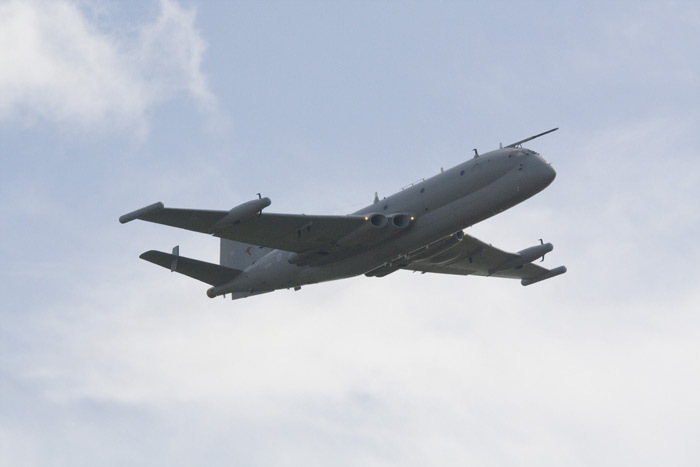 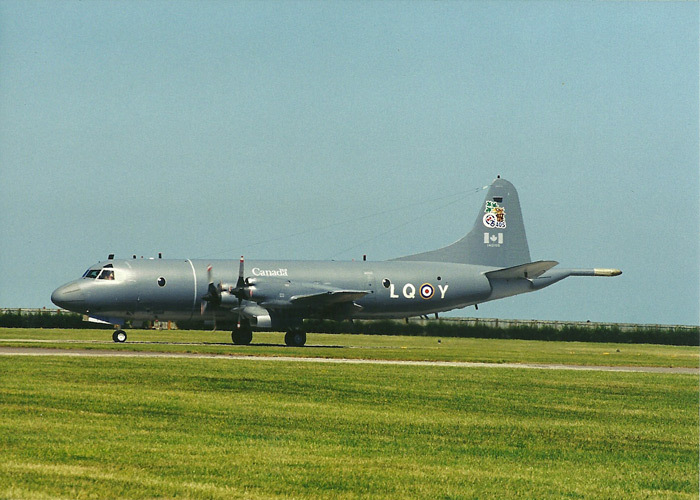 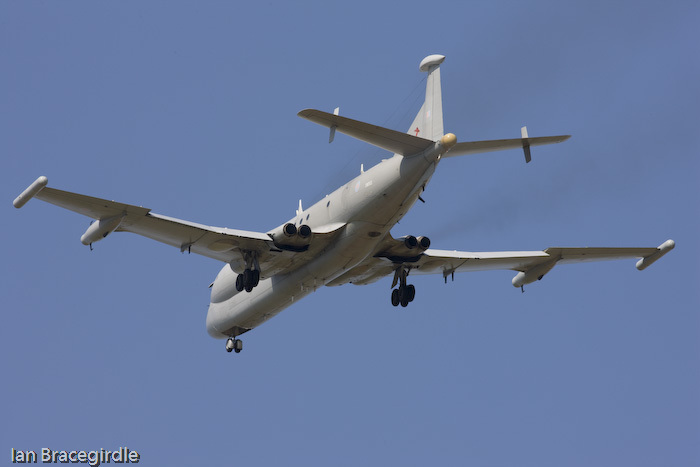 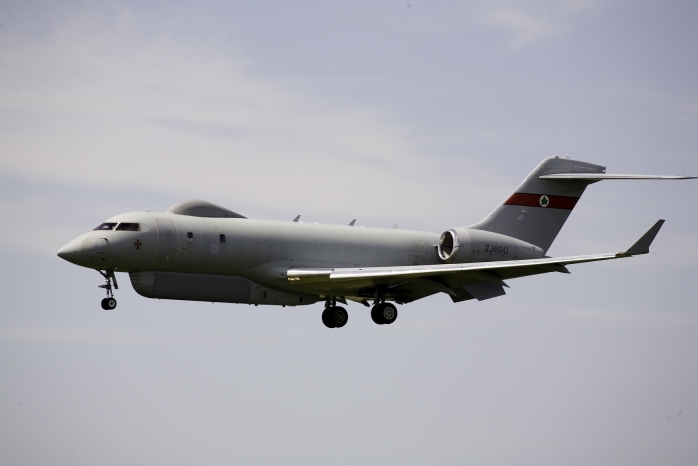 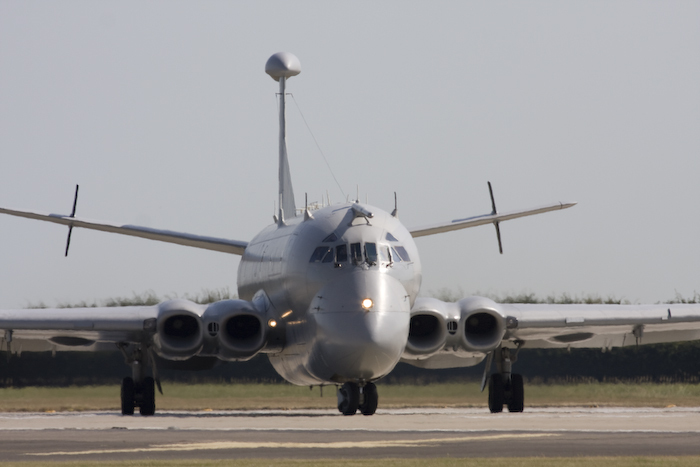 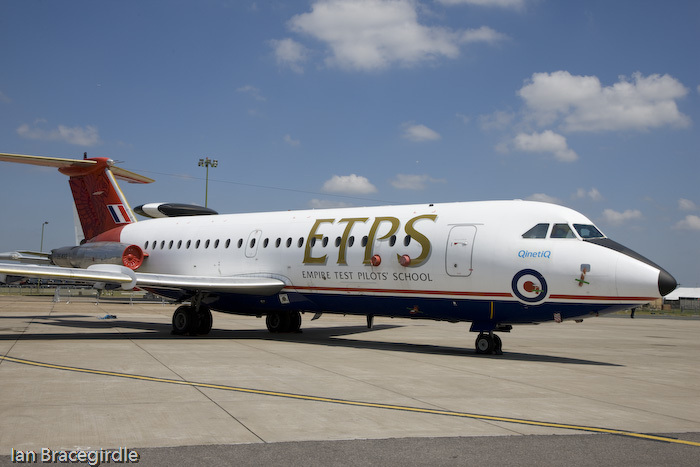 Throughout the afternoon aircraft were arriving to be positioned for the static line up, also a base Nimrod, Sentinel and E-3 Sentrys carried out their normal duties. 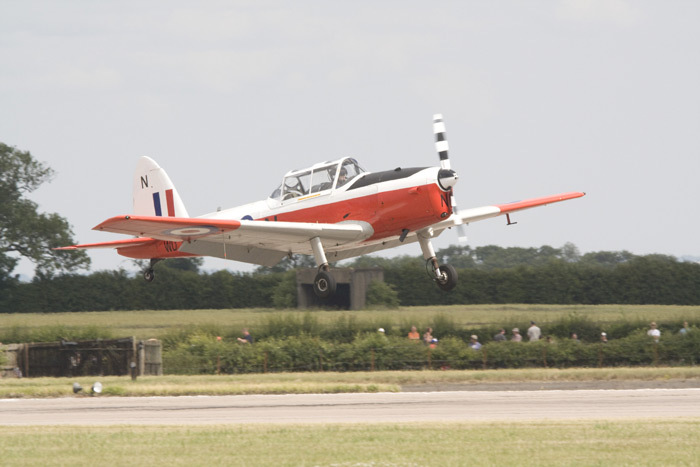 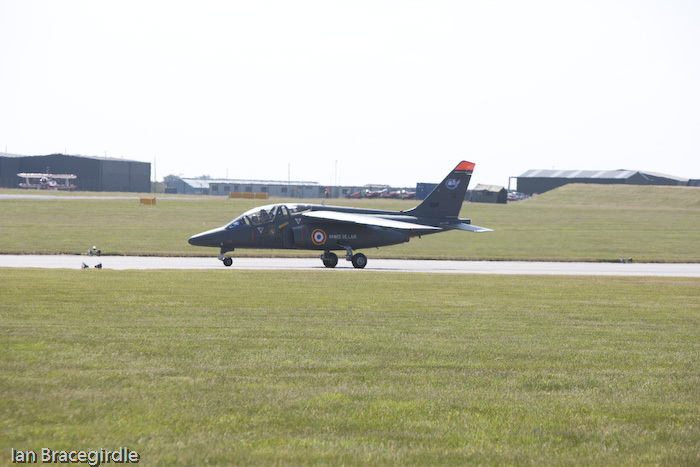 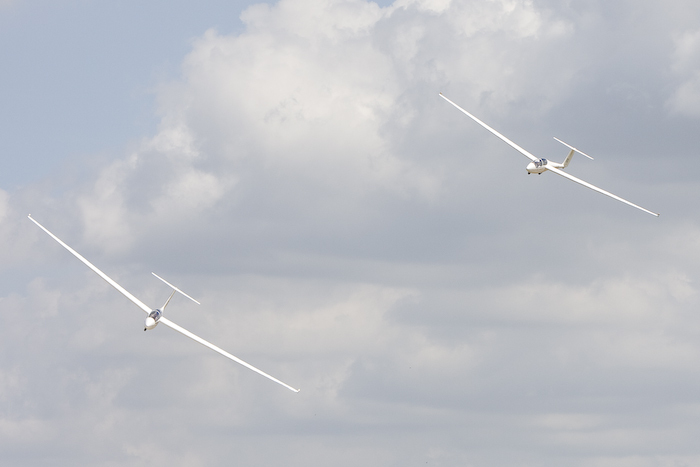 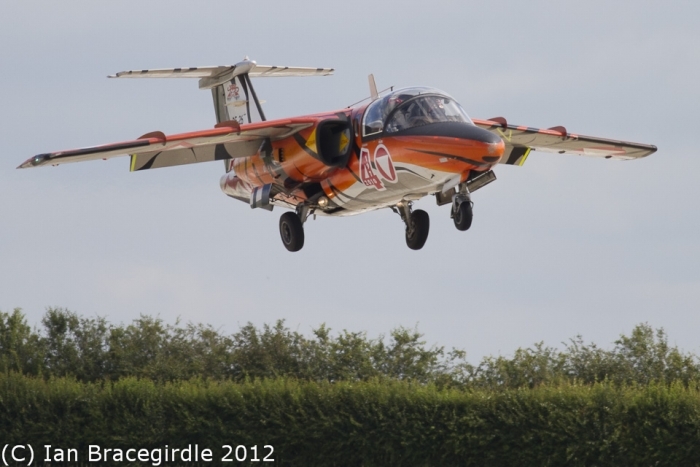 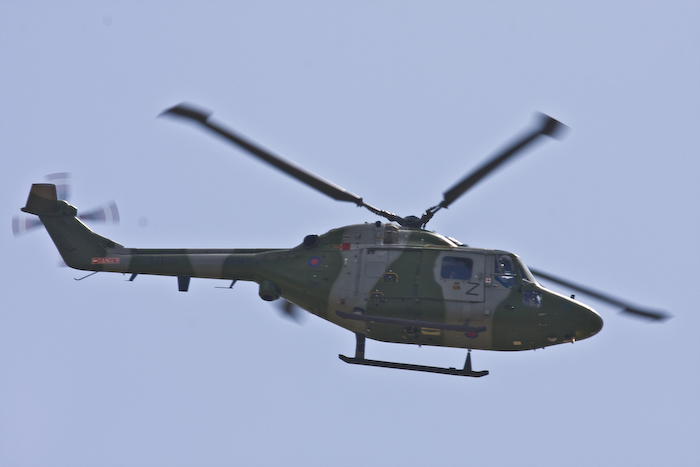 There was also a steady arrival of other aircraft that were carrying out their practice displays for the weekend. 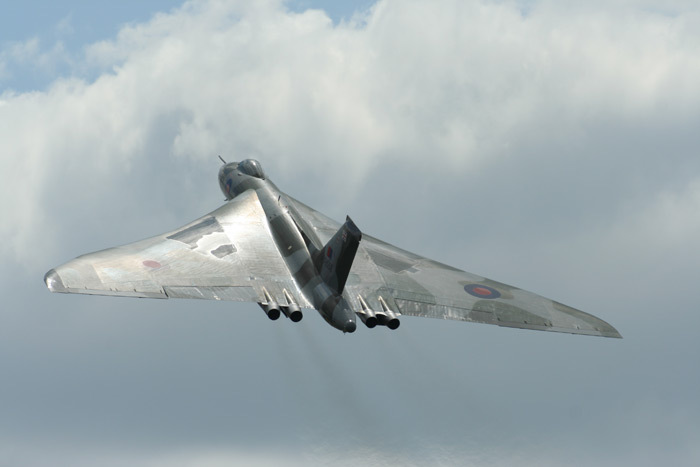 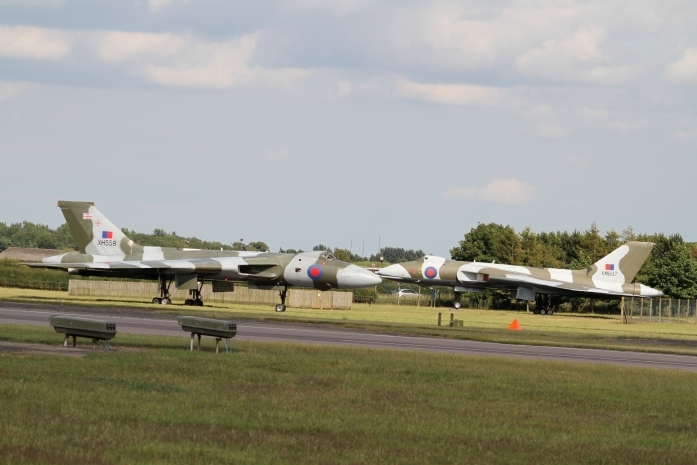 Including the Vulcan, The Blades, The Vipers, Team Guinot, a pair of Lakenheath F-15s and a Nimrod MR1. 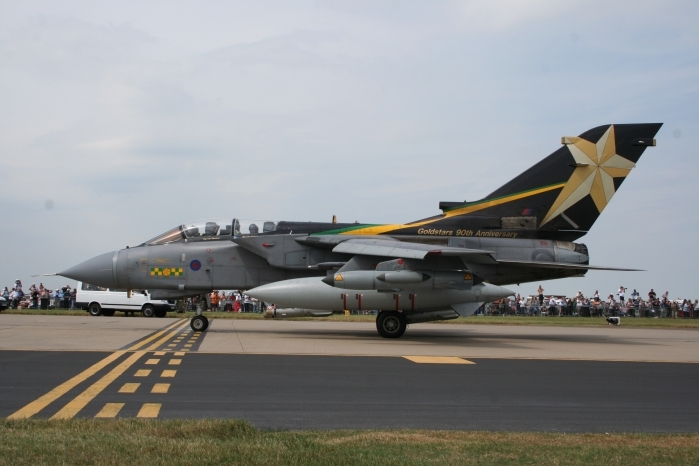 With Waddington Air Show severely restricted this year due to the bad weather, the conditions were not nearly as bad as 2007. 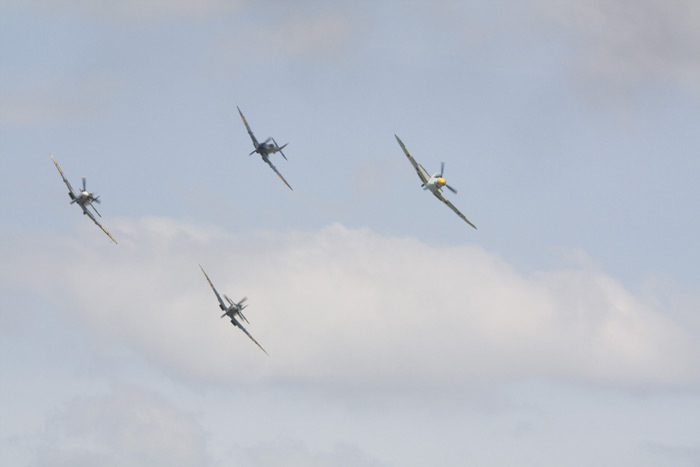 With low cloud and heavy showers it did have a knock-on effect on the flying and displays. 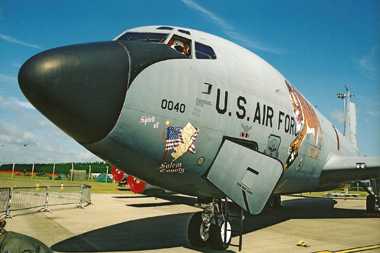 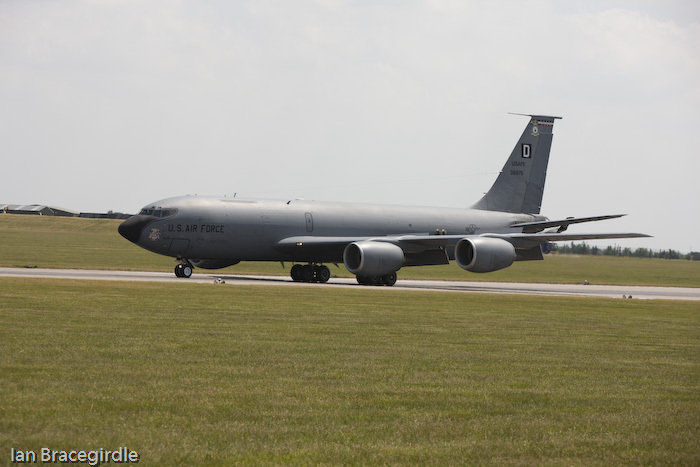 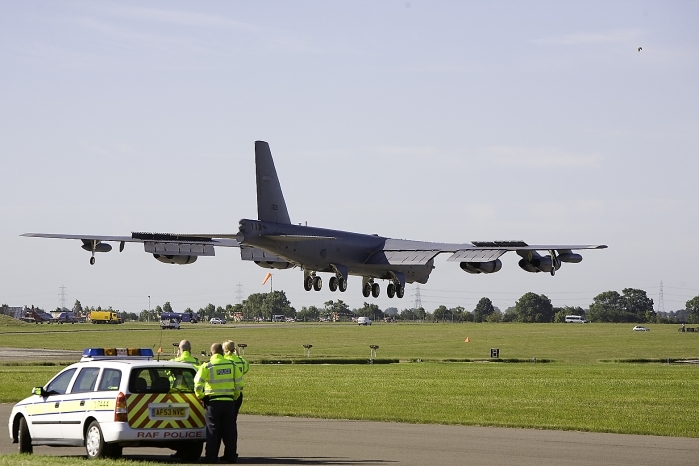 One visitor to Waddington was the B-52H Stratofortress, which was scheduled to fly but due to weather conditions was not able to get airborne. One thing that everybody had waited for was the sight and the sounds of the Avro Lancaster and Vulcan gracing the skies together overhead Waddington. 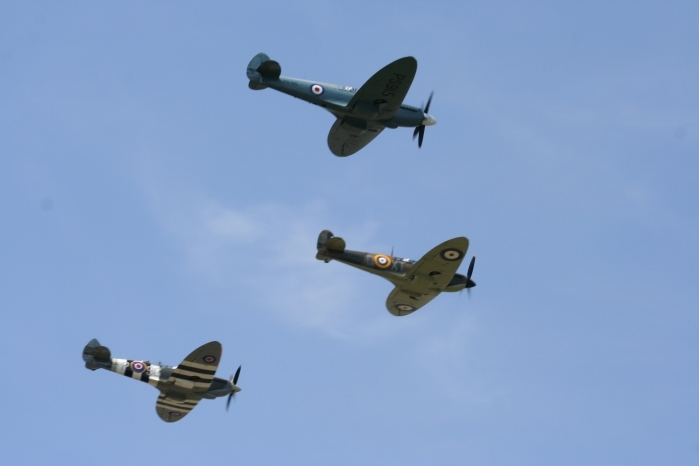 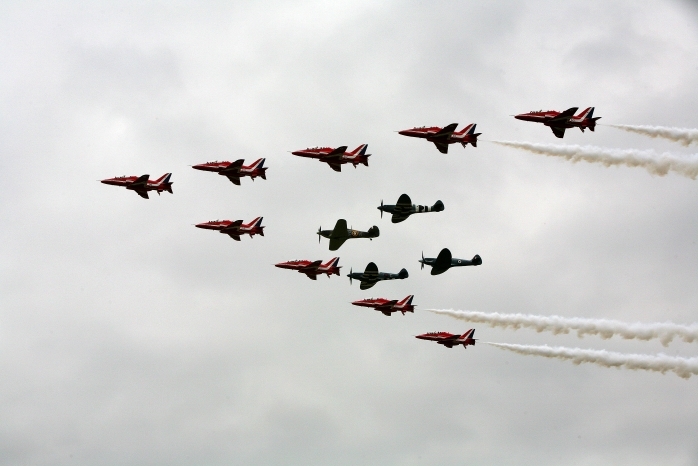 Another interesting combination was The Red Arrows in formation with three Spitfires and a Hurricane. 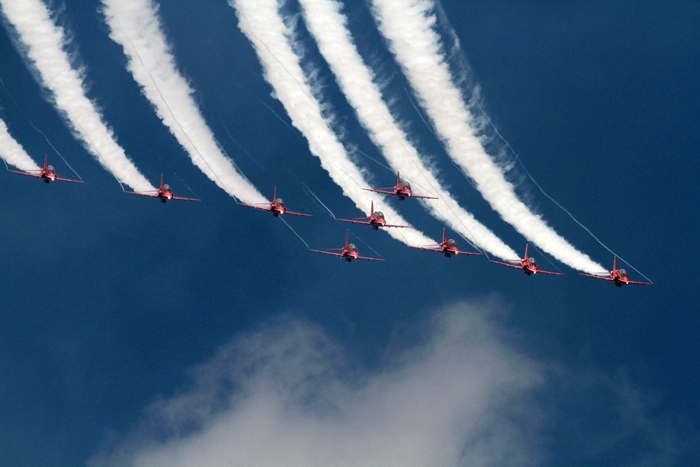 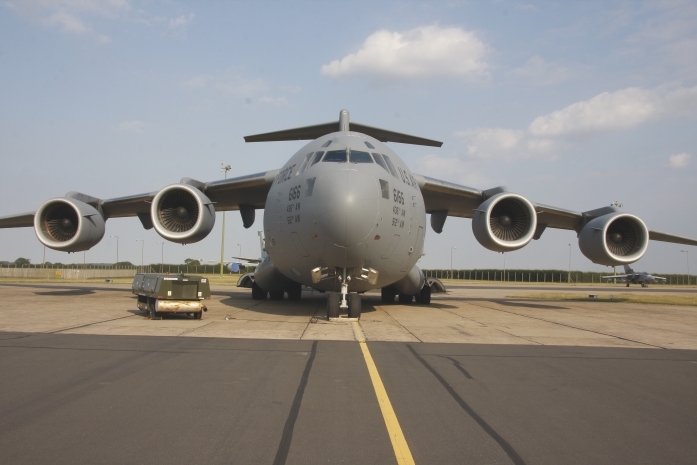 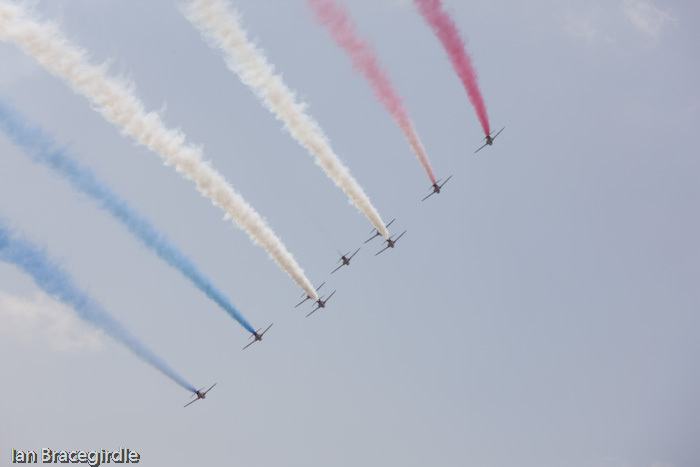 The twelfth International Air Show to take place at RAF Waddington was blessed with fine weather. 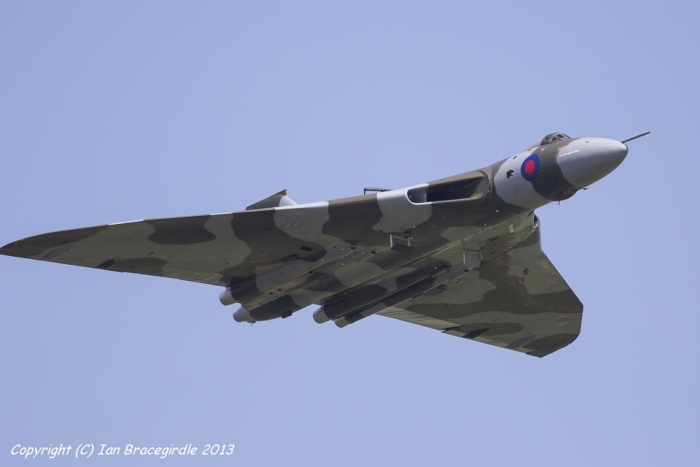 As usual the resident aircraft from Waddington were taking part this weekend. 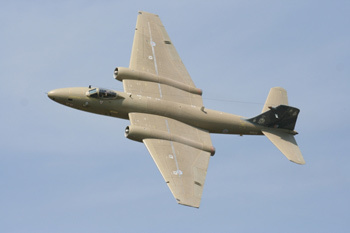 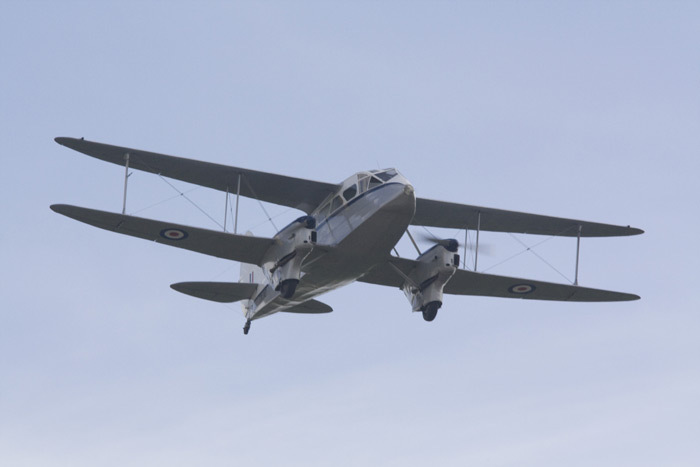 This year there was a farewell to the Canberra, with Squadron Leader Terry Cairns demonstrating this versatile aircraft. 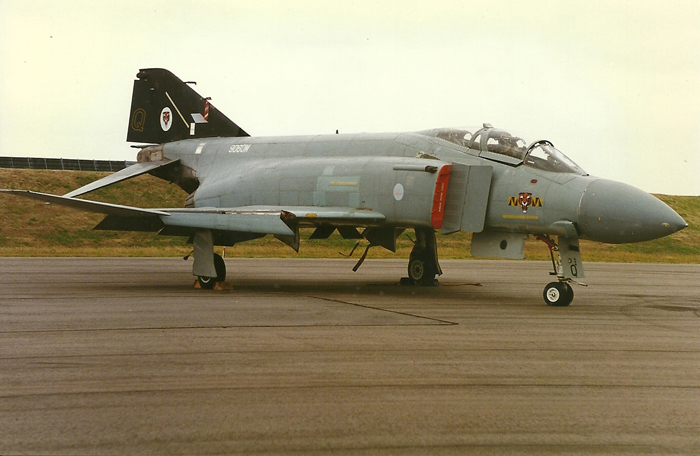 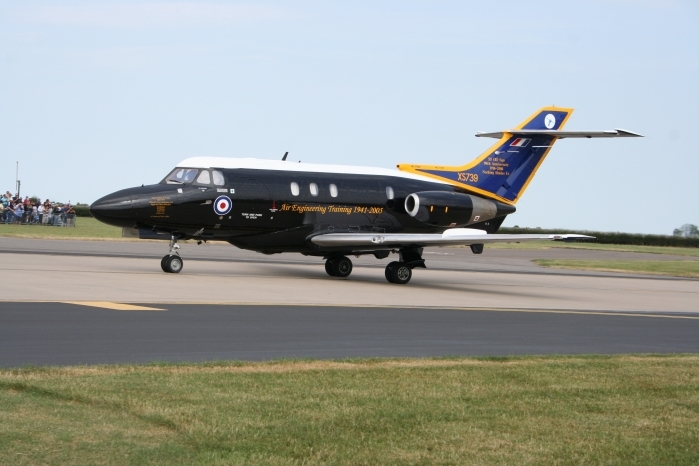 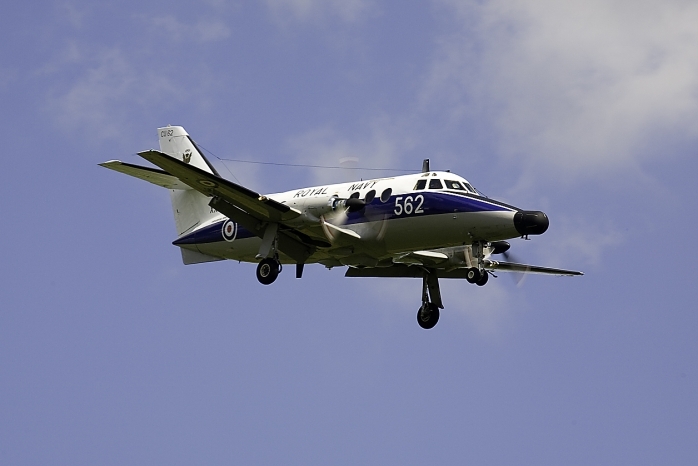 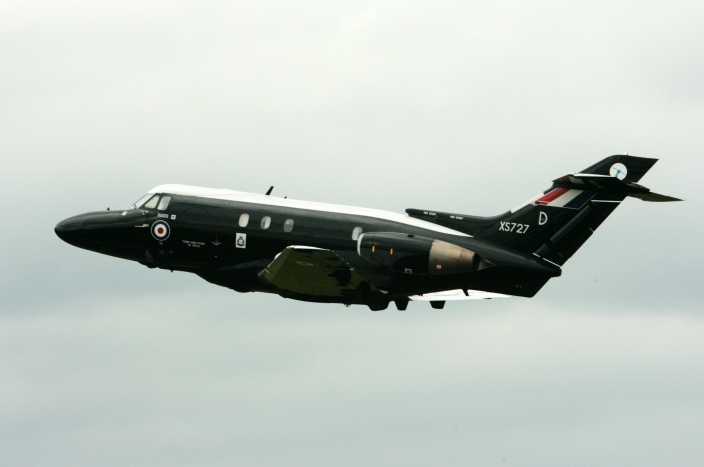 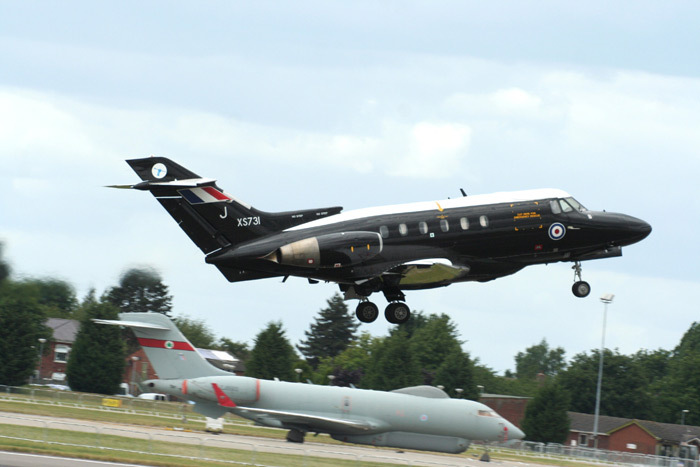 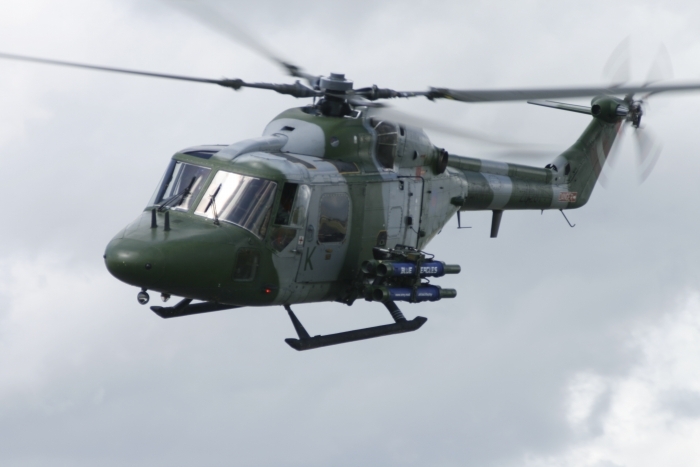 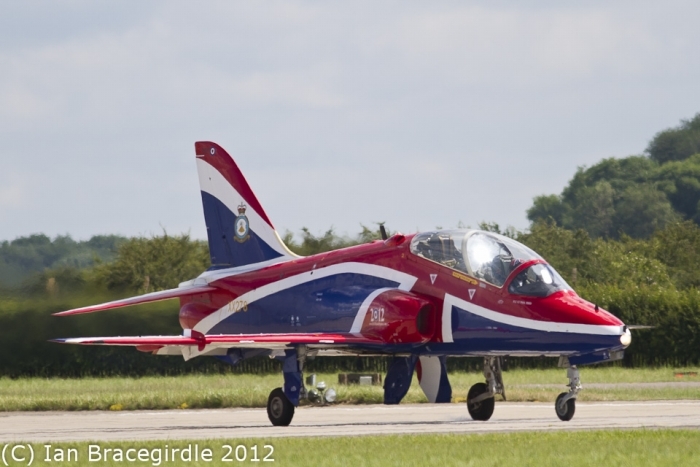 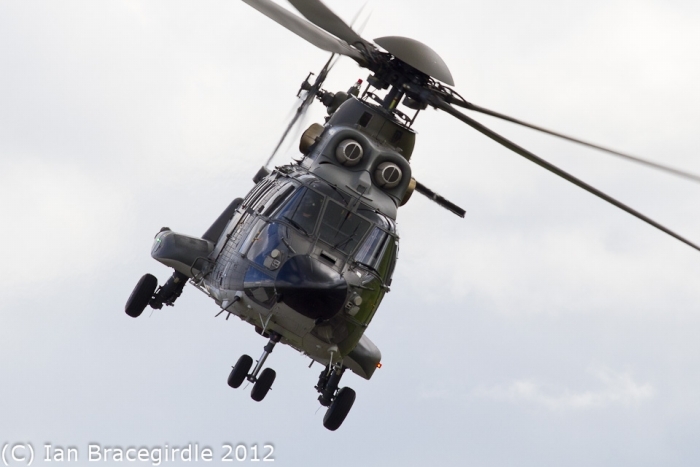 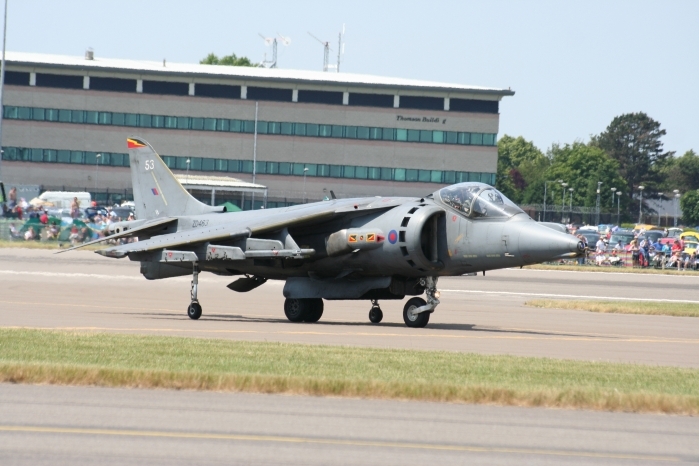 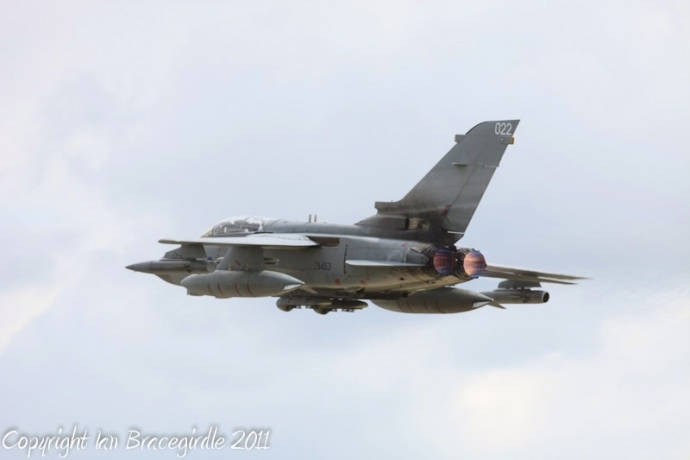 With not only the PR9 retiring this year, but also Terry is retiring in July when 39 Squadron disbands. 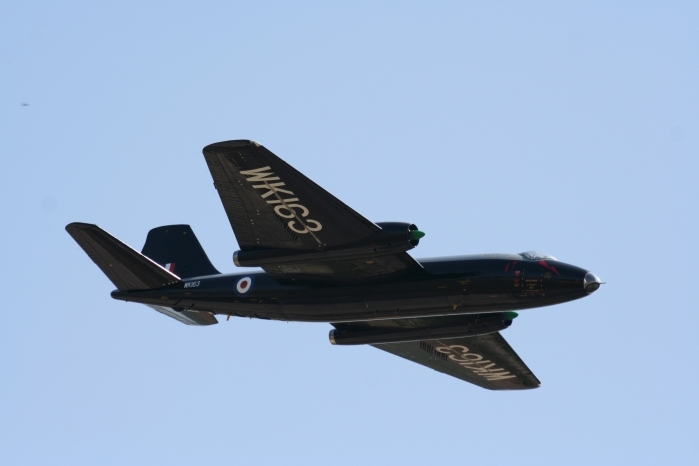 Also on the subject of Canberras, Classic Aviation's B2-6 put in an appearance in the capable hands of another 39 Squadron pilot, Squadron Leader Dave Piper. 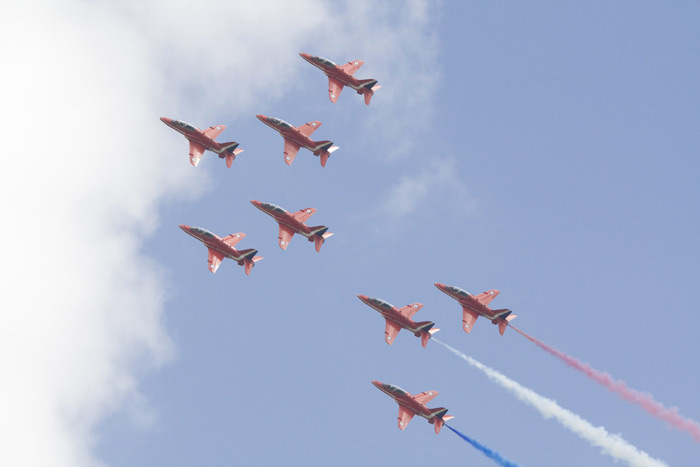 As usual there was a full flying programme, with a spirited display by the Royal New Zealand Air Force Boeing 757 and P-3K Orion, as well as The Battle of Britain Flight's Lancaster and a pair of Spitfires and finally the last display of the day, the Royal Air Force Aerobatic Display Team, The Red Arrows. 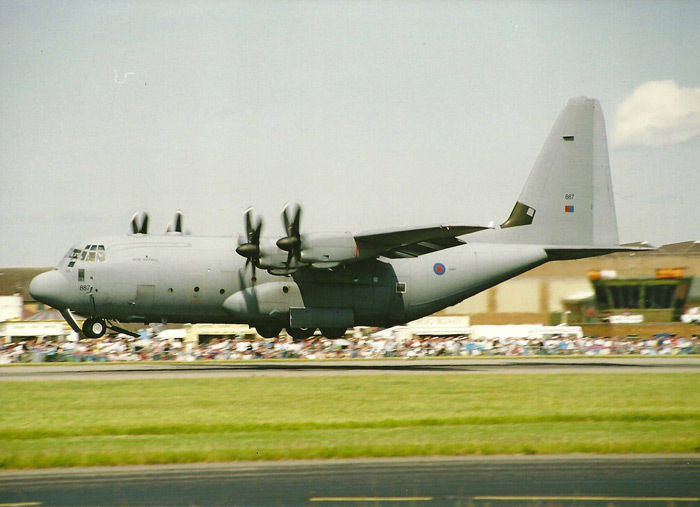 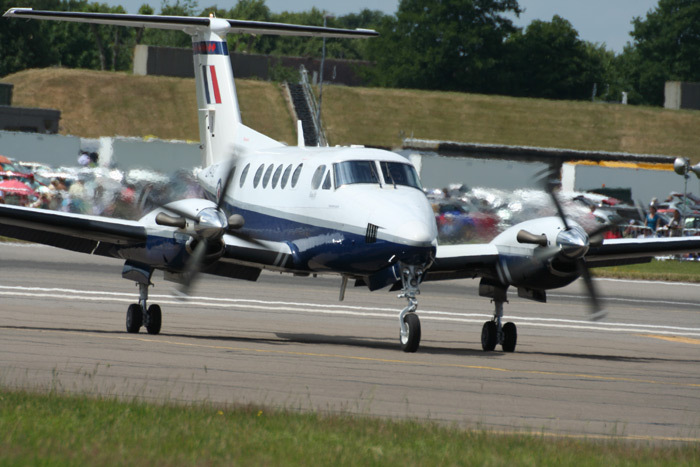 RAF Waddington Air Show 2003 has gradually grown in size over the last few years, with rare and interesting visiting aircraft arriving from around the world. 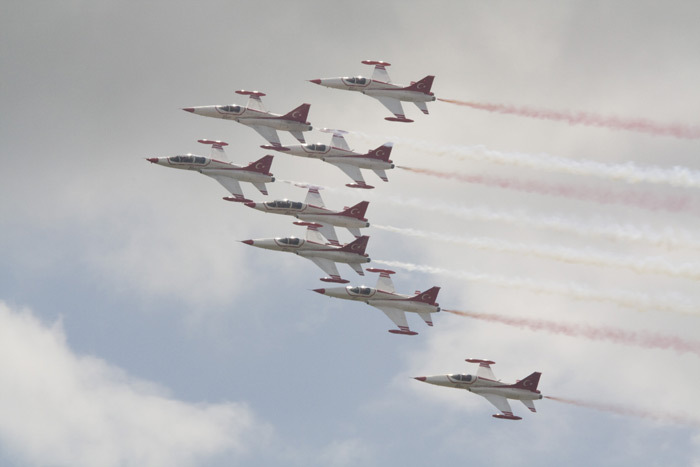 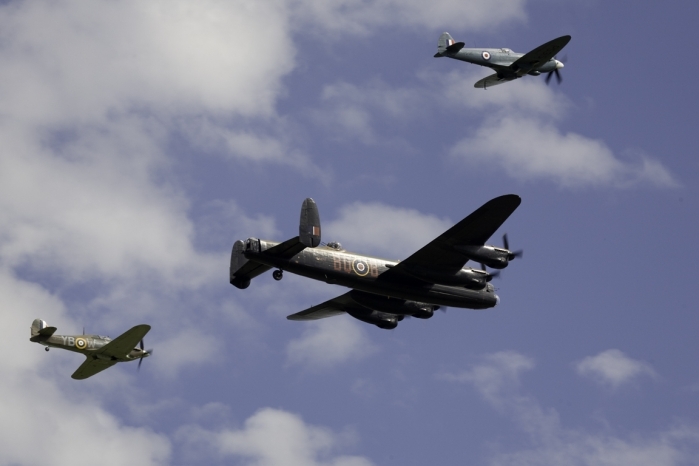 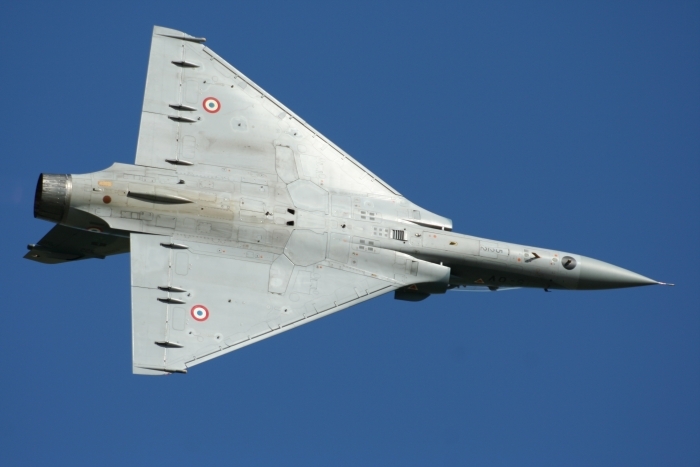 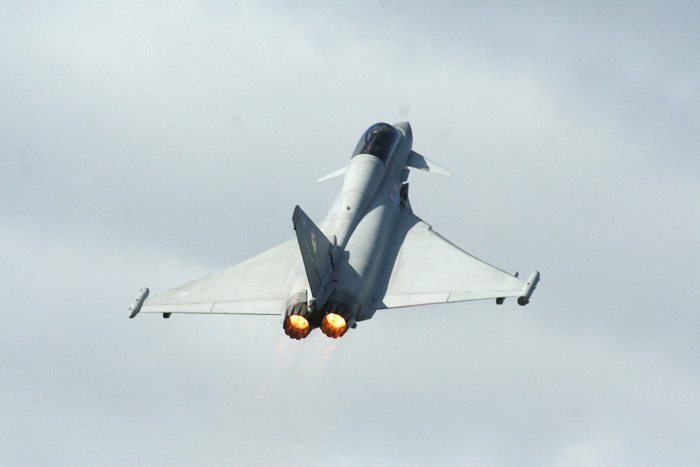 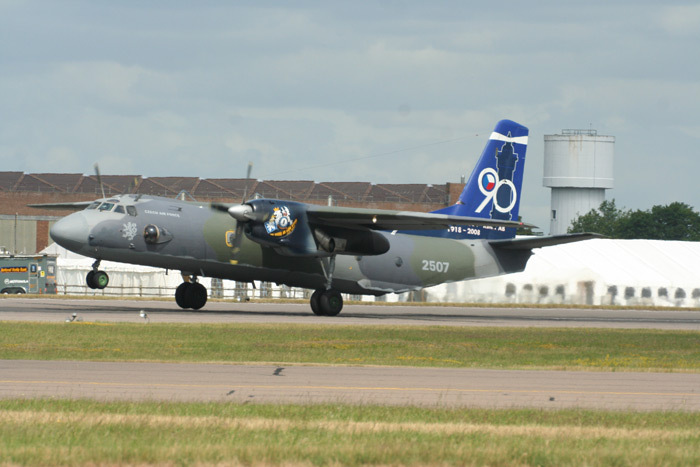 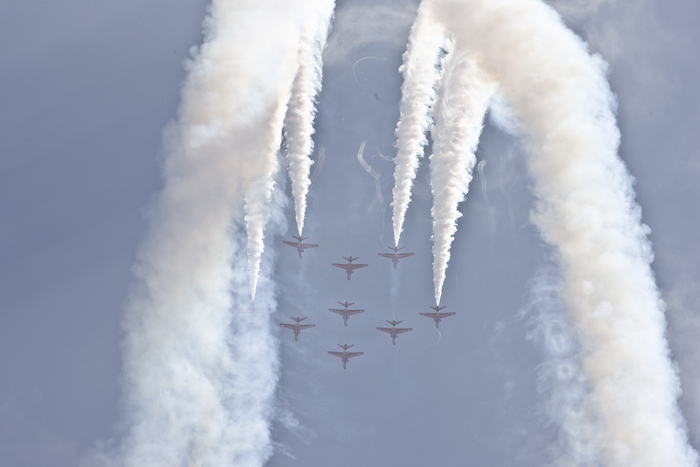 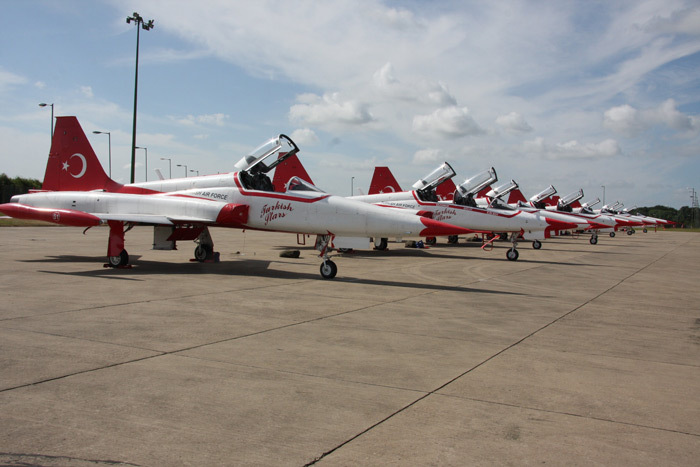 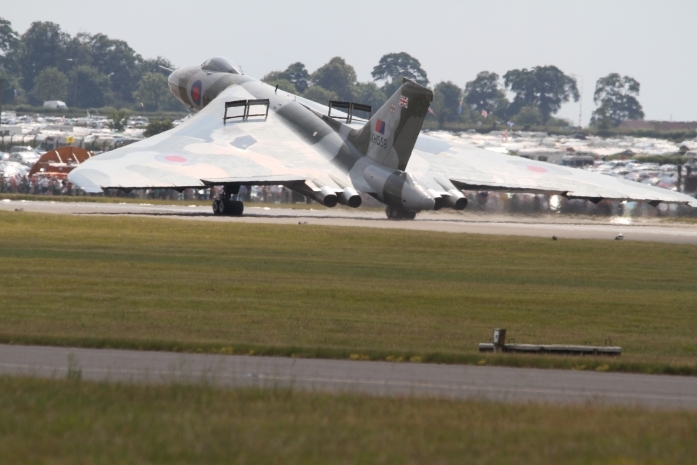 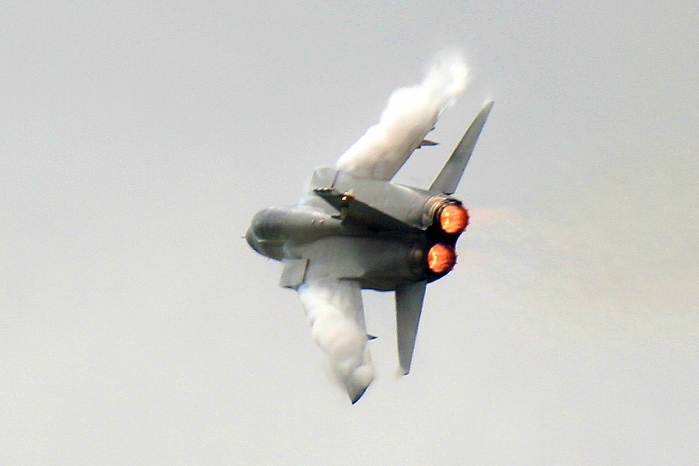 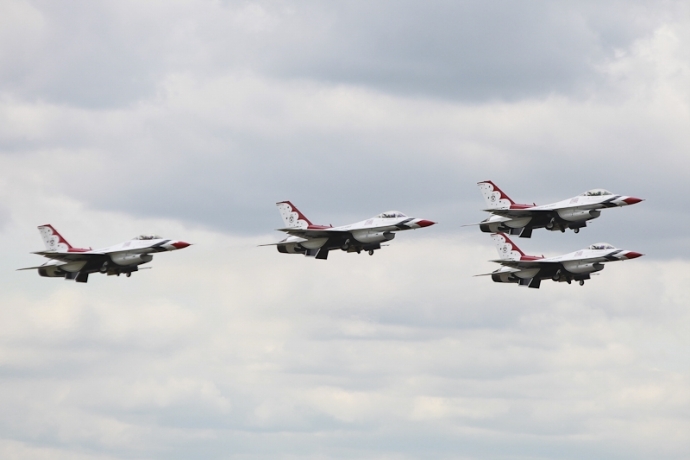 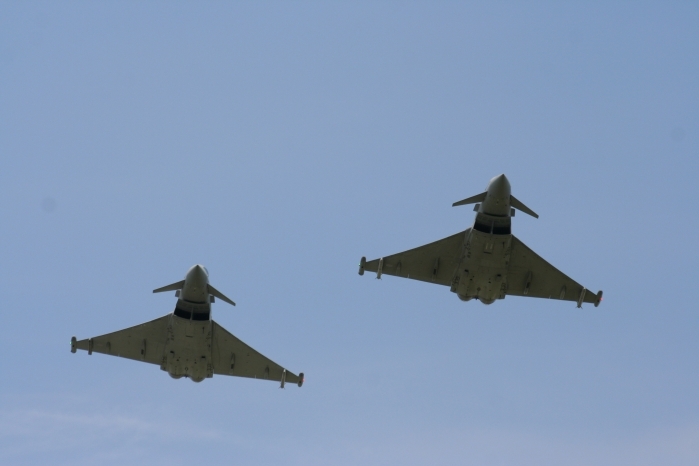 Waddington always attracts thousands of the visiting public over the two-day period. 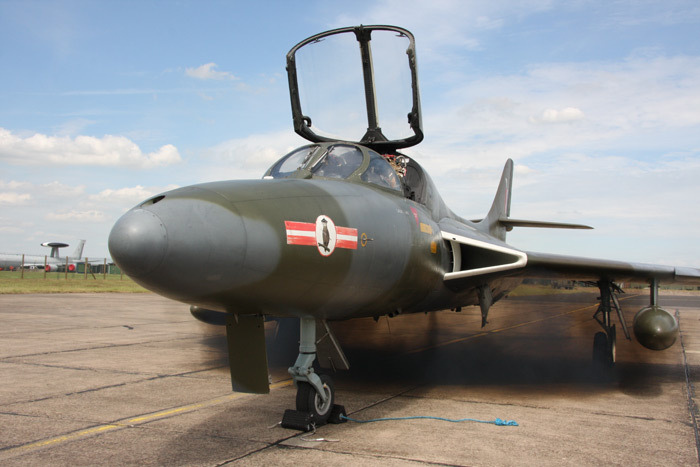 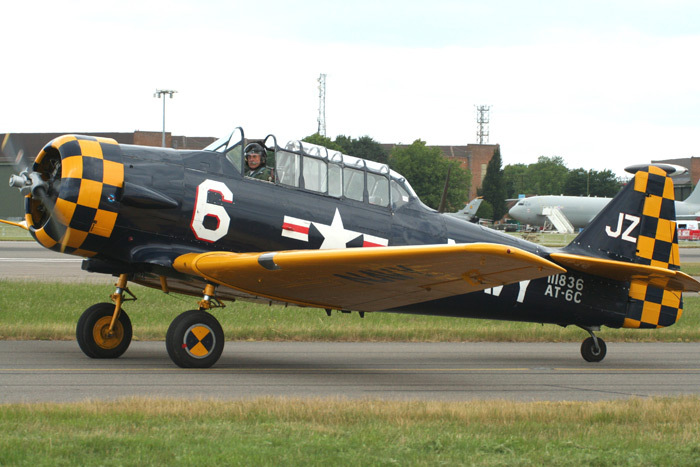 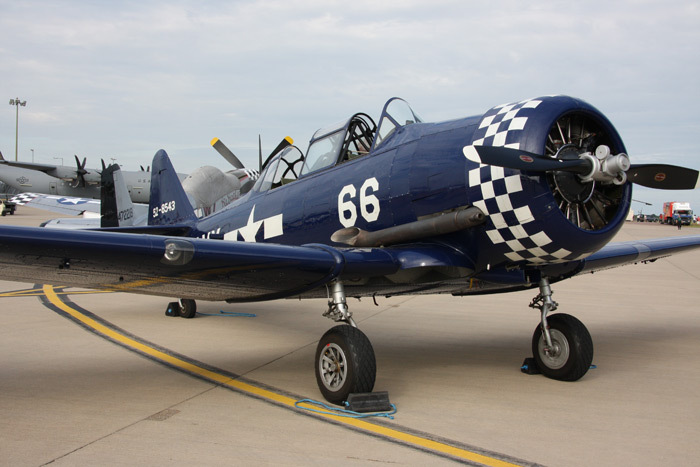 With high quality flying and plenty of aircraft on static display, and also many exhibits along the static line and in the hangars. 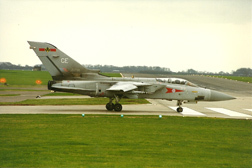 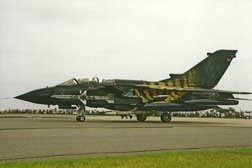 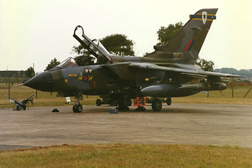 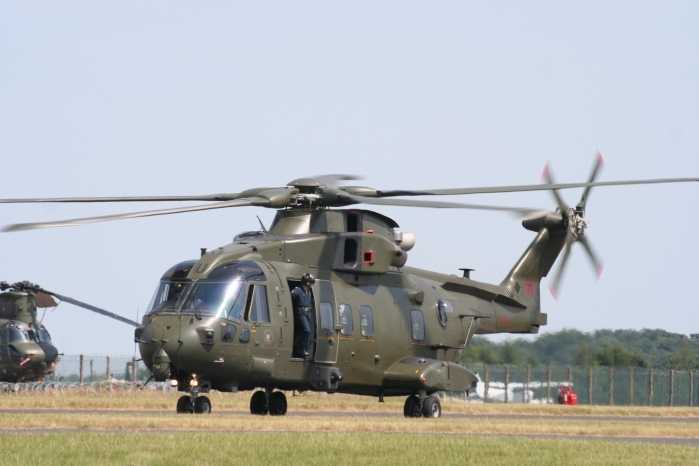 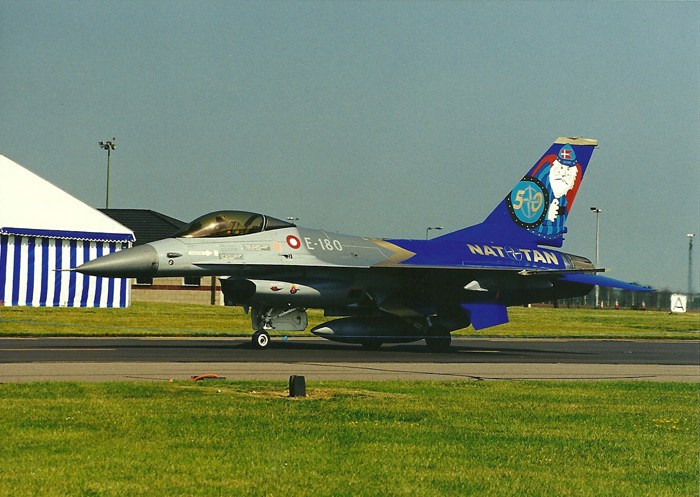 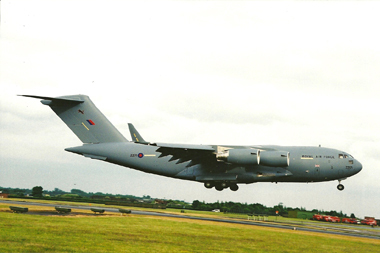 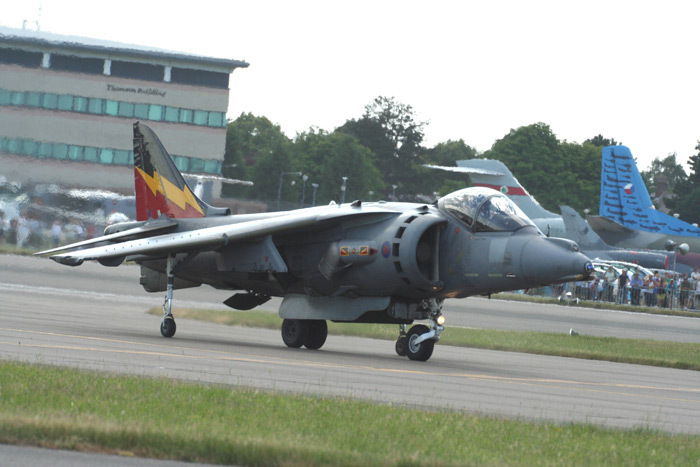 In April 1995 RAF Finningley closed and the RAF Air Show had to be relocated to its new home in Lincolnshire. 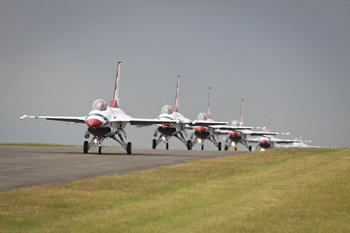 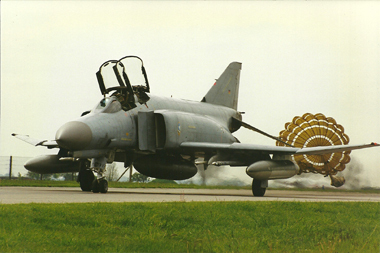 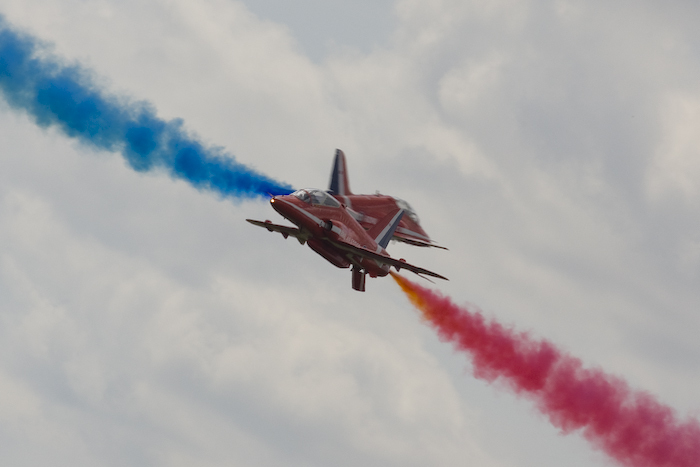 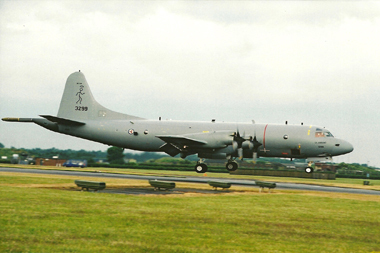 The air show was renamed the RAF Waddington International Air Show, which was Waddington's first air show. 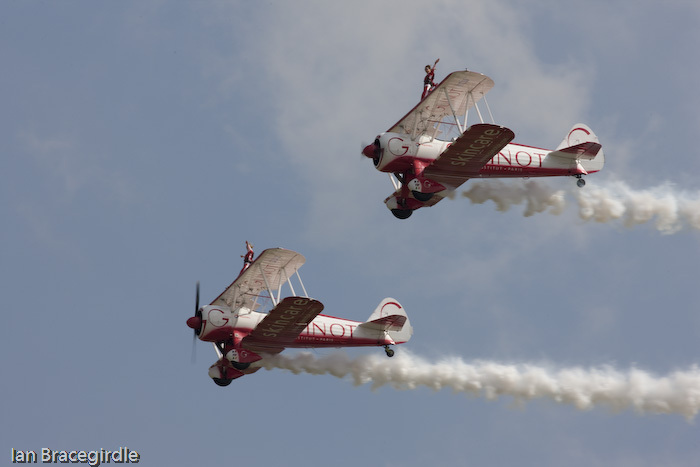 This had now become a two-day event, its main purpose was to raise money for charities. 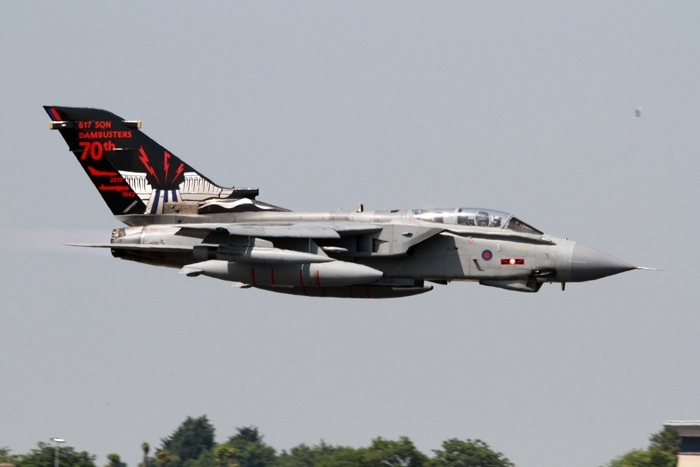 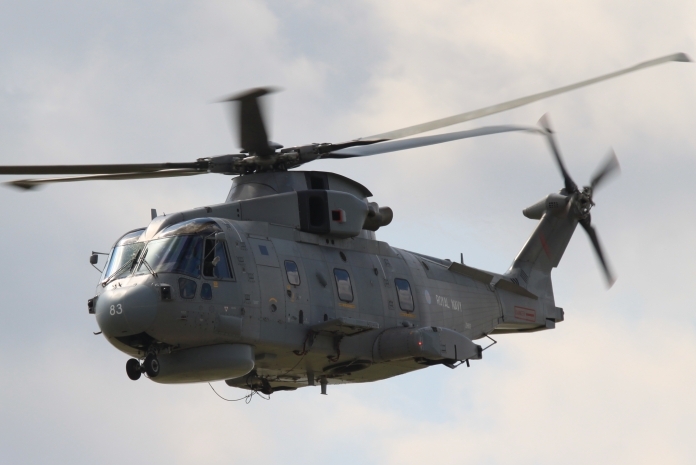 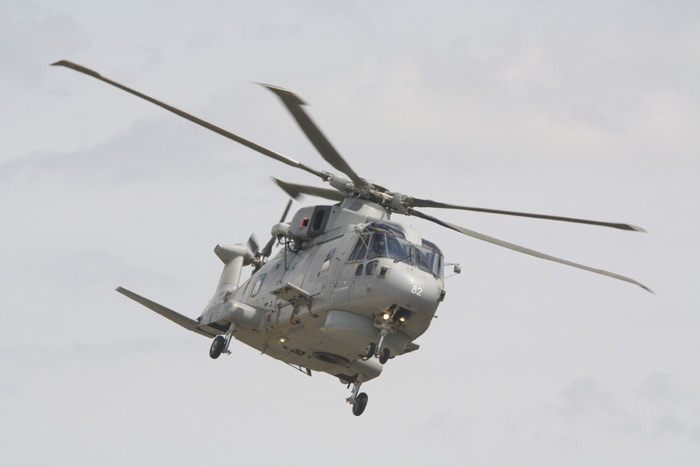 Proceeds from the air show are distributed to the RAFA Benevolent Fund and the RAF Waddington Charity Committee.